“Until One Has Loved An Animal, A Part of One’s Soul Remains Unawakened.” Anatole France -Nobel Prize Winner. OUR WONDERFUL ADOPTERS AND THEIR NEW FUR-KIDS! 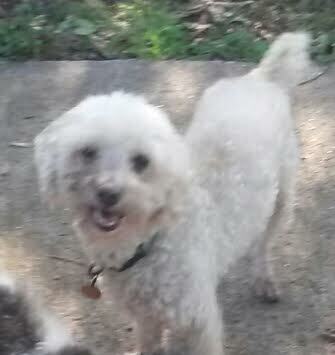 Brody is a white 7 year old toy poodle boy. He belonged to someone’s mother who died. The grown son took Brody into his apartment but his pup didn’t seem to like Brody so we were called to find him a great home! He is happy, carefree, and loves to run and play and take it all in with other dogs and his surroundings. He is not a barker and is a quiet, happy little guy just looking for someone to love him forever. ADOPTED!!! Max – Black Miniature Poodle Puppy Boy! 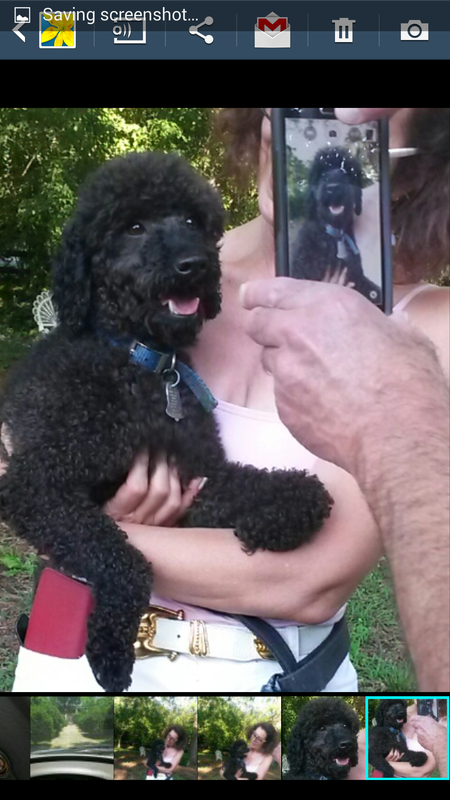 Max is a gorgeous black 1 year old purebred black miniature poodle puppy boy. He is an owner surrender because they realized three dogs were too much for them. Max is a very friendly and happy boy. 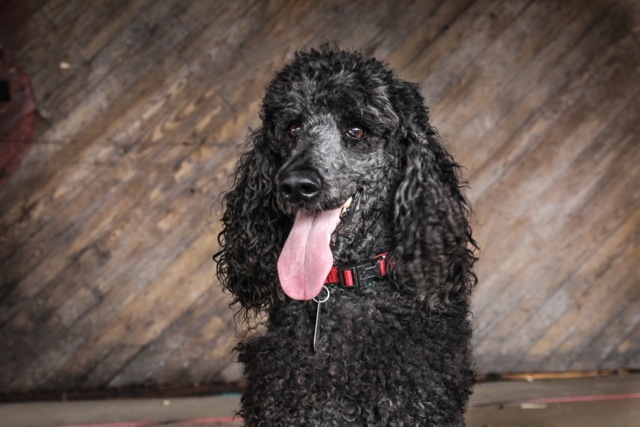 He loves to be with other dogs and with his humans….the classic poodle personality! He can scale a 4 ft high chain link fence just so he can be with you! He is waiting for his new family to find him and to call his own. ADOPTED!!! Max 2 – Minature Black and White Parti Poodle Boy! Max 2 is a black and white miniature parti colored poodle boy! He weighs 22 lbs and is very sweet and happy boy. He was a bit shy when he first came here but now he loves hanging with his doggy buddies and running around outside playing with them. His former owner’s work schedule became super busy allowing her very little time with Max so she asked us to find him a good home where they will love him and be able to spend quality time with him. Adopted!!! Tinkerbelle – Teacup cream toy poodle girl! ADOPTED!!! Nancy – Light Silver/White Phantom Marked Poodle Girl! Nancy is a beautiful light silver and white phantom marked toy poodle girl weighing 7.2 lbs and who is 2.5 year old as of June 2015. She and her sister were brought to animal control by their breeder because their breeder’s eyesight was failing. Nancy is a cute and happy little girl who likes to run and chase the ball and be with you of course! She is looking for her forever home. Will it be yours? 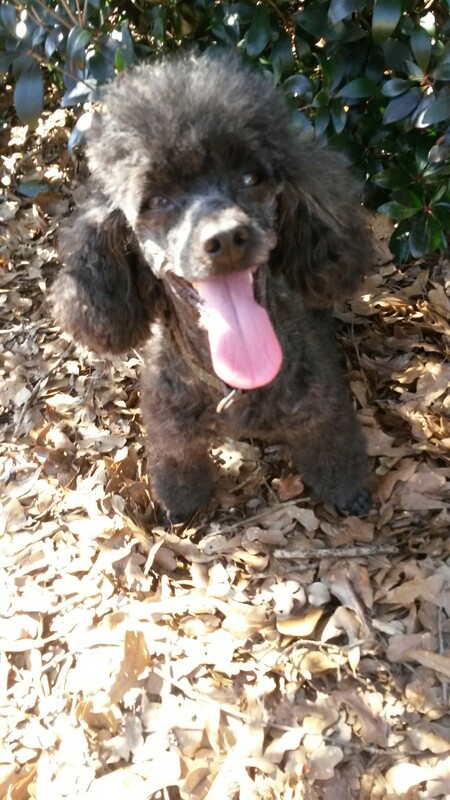 Turner is a young adult black miniature poodle boy with shorter legs. He was found as a matted stray by animal control and tested heartworm positive. Animal control asked us to take this handsome little guy in. We are using the slow kill method of giving him monthly heartworm prevention. He also will be neutered and microchipped and will be updated on vaccines. He came to us scared but it flourishing into a lovely little personality! He loves play with other dogs and exploring outdoors with them. We are teaching him his basic obedience commands and how to walk on a leash. ADOPTED!!! CRICKET – Cafe au Lait Standard Poodle Girl! 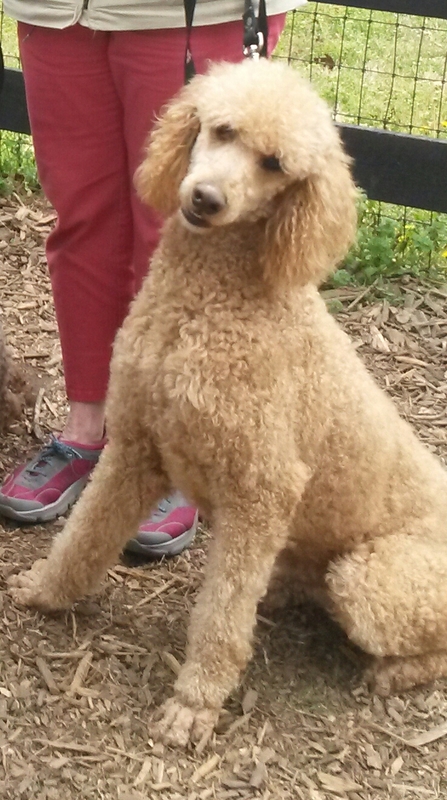 Cricket is a beautiful 3 year old cafe a lait female AKC standard poodle girl turning 4 in November 2015. She has a white bib on her chest and white toes on her front feet. Her family was moving for their jobs in another state and now have a different schedule that won’t allow enough time to spend with her so they asked us to find her a good home with someone who can give her more time. She is well behaved, a love bug, and just wants to be with you and be loved by you for the rest of her life. Very nice dog! Adopted-!!! Winston – Cafe au lait/brown toy poodle boy!!! Winston is a toy cafe au lait/brown toy poodle boy who weighs about 10-12 lbs. He came to us from an owner who loved him but had medical issues, could no longer care for him, and asked us to find him a good home. Winston is a playful, happy little guy, gets along well with other dogs and also with people! He would be perfectly content sitting in your lap with you talking to him telling him he is a good boy or running outside and playing with the other dogs. He also loves playing with toys! Chance is a handsome 1-2 year old blue miniature poodle boy weighing 21 lbs. 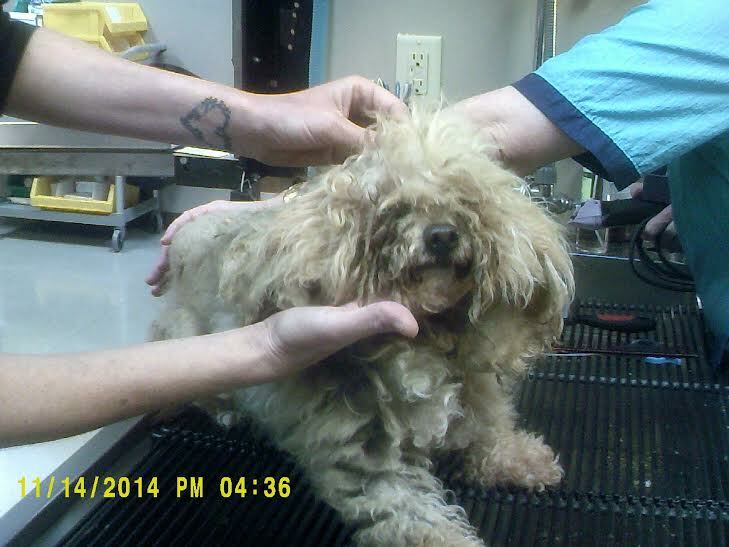 He was found as a very matted stray with a big hot spot under all that matting by animal control. We were called to pick him up and we had him vetted, neutered, vaccinated, treated for the hot spot (which is healing nicely) and heartworm tested. He did test heartworm positive but has no symptoms and at his young age it has to be a recent occurrence. We are using the slow kill method by giving him the appropriate monthly heartworm medicine. Chance has a wonderful, relaxed, and happy personality, loves other dogs and loves people! 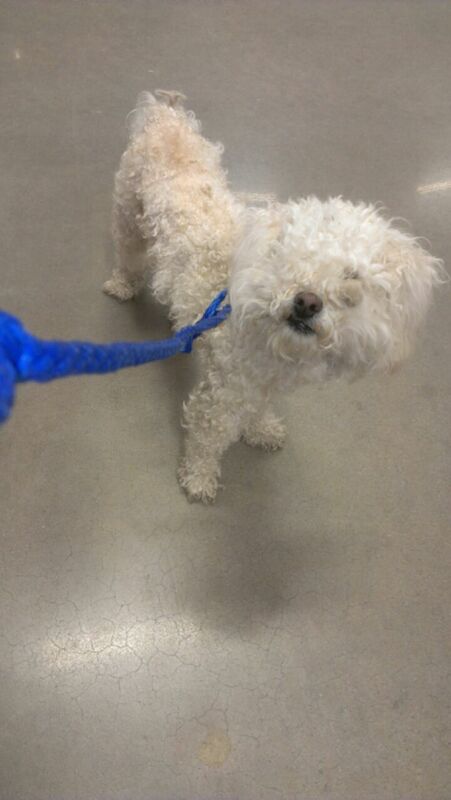 Ginger is a 10-12 year old white toy poodle girl. Her owner, who recently died, was wheelchair bound and Ginger learned to jump into his lap and on his bed. 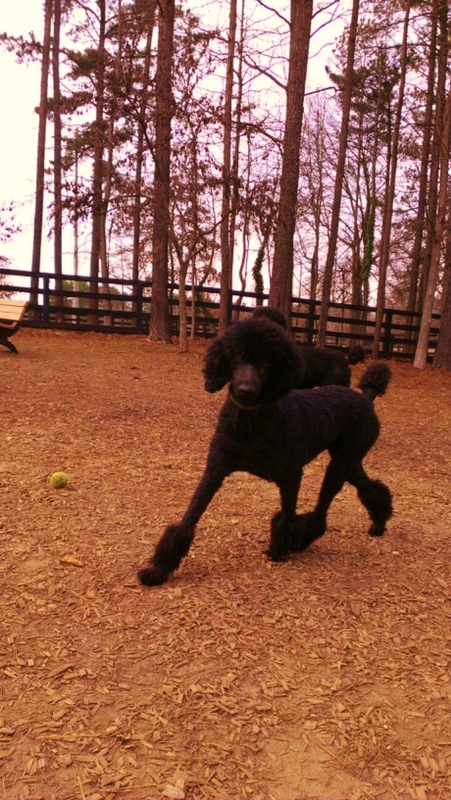 STANDARD POODLE BOY Houston is a jet black male very sweet standard poodle boy. He was abandoned as a youngster in his backyard along with his brothers and sisters by an AKC breeder. Houston was born about 6/6/09 and came together with his sisters Connie and Frances. We have tested them and it is okay for them to be adopted separately. Connie and Frances were recently adopted in 2014 and now it is Houston’s turn to find a good home! Houston has a very sweet and kind personality and loves to play with other dogs as well as be with his people. Ever since we have opened this rescue in 2009, we are proud to say that our dogs have always come updated with their vaccinations (many times with a 3 year rabies vaccination), DA2PP, Bordatella, heartworm tested negative, spayed/neutered, sometimes have a dental if needed or as resources allow, flea/hw prevention, trained, microchipped, dewormed, socialized with people and animals and lifetime free training and nutrition advice. Our adopters are very happy with the dogs they adopt from us and many times come back to adopt a second dog from us! Our standard poodles require a five foot minimum safely fenced yard unless otherwise listed. Marley – Black and White Parti Poodle Girl! Marley is a beautiful 5 year old black and white parti standard poodle girl. She has a wonderful, loving, and gentle personality. 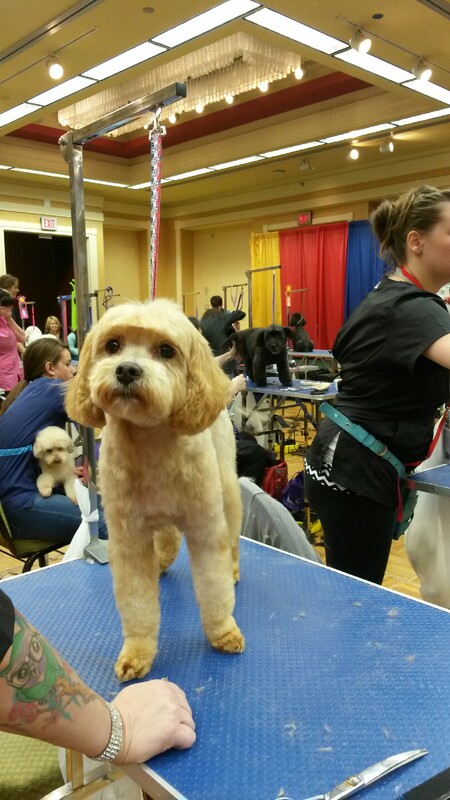 She just took 5th place in a grooming contest where 50 groomers competed against each other. She came to us very unsocialized with people and with pets from someone who purchased her from a breeder. We discovered that Marley’s vocal cords had been cut and she only has a whisper of a bark. Marley has learned to play with other dogs, greet people, and is familiar with our routine. She is still a bit hesitant but once she gets to know you will not harm her, she becomes a wonderful standard poodle to you. She has come a long way with her progress and deserves a loving permanent home to call her own. Adopted!!! – Millie The Mermaid – AKC Black Standard Poodle Puppy Girl! Meet Millie the Mermaid, an AKC 8 month old standard poodle puppy girl weighing about 40-50 lbs as of December 2014. . Millie’s family has a child with cancer and the expenses were too much and not enough yime gor Millie and no fenced yard so they asked us to find Millie a family with a fenced yard and playmate who could spend more time with her. Millie is in foster and is being shown to a family who already had an approved application on file. If that doesm’t work out, Millie will be available for adoption. Adopted!!! – HARVEY – SILVER STANDARD POODLE BOY! 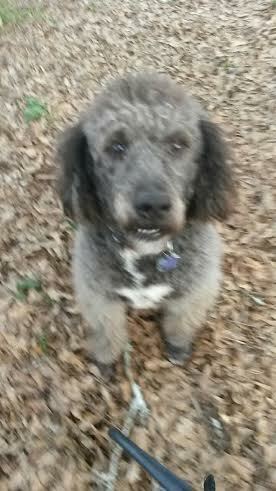 Harvey is a handsome standard poodle boy weighing about 60 lbs and is 4 years old as of December 2014. His owner died and he came together with a female aussiedoodle named Laurel. Laurel was recently adopted and now it’s Harvey’s turn to find his forever home! Harvey is a very relaxed and easgygoing boy. He gets along with small and large dogs. He is a smiley boy and likes to walk with you outdoors and be with you no matter what you are doing………normal poodle behavior! He is quiet and a good boy! Wouldn’t you love to have this silver boy! He is updated on his vaccinations and tested heartworm negative recently. 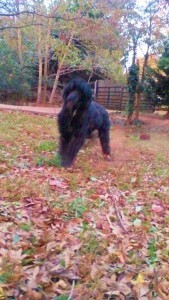 Connie is a young jet black female very sweet standard poodle girl. She was abandoned as a youngster in her backyard along with her brothers and sisters by an AKC breeder. Connie was born about 6/6/09 and came together with her sister Frances and her brother Houston. Frances was adopted November 2014 and now it is Connie and Houston’s turn to find good homes! She has a very nice personality and loves to go outside with you and explore and run around. She gets along very well with other dogs and would be a wonderful dog to someone. She is accustomed to having other dogs around her. We updated her on her vaccines, heartworm tested her, and spayed her. Connie has been taken on several meet and greets and was almost adopted but then the adopters senior relative died and left them three senior toy poodles to take care of. We have tested them and it is okay for them to be adopted separately. Ever since we have opened this rescue in 2009, we are proud to say that our dogs have always come updated with their vaccinations (many times with a 3 year rabies vaccination), DA2PP, Bordatella, heartworm tested negative, spayed/neutered, sometimes have a dental if needed or as resources allow, flea/hw prevention, trained, microchipped, dewormed, socialized with people and animals and lifetime free training and nutrition advice. Our adopters are very happy with the dogs they adopt from us and many times come back to adopt a second dog from us! Our standard poodles require a five foot minimum safely fenced yard unless otherwise listed. 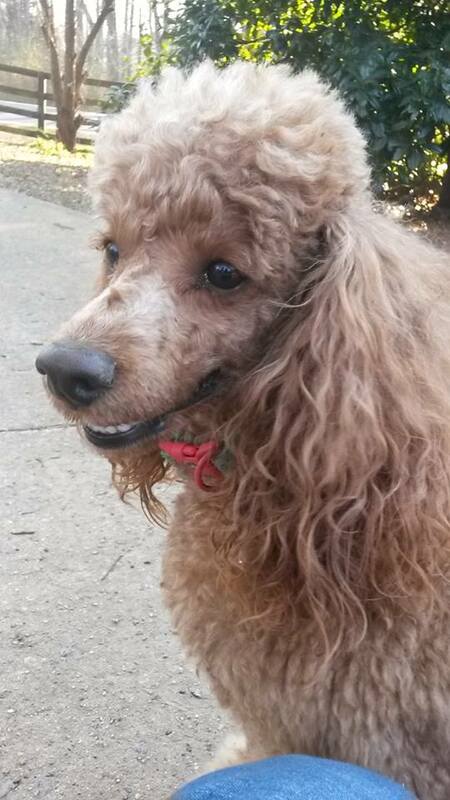 Zuni is a beautiful red miniature poodle boy who was surrendered to us to find him a good home. He weighs about 18 pounds and was born 12/24/11. His first owner purchased him from a breeder as a “toy” for her kids to play with. They gave him no training nor structure and let the kids do what they wanted. Zuni began growling at the kids as this was his only defense due to the parents not protecting him. His original owner was going to euthanize him and his second owner saved him. The second owner had several teacup toy poodles that didn’t get along with Zuni, who was larger than their poodles. Zuni wanted to play with the dogs but the dogs did not want to play with Zuni and the little dogs began growling at him. Zuni’s second owners sadly gave him up and asked us to find him a good home. Zuni is friendly and playful and is a handsome little boy. He is ready to go to his new home. 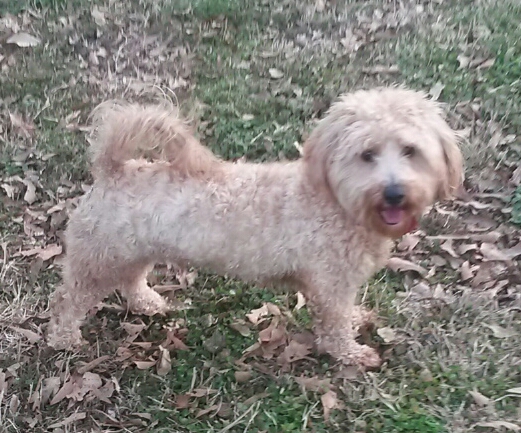 Dudley is a very pretty apricot bichon/poodle mix. He weighs about 20 lbs but it is all muscle and he is a toy size in height measuring only about a foot high! He has an exquisitely happy and playful personality and is very easygoing! He gets along super with other dogs and loves playing with them and fetching the ball. He came to us from a family who purchased him for their 14 year old son. The 14 year old son had a very busy baseball and church schedule and did not have time to potty train Dudley. Dudley spent from 12-14 hours in a crate and pottied in the crate. They contact us asking us to find him a good home. Dudley is now potty trained and goes out several times a day with the other dogs. His adopter must not use a crate for him as he does not like it. 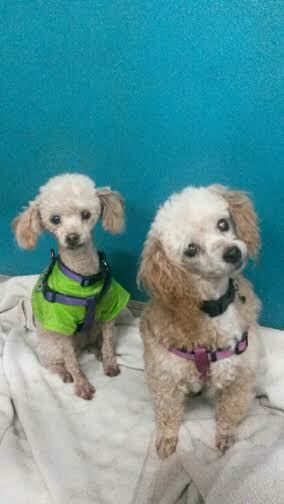 Greta (picture on left) and Garbo are two darling small toy poodle girls only weighing 6.2 and 7.3 lbs. Greta is about 5 years old and Garbo is about 8 years old. They are a bonded pair and need to be adopted together. They may be mother and daughter. They were found as strays on a very cold day, no one claimed them at animal control, so we were called to take them into our program and find them good homes together. They are very sweet little girls and well behaved. Greta is content sitting on your lap, even while you’re working, and Garbo takes all the stuffed animal toys and arranges them all around her in her doggy bed. It’s the cutest thing! Lilly is a darling 7 lb white, 3 year old poodle/shih tzu mix. Her former owner purchased her at 6 weeks old from someone selling puppies. She brought Lilly to daycare to be socialized with other dogs but she just sat there and the daycare workers did not know how to engage her with the other dogs. She gave Lilly lots of love and spoiled her but Lilly also needed a certain type of pack leadership training, which many people do not know about. Lilly is scared of other dogs and does not know how to play with them. She doesn’t know what to expect when a dog comes up to her to play, is scared, and tries to ward them off with a warning. We are working on her socialization skills with other dogs. Lilly is absolutely wonderful with people, loves to be held, and gives kisses. She is a darling, very cute, and very soft little girl that needs the right person who will help her not be scared of other dogs. Lilly has made a lot of progress since she has been with us and now will eat out of the same bowl with another dog and run outside with them and let them sniff her. Adopted!!! Ringo – Cream Toy Poodle Puppy Boy! Ringo is a very cute cream toy poodle boy puppy weighing about 9 lbs. He was born 5/26/14. He came to us with a broken front paw which has healed months ago! He is now our fastest running little guy with the biggest loving personality which comes with many puppy kisses! His original owner purchased him from a breeder and when she came home Ringo jumped out of her arms and broke her leg. She brought him to a veterinarian and they gave her a choice of paying over $1000 for his surgery, which she couldn’t afford, or euthanasia. The vet mentioned nothing about rescues or other options. She sadly brought Ringo home with her and called a vet tech friend who immediately called us. In 2014, we brought Ringo to our vet who also works with broken bones, she reset Ringo’s leg and for several weeks, each week we drove two hours for her to check Ringo’s legs. The cast came off end of November 2014 and our vet gave us the green light that he was ready for adoption! Ringo is now our fastest running and most playful little darling! He is a little cute, cute, cutie pie of a dog and happy as can be. He loves all people and other dogs and loves to run and play and fetch and retrieve balls! He has a perpetual smile on his face, is neutered, is potty trained, cute and friendly! What more can you ask for? Adopted!!! Bo – Black Toy Poodle Puppy Boy! Hi, my name is Bo. 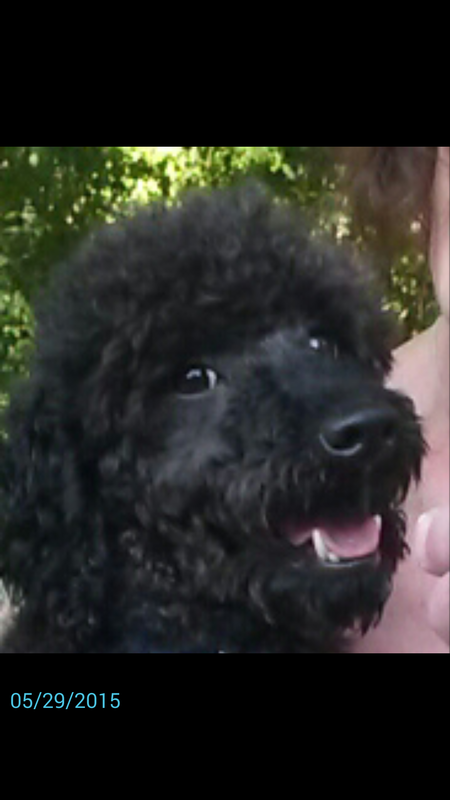 I am a 5 month old jet black purebred toy poodle puppy boy born August 18, 2014. I am trying to be neutered this week and then I will be available for adoption. The family I was with wanted me to go to a good home because the other dog and I were not compatible. I wanted to play and he didn’t. So here I am looking for someone to take me home and play with me! Hurry up ’cause I have a lot of catching up to do with you! 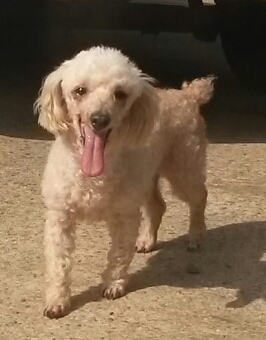 Jon Pierre is a cream toy poodle boy around 1-2 years old and weighs about 11 lbs. He has a great personality and came to us through animal control as an abuse case. He was chained outside and looked like one big overgrown dirty mop with such bad matting that he had to be shaved down. He was surrendered to animal control and animal control adopted him out only to be returned the next day “because he wasn’t potty trained”. People, babies don’t come out potty trained and neither do pups or young dogs. You have to potty train them whether they are human or animal!. We have updated him on his vaccinations and have neutered him. He has tested heartworm positive but shows no symptoms so we will continue to give him the monthly heartworm medicine containing ivermectin. Kasha is a cream miniature poodle girl born 12/4/11. She was purchased from a breeder by her former owner when she was about three months old. 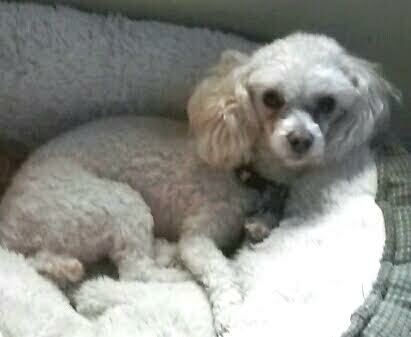 She came to us together with Coby, a white miniature poodle boy born 12/4/11. Their owner is elderly, was diagnosed with cancer, and has no energy with the cancer treatments so we were asked to find the dogs a good home. They can be adopted separately. Both dogs are very friendly. They are both happy and playful and love playing with other dogs. They weigh about 15-18 lbs. Francois is a tiny 3.5 lb teacup toy poodle boy who just came to us with a splint on his leg due to it breaking several weeks ago. He has a big wonderful happy personality in this tiny little body of his. He loves other dogs and loves people. He will stay right by your side and is very obedient. His original owner purchased him from an AKC breeder in Oklahoma and paid about $2000 for him. She then sold him to another couple due to traveling often to see a sick relative. His recent former owners gave him a good home, but they had to “emergency” adopt a 2.5 year old girl who was abandoned by her mother. They encountered many unforseen expenses and a very young child and a teeny tiny dog do not mix so they asked us to find this little guy a good home. We will need a $100 sponsor to xray his leg to determine if it healed okay and the splint can come off. The good thing is that he is walking and running on the leg so it may be healed. Will you sponsor his xray so we can help this little one? ADOPTED!!! FLASH - WHITE MINI POODLE/BICHON BOY! Flash is an all white miniature sized poodle/bichon mix weighing about 25 lbs and about 1.5-2.5 years old as of January 2014. 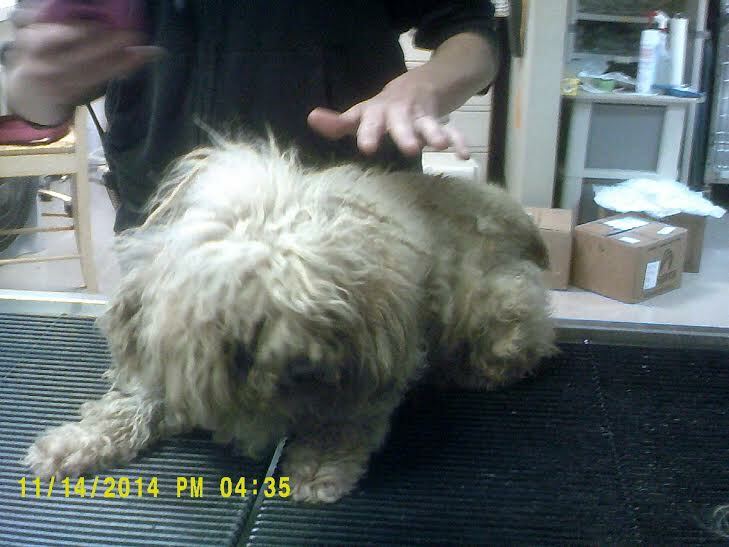 He was found as a stray by animal control with super overgrown and matted fur. We took him in, clipped him, bathed him, and gave him much deserved relief! He is a very calm and relaxed little guy and is a very happy dog. We neutered him, updated him on his vaccines, and heartworm tested him negative. Flash is almost knee height. Hi! My name is Benjamin! My original owner couldn’t keep me and gave me to someone who couldn’t keep me because of my energy level. I think I am a yorkie mixed with Silkie and Shih Tzu. I have a very elegant tall neck!. The vet said I should weigh about 15 lbs so Georgia Poodle rescue will help me meet that goal. I am about two years old and am full of energy! I like running and exploring and running and playing and running again…so if you are interested in me you better have lots of energy to keep up with me! I am so fast and I like running and doing things so much that I think I would make an excellent flashy agility dog! I need a fenced yard to get my energy out! Give me a chance and I’ll show you! I also like sitting near you or on your lap on the counch or at the computer, but I am far from a counch potato and still need my exercise. I’m a happy little guy and love everyone and everything! I know how to come, sit, and stay for short periods of time and how to walk on a leash. These nice people give me the raw meaty bones diet every day along with kibble. I go outside to potty and play several times a day and love playing with everyone. I LOVE it and I have gained my weight back, too! COOKIE – WHITE MINI POODLE GIRL! Ethan and Allen are around 5 years old. They are apricot teacup toy poodle boys weighing in at only about 5.5 lbs. They were found as strays, ended up in animal control, and we were called to rescue them as their time was up. These two are very loving dogs and it is obvious they were very loved at one time. They are perfectly content sitting near you or on your lap. They love to be held and put their heads on your shoulder. One of them has a fused back knee and walks with the leg up but he when he sits, he will use the leg to sit. The vet said it was an old injury that healed that way and it is not bothering him. We have updated them on their vaccinations and will be neutering them and heartworm testing them but they can be shown in the meantime. We would like to adopt them together and are willing to give the right home a discount for adopting them and keeping them together. ADOPTED!!! – DEWEY – WHITE POODLE/BICHON BOY! 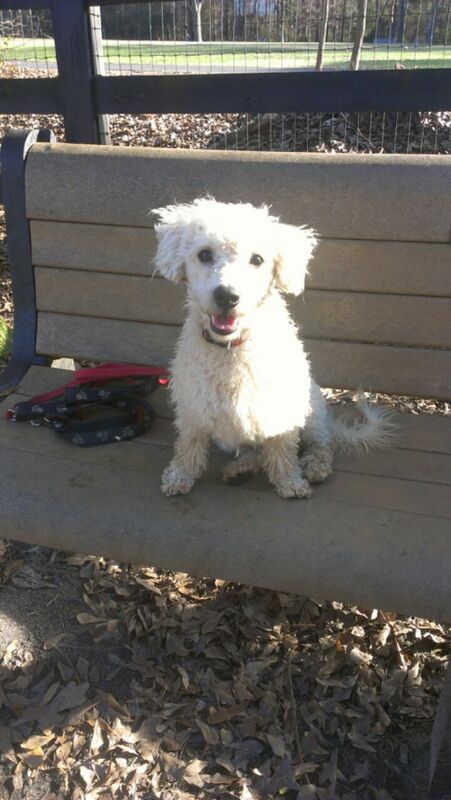 Dewey is a white poodle/bichon boy who weighs about 12-13 lbs and is about 2-3 years old. His former owner could not keep him because she had young children at home and could no longer afford him as she was struggling paying her children’s bills so she asked us to find him a good home. Dewey is cute and is a sweetie pie and is very friendly with people and other dogs. ADOPTED!!! – CASPIAN – CAFE AU LAIT – STANDARD POODLE BOY! My name is Caspian! I am a beautiful cafe au lait standard poodle boy born 8/28/07. My mom’s work schedule changed and I was alone for at least 12 hours a day. Even though I lived with her since I was a pup, I understand she wants the best for me. I weigh 45.5 lbs. I am a happy and friendly boy and love people and children. I know my commands, am neutered, am updated on my vaccinations and heartworm negative. I love playing with other dogs but can be perfectly content snuggling and playing with you and would love to be in a home again. Will you take me home with you? ADOPTED!!! 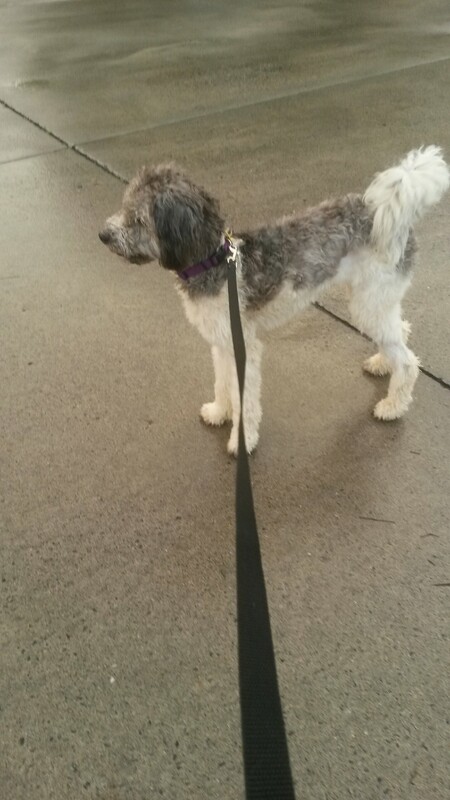 SPENCER-SILVER STANDARD DOODLE OR POODLE WITH A NATURAL TAIL! Hi, my name is Spencer. 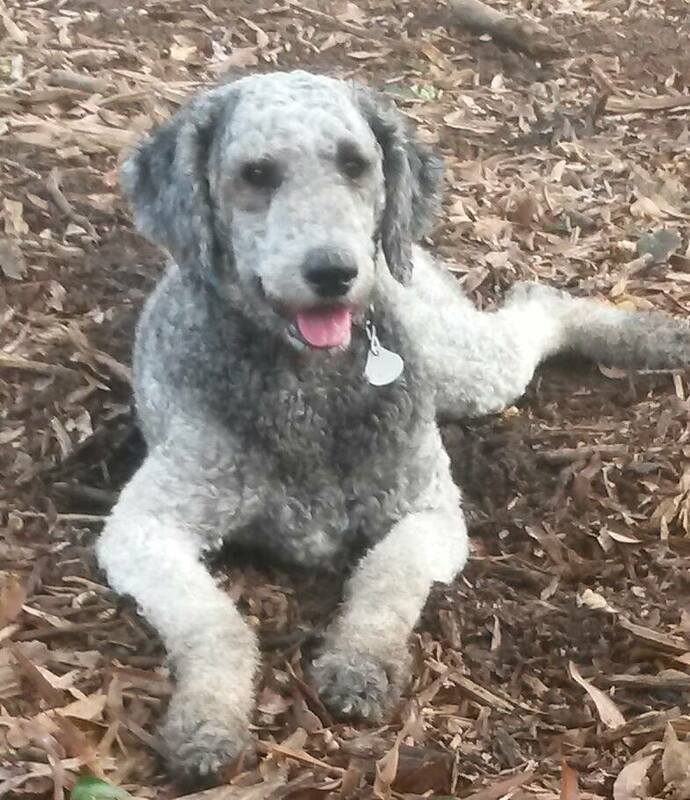 I am a 2-3 year old silver standard doodle boy or standard poodle boy with a natural tail. I love to play with other dogs and people, am very friendly, am learning my commands and love to ride in a car. I can run very fast then I play and it is fun, fun, fun! Look at very handsome me with my new best friend, the very beautiful Piper! We were playing outside in this picture and she was showing me around. Piper was recently adopted so now I run very fast with Ellie. I was very matted so I was shaved down but my hair is growing back very fast! I am a very good boy but my original owner did not give me heartworm medicine each month to kill the baby heartworms before they grew into adults and I tested heartworm positive. 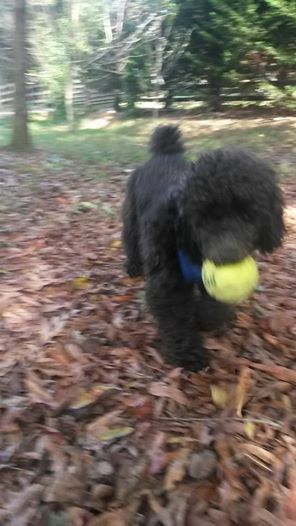 I am being treated by Georgia Poodle Rescue with the slow kill method because I am just too energetic for the other fast kill method, which may kill me. The good thing is I am young, happy, very friendly, energetic (I can run extremely fast,,,,,I think I may have some gazelle in me! ), have a healthy appetite and show no visible symptoms! I also will need to be neutered once the doctor thinks I am ready. Will you sponsor my treatment and neuter to help me get better? ADOPTED!!! MISTY ROSE – SILVER MINIATURE AKC POODLE GIRL! 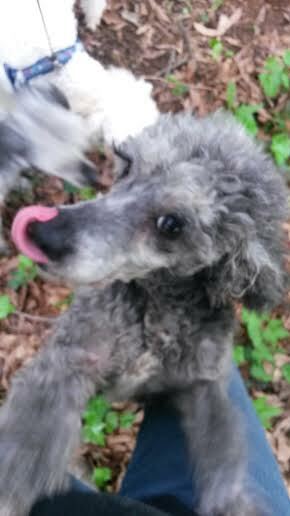 Misty Rose is a beautiful silver miniature poodle girl. She is five years old in 2013 and was surrendered by her former owners as the wife had allergies and Misty Rose was living outside on the deck. Her human dad wanted us to find a good home for her where her new owners will allow her to live inside with them and have the time for her. Misty was given to us with very swollen cauliflowered and calcified ears that could only be seen when lifting up the ear flap. We brought her to a specialist who wanted $3500 for a total ear canal ablation on both ears where Misty would no longer be able to hear. We sought a second opinion and the vet gave us a different medication for Misty and told us to use grain free food for her. Misty’s ears are doing much better as long as she stays away from food with grain in it. We use the Natural Domain Brand food of Turkey Meal and Sweet Potato from Costco as well as the raw meaty bones diet for Misty Rose. She is very bright and would be a very nice dog for someone to own. ADOPTED!!! – VANESSA – WHITE MINI POODLE GIRL ! Vanessa is a beautiful white miniature poodle with a natural tail. She is 3.5 years old as of May 2014, is very personable, and is quite a little character! She is bright and playful and you can actually see her thinking as she attempts to do something! She is very well behaved and also relaxed and is looking for her forever home. Two years ago a veterinarian gave her to us. She has been with us for two entire years and we cannot understand why. She was an owner surrender who could not afford to care for her when she contracted parvo as a 4 mos old young pup, so the owners left her at the vets office to die. The vet had a big heart, treated Vanessa, and Vanessa survived!….that was a long time ago and this beauty needs a home already. She has been very healthy since. The vet tried to find her a home but couldn’t so after several months asked us to find Vanessa the wonderful home that she deserves. Vanessa almost became part of a movie series but she was a little leary of the man coming towards her with a camera. ADOPTED!!! – BELLA – APRICOT COCKAPOO GIRL! Bella is a gorceous female cockapoo girl up to date on vaccinations, spayed, and heartworm negative. She just turned five years old September 2014. Bella came together with Libby the labradoodle. Our evaluation shows they can be adopted together or separately. 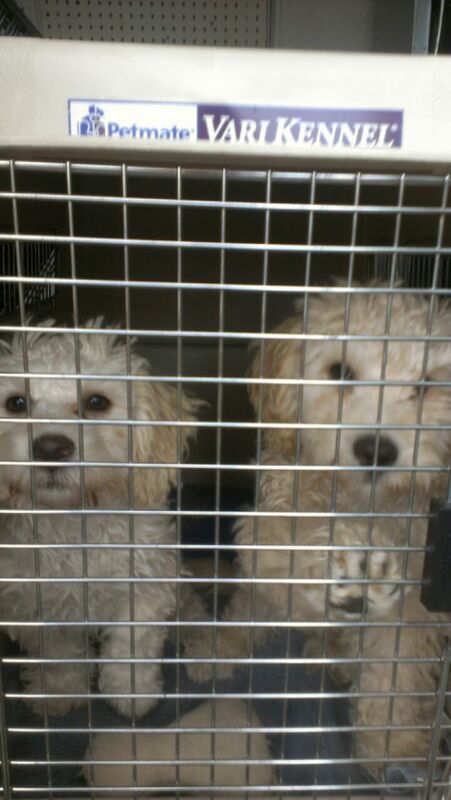 The former owners had two young children and sadly asked us to find both Bella and Libby good homes. It is obvious these beautiful dogs were very loved. Bella gets along well with other dogs, children, and people and just loves to cuddle, cuddle, cuddle and be cooed over by her people. She is a happy little girl who is waiting for a wonderful home. 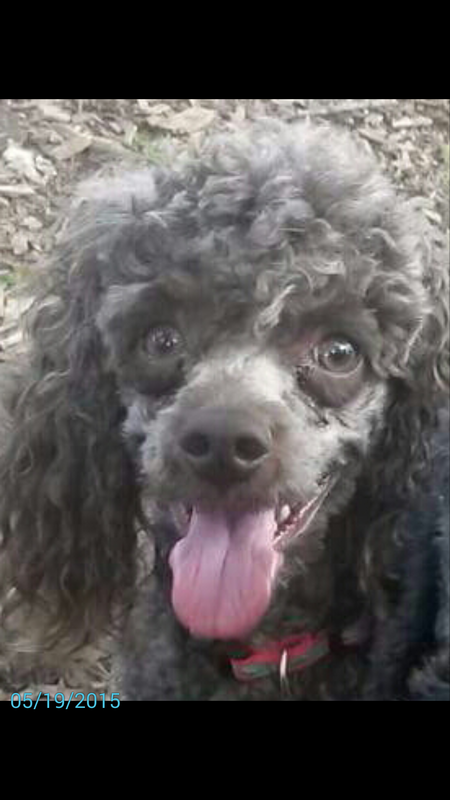 Audi is a 4 year old blue miniature poodle boy. He is well behaved and gets along with other dogs. His former owner had a large dog that did not get along with Audi so she asked us to find Audi a good home. Audi likes to go on walks and follow you everywhere. He is the true poodle. He is a happy little dog with a cute little face waiting to find his new home. ADOPTED!!! DUKE – CREAM TOY POODLE BOY! ADOPTED!!! – NATE – WHITE TOY POODLE BOY! Nate is a cute, well behaved, and very easy going white toy poodle boy. He is about 3.5 years old. Nate has a very easygoing personality and is a quiet, happy dog. He is completely happy sitting in your lap while you work on the computer or watch TV and is also happy just sitting near you. He loves to go for walks and is an all-around happy little boy. He will be your best friend and he is waiting for you to adopt him! ADOPTED!!! – SAVANNAH – UKC BLACK TOY POODLE PUPPY GIRL! 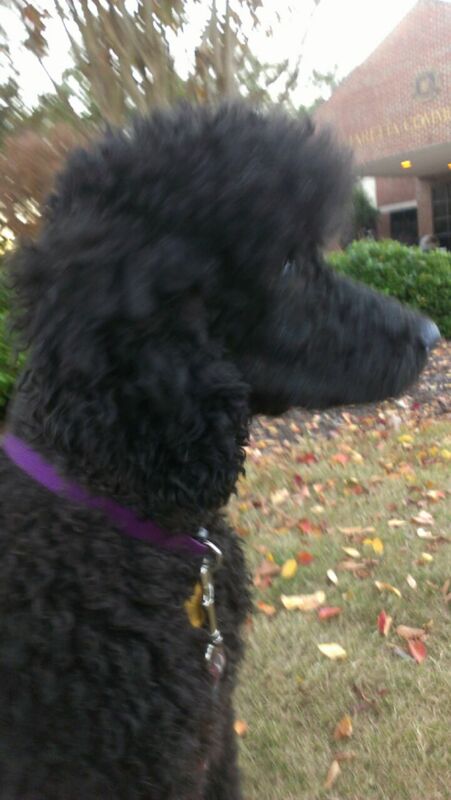 Savannah is a beautiful black toy poodle girl with UKC registration papers. The former owners said she is also AKC registered but couldn’t find those papers. She is about 10 months old and loves other dogs. She was just examined by a veterinarian, is spayed, up to date on her vaccinations, heartworm tested negative and we have her interstate health certificate. The former owners drove about 4 hours and purchased her from a show breeder in Virginia. Savannah seems to have never been properly socialized yet and was very shy when she first came to them and scared of many things. She wanted to play with their two other dogs but they were older and didn’t want to play. They wanted better for Savannah and drove many hours to get her to us. Savannah knows how to walk very well on a leash and wants to stay right by your side. She loves to play with other dogs and she is being exposed to many things on a daily basis, including going out in public so she can be exposed to even more stimuli and learn that everything is okay. We hope that her shyness will soon be a thing of the past. ADOPTED!!! – BLUE MOON OF THE SKIES- TOY POODLE BOY-BLACK TURNING BLUE/SILVER!! And here is Blue Moon of the Skies. Just arrived and we will bring him for his vet check. The owners relative’s Newfoundland dog found Blue Moon in his yard, gently picked BM up with his mouth and brought the little guy to his own mom. Blue Moon was terribly underweight. They looked for his owners for over a month and brought him to a good weight. We are guessing he weighs about 10-12 lbs and is 1-3 years old but will know more when our vet sees him. Initial evaluation shows him to be very giving, warm, gentle, and kind personality and very astute to his surroundings. Very calm, rides well in the car, and likes to be with his human. He is black turning blue or silver. Mica came here with his sister Kara. His sister Kara was recently adopted. His birth date is 8/5/08. Their former owner fell upon financial hard times with younger children and very sadly had to give them up. The former owner had both since 7 weeks old. They are a gorgeous blue color and have their beautiful undocked natural tails. Mica is very well socialized, a fun dog, and very well behaved. He loves to cuddle and play and he will be your best friend. Mica weighs about 65 lbs. He will make someone a wonderful dog. Ever since we have opened this rescue in 2009, we are proud to say that our dogs have always come updated with their vaccinations (many times with a 3 year rabies vaccination), DA2PP, Bordatella, heartworm tested negative, spayed/neutered, sometimes have a dental if needed or as resources allow, flea/hw prevention, trained, microchipped, dewormed, socialized with people and animals and lifetime free training and nutrition advice. Our adopters are very happy with the dogs they adopt from us and many times come back to adopt a second dog from us! Our standard poodles require a five foot minimum safely fenced yard unless otherwise listed. ADOPTED – STORY – BLACK TURNING BLUE TOY POODLE PUPPY GIRL! Hi, my name is Story. I’ll tell you my story. I am the cutest 7 month old toy/mini poodle girl you ever met! I was born black and am turning blue. How cool is that! I am very gentle, playful, and happy. GPR is perfecting my commands and teaching me. This is fun! My former mom bought me from a breeder but couldn’t keep me. I can fetch and retrieve a full size tennis ball all the way back to you! I can come home with you if you know how to take care of me and keep me safe and happy! ADOPTED!!! LIBBY – APRICOT LABRADOODLE GIRL! Hi, my name is Libby and I am a gorgeous (I said gorgeous), apricot standard sized labradoodle girl. I have very soft, wavy fur! I weigh close to 50 lbs, just turned four years old, and came together with Bella, a golden colored cockapoo. 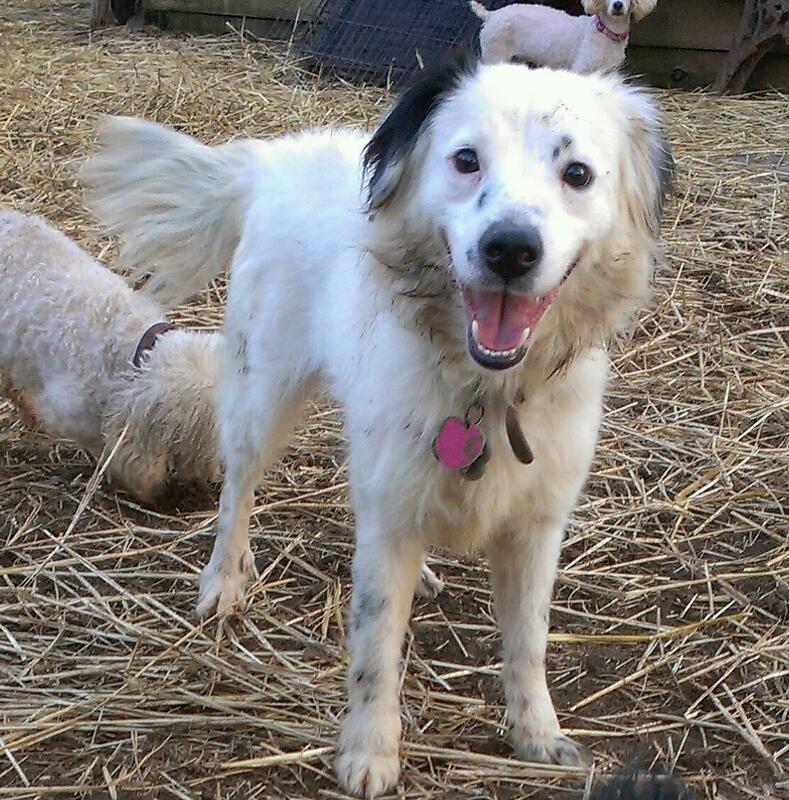 I am happy girl and have a very easygoing and fun personality and love to play, play, play with other dogs. I am good with children, too! We are okay to be adopted separately or together! Our family had two small children and took very good care of us and loved us but could no longer keep us so they asked Georgia Poodle Rescue to find us good homes. We are okay to be adopted together or separately. We love to play, are happy girls, are well trained and get along very well with other dogs. Will you take me or us home with you? Maybe one person can adopt one of us and your friend, neighbor, or work colleague can adopt the other. ADOPTED!!! BINGO – WHITE BICHON BOY! 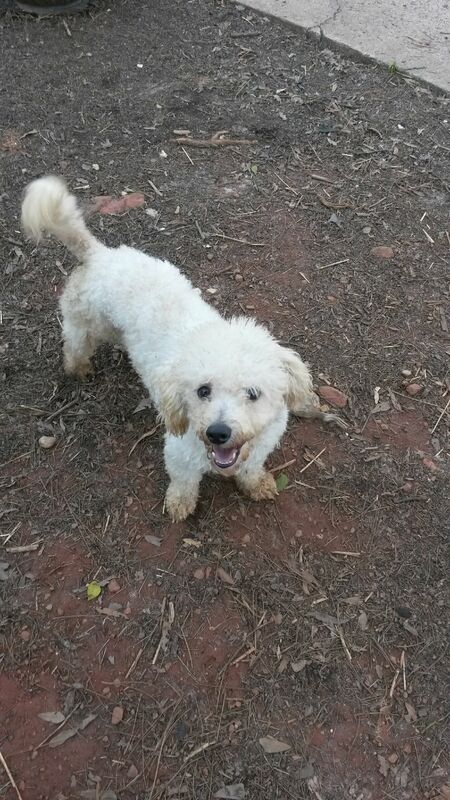 Bingo is a 3-4 year old white bichon boy. He is very cute, soft, and cuddly and has a perpetual smile on his face. He loves going for walks and playing with other dogs and of course being with his people. His former owner moved out of state and could not take him with her so she asked us to find Bingo a good home. He is potty trained, up to date on his vaccinations and heartworm negative. We are working on training him basic obedience commands and he is doing very well. He is very easygoing and not hyper at all. Perfect little companion! 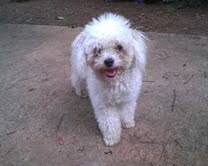 Rocket is a young white purebred miniature poodle boy born 9-17-12. Rocket’s family was moving to another state and could not take him or their other dog. Their other dog was elderly and given to their elderly parents but Rocket was much too young and energetic to give to their parents so they asked us to find him a great home. Rocket loves to play and knows sit, come, down, off, give, drop it, find it, find your ball, ball, treat, outside, go potty. He loves other dogs and came from a family with one child. This little boy has a soft bark and is a great dog! He is ready to be adopted into a home that has the time to play with and care for him. His bark is very quiet and sounds like he has laryngitis but his former owners said his bark has always been that way and they have had him since he was a pup. 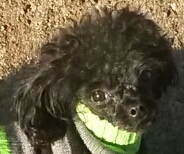 Peanut is a young black toy poodle boy born 1/16/13, weighing about 10 lbs. He is a cute little guy. He is shy at first but once he gets to know you he will be your best friend! He loves to run and play with other dogs as well as go for walks on a leash. Peanut is an owner surrender due to the owner’s travel schedule for work. He asked us to find Peanut a great home who could be home longer than he can and to given Peanut the attention he deserves. ADOPTED!!! – LOUIE – BLACK GOLDENDOODLE BOY! 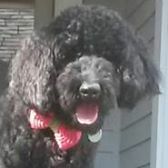 Hi, my name is Louie and I am a 65 lb black goldendoodle boy, born January 8, 2012. I was purchased from a breeder by my former owner. A very nice veterinarian saved my life twice by removing rocks from my stomach when I was younger. I was in the backyard alone and decided to pass the time by tasting them. I couldn’t crunch them so I swallowed them. The first time my former family paid for the operation but the second time happened soon thereafter and my former family couldn’t afford it because they just had a baby. So the vet took me in and fixed me again. My hero! That was several months ago and I am all better …with my hair grown back. I am a very good boy and happy and relaxed. I know how to shake paw (with each paw), sit, wait, down until you say “okay” and I know stay for short periods, heel,and walk and run well on a leash. The vet drove over two hours to get me to Georgia Poodle Rescue because they try to be very careful with their adoptions and I am a young boy that needs attention and exercise. I love playing with other dogs and my peeps. I am such a cool dude in personality and in looks and I am waiting for my forever home to find me! I am neutered, microchipped, updated on my vaccines and trained. Oh, and I do squirrel patrol, too, because they don’t belong there! ADOPTED!!! – IRIS – BLACK TOY POODLE/SHIH TZU GIRL! Iris is a tiny black toy poodle/shih tzu girl weighing about 8 lbs! She was born 10/14/12 in Canada. Her former parents purchased her from a breeder in Canada and their lifestyles changed so they gave her to their relatives in the US, whose lifestyles changed as well, so Iris is with us. This little girl is such a joy to have around. She is jet black and has a perpetual smile on her face as she looks up at you with those soulful eyes. She is a happy little girl and loves to play with other dogs her size or just sit on your lap and be with you. She does not shed but has similar grooming requirements of a poodle. ADOPTED!!! – MONTY – BUFF/WHITE SHIH TZU BOY! Monty is a tan and white toy shih Tzu maltese mix born 9/8/10. But he looks all shih tzu and is a very cute and sociable little boy weighing about 12 lbs. He came together with his miniature sized bichon poodle brother named Smooth. Their owner fell on bad times and could not keep them so asked us to find them a home. Their children were heartbroken over it. The former owner originally wanted us to keep them together but have given us permission to adopt them separately to help find them homes faster. Smooth has been adopted and now it’s Monty’s turn to be adopted. He is a real cutie! Mica came here with his sister Kara. They are five years old and their birth date is 8/5/08. Their former owner fell upon financial hard times with younger children and very sadly had to give them up. They can be adopted separately. The former owner had both since 7 weeks old. They are a gorgeous blue color and have their beautiful undocked natural tails. 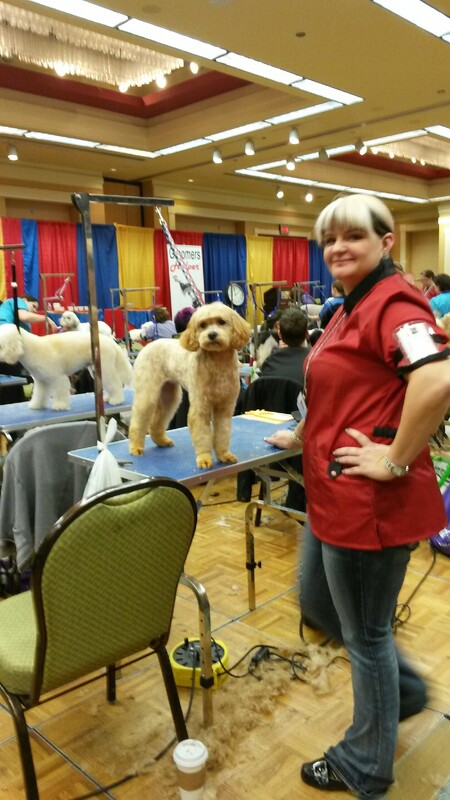 We entered both in a grooming contest on March 3, 2013, and Kara won second place out of 50 dogs! They are very well socialized and fun dogs and very well behaved. They love to cuddle and play and they will be your best friend. Mica weighs about 80 lbs and Katara weighs about 45 lbs. They will make someone wonderful dogs. We have tested them and it is okay for them to be adopted separately. Ever since we have opened this rescue in 2009, we are proud to say that our dogs have always come updated with their vaccinations (many times with a 3 year rabies vaccination), DA2PP, Bordatella, heartworm tested negative, spayed/neutered, sometimes have a dental if needed or as resources allow, flea/hw prevention, trained, microchipped, dewormed, socialized with people and animals and lifetime free training and nutrition advice. Our adopters are very happy with the dogs they adopt from us and many times come back to adopt a second dog from us! Our standard poodles require a five foot minimum safely fenced yard unless otherwise listed. Roulan Rouge is a beautiful chocolate/cafe au lait standard poodle whose owner was new to standard poodles, realized she did not want to devote the time, maintenance, nor expense and surrendered Roulan along with Rupert. Rupert was adopted. Roulan’s birth date is around 6/6/09. Roulan is a bit shy and has come out of her shy shell a lot but once she feels safe around you she will be her beautiful, loving, funny self and her wonderful personality will come out and give you a great big hug! One of our volunteers drove 10 straight hours round trip to get both dogs to us. 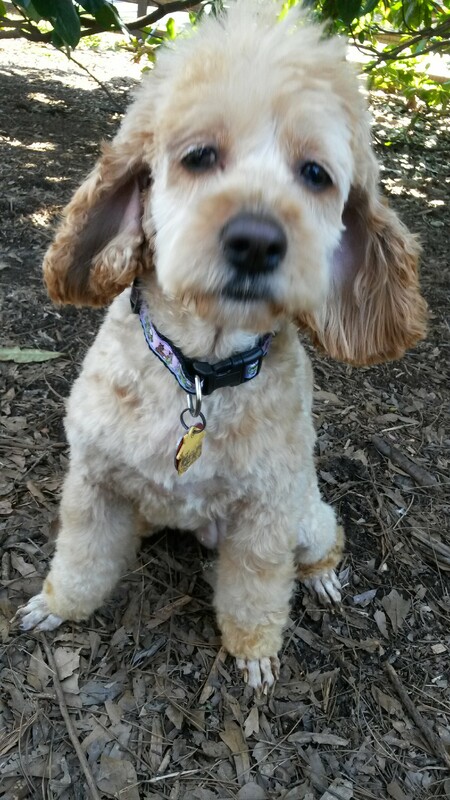 Roulan loves to play and run with you and just loves the attention that poodles love so much. Ever since we have opened this rescue in 2009, we are proud to say that our dogs have always come updated with their vaccinations (many times with a 3 year rabies vaccination), DA2PP, Bordatella, heartworm tested negative, spayed/neutered, sometimes have a dental if needed or as resources allow, flea/hw prevention, trained, microchipped, dewormed, socialized with people and animals and lifetime free training and nutrition advice. Our adopters are very happy with the dogs they adopt from us and many times come back to adopt a second dog from us! Our standard poodles require a five foot minimum safely fenced yard unless otherwise listed. ADOPTED!!! ZYNGA – AKC LARGE BLACK YOUNG STANDARD POODLE BOY! Zynga is an AKC black standard poodle boy pup born 07/20/2013 so he is only a very large 10 months old as of May 2014 weighing about sixty something pounds already! He has a smidge of white on his chest as well as on the tips of his back toes. He was an owner surrender because they did not have a fenced yard to safely play with him in and couldn’t provide the exercise a pup his size and age needs so they asked us to find him a good home with a fenced yard. He was wild at first but with our training he now has a wonderful, calm, and playful personality and gets along very well with other dogs. He is great with dogs, kids, adults and cats and is an absolute love. And he is a cutie pie! He is looking for his forever home. Ever since we have opened this rescue in 2009, we are proud to say that our dogs have always come updated with their vaccinations (many times with a 3 year rabies vaccination), DA2PP, Bordatella, heartworm tested negative, spayed/neutered, sometimes have a dental if needed or as resources allow, flea/hw prevention, trained, microchipped, dewormed, socialized with people and animals and lifetime free training and nutrition advice. Our adopters are very happy with the dogs they adopt from us and many times come back to adopt a second dog from us! Our standard poodles require a five foot minimum safely fenced yard unless otherwise listed. Kara came here with her brother Mica. They are five years old and will be six years old on August 5, 2014. Due to a divorce and younger children, their former owner fell upon financial hard times and very sadly had to give them up. They can be adopted separately. The former owner had both since 7 weeks old. They are a gorgeous blue color and have their beautiful undocked natural tails. 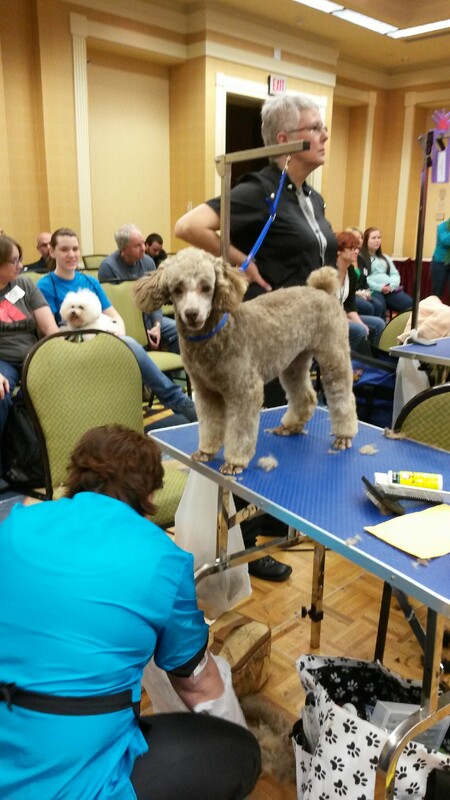 We entered both in a grooming contest in 2013 and Kara won second place out of 50 dogs! They are very well socialized and fun dogs and very well behaved. They love to cuddle and play and they will be your best friend. Mica weighs about 80 lbs and Kara weighs about 45 lbs. We have tested them and it is okay for them to be adopted separately. Ever since we have opened this rescue in 2009, we are proud to say that our dogs have always come updated with their vaccinations (many times with a 3 year rabies vaccination), DA2PP, Bordatella, heartworm tested negative, spayed/neutered, sometimes have a dental if needed or as resources allow, flea/hw prevention, trained, microchipped, dewormed, socialized with people and animals and lifetime free training and nutrition advice. Our adopters are very happy with the dogs they adopt from us and many times come back to adopt a second dog from us! Our standard poodles require a five foot minimum safely fenced yard unless otherwise listed. ADOPTED!!! – BRISCO – BLACK HAVANESE POODLE BOY! My name is Brisco. I think I am a havanese poodle mix. I am black, male, neutered and weigh about 15 lbs. I am a happy little guy who would love to sit in your lap all day. I know commands and I will love you if you adopt me. I like to go on leash walks, too. I was adopted about a year ago but my owners had a major lifestyle change that wasn’t their fault and now I need a home again. I have a perpetual smile on my face and I will make you smile, too, if you adopt me and give me a chance to make you happy! Please send my cuteness to everyone you know so I can find a home faster! 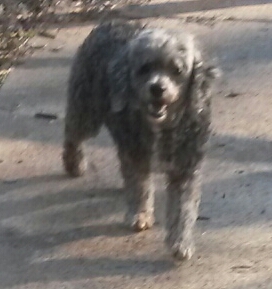 ADOPTED – JASMINE – SILVER TOY POODLE GIRL!!! Jasmine is a beautiful silver toy poodle girl with a very unique and striking dark silver dun stripe down her back with a natural tail. She could be all poodle or slightly mixed with something. She was abandoned on Moody’s air base in south Georgia. Did her former owners deploy? We don’t know but a fellow airperson looked for her owners for months. Jasmine’s personality is the best. She is a sweetheart, gives kisses, loves to be with you and loves to play with other dogs, too. We have spayed her, tested her as heartworm negative, and have updated her on her vaccinations. She is a very well behaved little girl and would make someone a wonderful dog! My name is Biscuit. I am a 2-3 year old bichon poodle mix, am neutered and weigh about 12 lbs. I need to find a home because my former parents divorced, then my former mom lost her home. I am potty trained and a very happy little guy. I am quiet and I am a cutie petutie. Would you like to give me a home again? I will be a good boy for you too! My name is Tully. I am only 10 lbs! 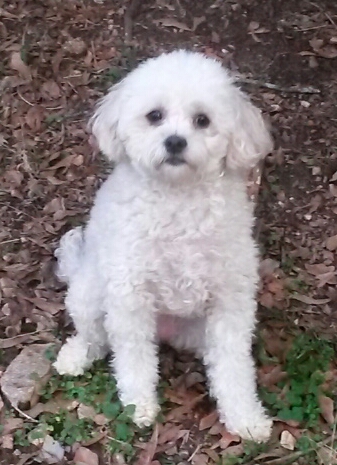 I am almost 1.5 years old and am a cavalier king charles, maltese, poodle mix. I am a beautiful apricot color and love to be with you, watch what you are doing, cuddle with you and play, play, play. You can see how cute I am with different hair cuts from fluffy to sleek. Right now I am in a schnauzer haircut for some reason. I get along with people and pets. My family was moving to another state and couldn’t keep me so I am in rescue waiting for my next home. I had a human brother and love kids, too. Will you make me yours? 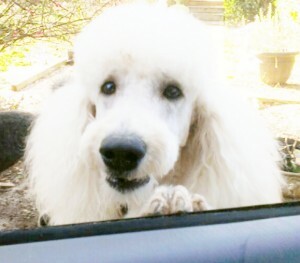 Alfie is a very handsome white standard poodle boy who was born 5/2/03. He is a bit shy at first and will actually hide behind something when meeting new people but he soon comes out of his shyness once he senses it is okay. He loves to hang outside and check things out and will follow you and gently nudge you to get your attention. His owner fell ill and had to go into assisted living which doesnt allow dogs. Alfie had a large fatty tumor on the side of his body when he came to us. We have used a customized nutritional program for him and it has disappeared! Wont you find it in your heart to give Alfie a wonderful home that he deserves to live his golden years at? He is in foster but it also available for adoption. Ever since we have opened this rescue in 2009, we are proud to say that our dogs have always come updated with their vaccinations (many times with a 3 year rabies vaccination), DA2PP, Bordatella, heartworm tested negative, spayed/neutered, sometimes have a dental if needed or as resources allow, flea/hw prevention, trained, microchipped, dewormed, socialized with people and animals and lifetime free training and nutrition advice. Our adopters are very happy with the dogs they adopt from us and many times come back to adopt a second dog from us! Our standard poodles require a five foot minimum safely fenced yard unless otherwise listed. Special Price For Alfie. ADOPTED!!! – MAGGIE - APRICOT COCKAPOO GIRL! Maggie is a beautiful apricot cockapoo girl born 12/11/11, weighing about 27 lbs. She is a happy girl and well adjusted to people, children, and dogs. She loves squeak toys, smiling, and loves playing with dogs. She was an owner surrender from a recent law school grad who began working 60-80 hour weeks and could not devote the time that Maggie needed so he asked us to find her a good home. Maggie was purchased from a breeder by her former owner. She has her natural tail and is a beautiful little girl looking for her forever home. Dixie is a gorgeous silver and white moyen sized labradoodle puppy girl with tall legs and a beautiful fluffy tail! She is approximately 11 months old as of May 2014 and weighs about 21 lbs. We are trying to add at least 10 lbs to her weight. Her original owner dumped her at animal control at 6 months of age and then she was adopted by a family with children in December 2013. Her family was unprepared for the high energy and needs of a younger dog and wanted us to find Dixie a good home who could give her more attention and play time. Dixie is leash trained, potty trained, knows how to sit, stay, wait, up (stand on two legs), out. She loves to play with other dogs and loves stuffed animal toys with squeakers. She is great around kids, dogs, and cats. She is a beautiful and happy girl and is seeking a home who can give her the time and needs a dog of her age requires. ADOPTED!!! – CARLA AND CRYSTAL – COCKAPOO SISTERS - We are well behaved, cute, love to cuddle, have happy smiles and long to be together in a family. We love little girls! Carla and Crystal are two beautiful apricot cockapoo sisters about 4 years old and are very quiet, friendly, playful and obedient. They must be adopted together because they are very bonded to each other. They were an owner surrender who could not keep them and they asked us to find them a good home. Jacques is a pure bred black poodle boy pup. He is five months old as of April 2014. His former owner was an 82 year old woman whose standard poodle passed away and she purchased a pup from a breeder. And although she loved Jacques, she realized that she didn’t have the energy for a pup so wanted us to find Jacques a family who has the time, energy, and expertise for Jacques where they could play with him in a fenced yard and provide him love and care for the rest of his life. He is a fun little guy and has already mastered the sit, come, and off commands. He has that puppy smile and will follow you everywhere. Very happy and willing to learn! We have neutered him. Ever since we have opened this rescue in 2009, we are proud to say that our dogs have always come updated with their vaccinations (many times with a 3 year rabies vaccination), DA2PP, Bordatella, heartworm tested negative, spayed/neutered, sometimes have a dental if needed or as resources allow, flea/hw prevention, trained, microchipped, dewormed, socialized with people and animals and lifetime free training and nutrition advice. Our adopters are very happy with the dogs they adopt from us and many times come back to adopt a second dog from us! Our standard poodles require a five foot minimum safely fenced yard unless otherwise listed. Gemma is a very cute black toy poodle girl whose former owner could no longer keep and asked us to find a good home for her. Gemma weighs about 10 pounds, is about 4-5 years old as of April 2014 and is a cutie pie who loves to cuddle. She is a happy little girl, loves to be with you, is potty trained, well behaved and spayed. She gets along very well with other dogs and she would love someone to give her a home to call her own, love her, and treat her like a little princess. ADOPTED!!! – DRAKE – WHITE MINIATURE POODLE/BICHON BOY! 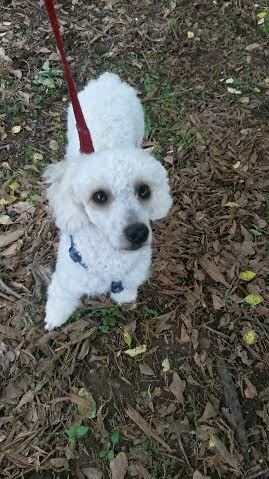 This beautiful miniature poodle possibly mixed with bichon boy we named Drake is a wonderful 1.5-2 year old white darling of a boy as of 2014 that we neutered, updated on his vaccines, and gave a good grooming to. Look at how he came in and then how he cleaned up! He was on death row at a high kill animal control facility and we were asked to take him into our program. He was very scared at the animal control facility and didn’t know what we wanted but when we lead him out with a leash and put him in our van, he gave us a little kiss. What a sweetie pie! He will jump into your arms, he is always smiling, has a great demeanor, happy, very relaxed, and he will put his paws around your neck and place his head on your shoulder. He is very playful and loves other dogs his size. This little boy has a lot of love to give to someone who deserves him. He is looking for his forever home who will love him and never let him get like that dog in the before picture again. ADOPTED!!! ARNIE – Silver and White Yorkie-Poo Boy! Arnie is a beautiful silver and white yorkie poo boy. He is approx. 3.5 years old as of February 2014, weighs about 15 lbs, and was an owner surrender because she lost her job. Arnie was purchased from a pet shop by new dog owners who soon realized the responsibilities involved with a job and the daily care and grooming cost of a high maintenance coat. They gave Arnie to Arnie’s former owner who also was a first time dog owner. She did the best that she could with him but when she lost her job she could no longer afford him and had to move in with her parents who already had a dog. We took Arnie in and socialized him with both dogs and people and he has turned into the most loving, cuddly, and friendly little guy and will make someone a lovely little companion. 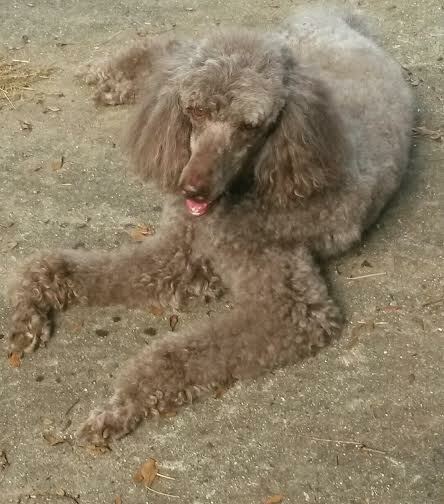 Alf is a 4 year old male neutered apricot standard poodle. He weighs almost 50 lbs. His former owners sadly could no longer keep him, and asked us to find him a great home. Alf is a very well behaved young lad. Our evaluation showed him to be very obedient, very calm, very socialized and he likes to be right by your side. Alf is good with children as he came from a family with children. Alf knows how to sit, shake paw, come, and more! He loves running very fast across the yard with the other standards. He would make someone a wonderful dog. His former owners said he was always skinny near his hips since he was a pup but that is hidden by his beautiful coat. These are pics of him on intake making his face look somewhat like an airedale terrier, however, we have since shaved his face and toes and trimmed him and he is very much a wonderful standard poodle! He is very handsome and a very good boy and available to the right home. Ever since we have opened this rescue in 2009, we are proud to say that our dogs have always come updated with their vaccinations (many times with a 3 year rabies vaccination), DA2PP, Bordatella, heartworm tested negative, spayed/neutered, sometimes have a dental if needed or as resources allow, flea/hw prevention, trained, dewormed, socialized with people and animals and lifetime free training and nutrition advice. Our adopters are very happy with the dogs they adopt from us and many times come back to adopt a second dog from us! Our standard poodles require a five foot minimum safely fenced yard unless otherwise listed. 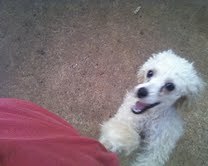 Smooth is an all white bichon poodle boy who was born 9/12/10 and resembles Cash, our bichon boy. Smooth was an owner surrender along with his brother Monty, a shih Tzu maltese mix. Smooth loves to run and play with children. Their owners fell on bad times and could not keep them so asked us to find them a home. The former owner’s children were heartbroken over it. The former owner originally wanted us to keep them together but have given us permission to adopt them separately to help find them homes faster. Sophie is a beautiful approx. 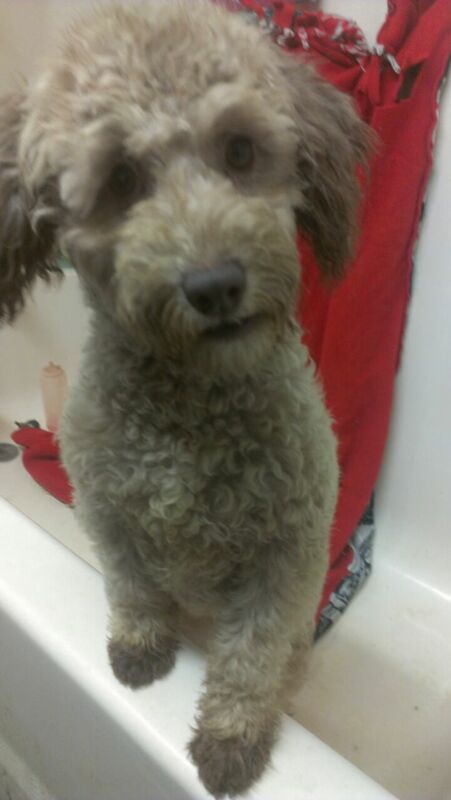 8 year old silver and white toy poodle girl. She was one of the dogs that ended up in another rescue (who did not microchip her) as a result of Hurricane Katrina a few years back. She was adopted by a family in GA. The daughters went to college and the mothers and fathers work schedules changed to 12 hour days and they could no longer give her the time and attention she deserves so they asked us to find her a good home. Toy poodles are known to live as far as 18-22 years old. So Sophie is still a cute, young, beauty! Look at that cute little Mona Lisa smile she has! She has a wonderful personality and will perfectly content sitting on the couch watching you do your work. She is quiet and cute and loves other dogs and is such a little love! 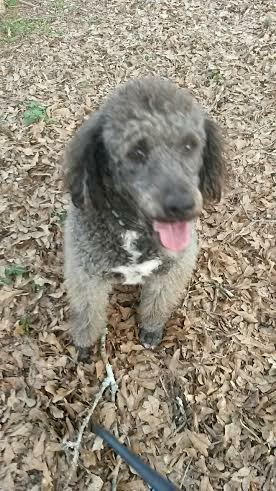 Rowen is a young cream standard poodle boy. He was an owner surrender because a groomer bred four standard poodles at the same time and couldn’t find homes for all the pups. He was born around March 2010. Rowen weighs about 45 lbs and is a good boy and wants to be with his people or another dog. He is a sweet, playful, happy boy and he is looking for his forever home. 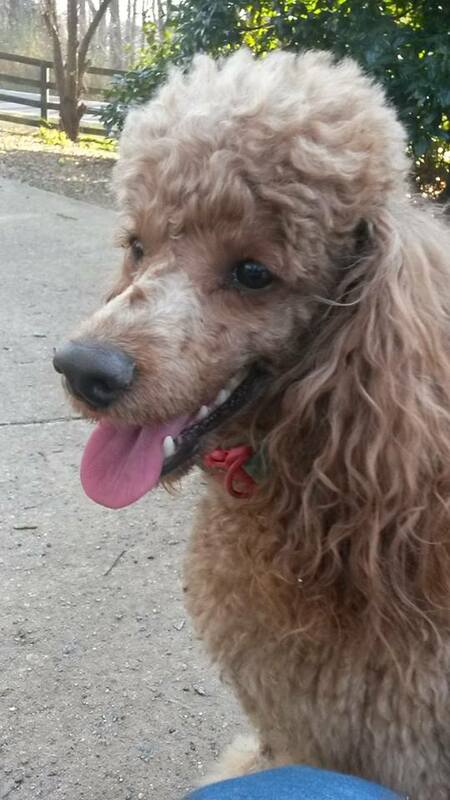 Chip is a 5 year old café au lait toy poodle boy who was brought to us with his chocolate brown miniature poodle brother Gus. Gus was adopted. Their former owner was diagnosed with heart problems and could not afford the heart medicine and the vet and food bills. She moved in with her daughter to save money but her daughter already had two large dogs who didn’t like these two little sweeties so here they are needing a good home. Chip weighs about 7-10 lbs and loves to cuddle. He has a nice personality and gets along with other dogs and people. They can be and have been adopted separately. Max is a very tall black and white parti standard poodle boy born 7/27/09. His head is all black and his body shows very unique black and white markings. He weighs about 65-70 lbs and he absolutely loves running and playing with his people and with other dogs. He was surrendered by his family because they did not have a fenced yard and they realized that a dog as large as Max needs lots of exercise. Max is well behaved. He is housetrained and we have updated his vaccinations, and heartworm negative tested him. His former family loved Max very much and they wanted us to find him a wonderful home with a fenced yard and a family who can devote the time to Max. Won’t it be you? 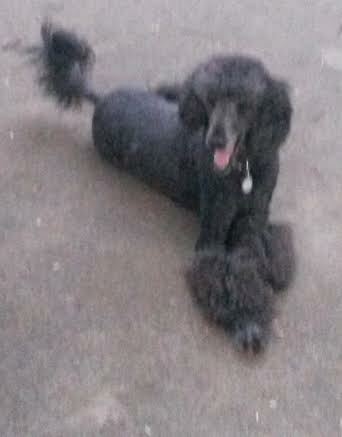 Prince is a small black miniature poodle boy approximately 3 years old. He was an owner surrender who could no longer keep him. He was very overgrown when he came to us but that doesn’t matter because we cleaned him up immediately and a very cute little boy emerged in looks and in personality! We have socialized him with other dogs and people and this little cutie is ready to find his forever home! ADOPTED!!! – SANDY – BLACK & SILVER PUREBRED GERMAN SHEPHARD PUP! Sandy is a gorgeous black and silver purebred German shepherd pup. She was born 9/11/12 and weighs about 65 lbs. She is registered and we have her registration papers. She appears to be of the American lines where she has the taller legs and longer, lankier body as opposed to the unhealthy slant of the back that some show lines promote. Her owners purchased her from a breeder but lived in an apartment and didn’t realize that a dog this size needed lots of space and exercise. They soon found out and called us to train her and find her a good home. You must be familiar with the shepherd breed and have shepherd ownership experience that can be verified by a vet. Sandy now knows how to consistently sit, come, walk on a leash without pulling, is socialized with other dogs and people, and we are giving her as much as she wants to eat as she needs to gain more weight. She has a very happy and friendly personality and we bring her out in public to expose her to many situations. We are teaching her in our special way and are looking for a special family where she can be a loved inside dog and have another dog to play with. ADOPTED!! 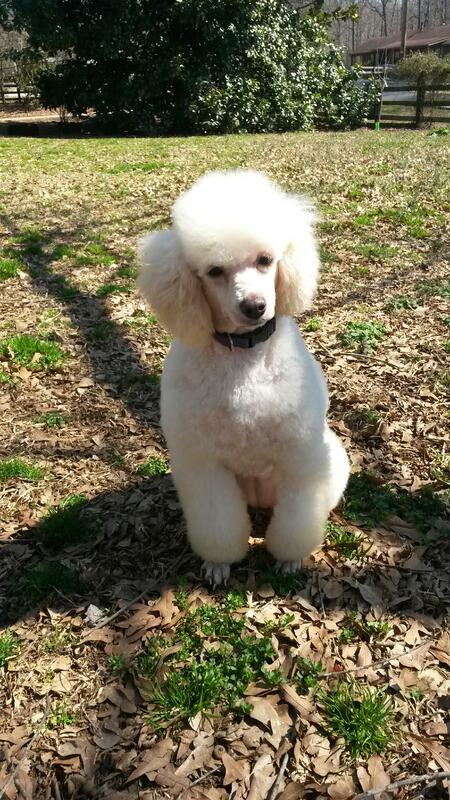 !JAKE – WHITE STANDARD POODLE BOY! Jake is a three year old white standard poodle boy who came to us because his owner developed a debiliating illness. We have his three generation pedigree and he was born 4/15/13. She had Jake since he was a young pup. Jake is absolutely gorgeous and has a beautiful coat. He is very friendly and gets along very well with dogs of his size. Jake knows how to sit, down, high five, load up into the car by saying “bye bye”, loves to swim, hike, go for car rides, loves to be brushed and groomed and loves attention. Jake’s former owner said he cannot be around cats but likes some dogs. We have neutered him, heartworm tested him negative, updated him on his vaccinations and he is ready for his forever home! Jake has a wonderful personality and we are hoping he will find his forever loving home sometime soon. Please help us spread the word about our wonderful dogs! ADOPTED! – CASH - YOUNG WHITE POODLE/BICHON BOY! 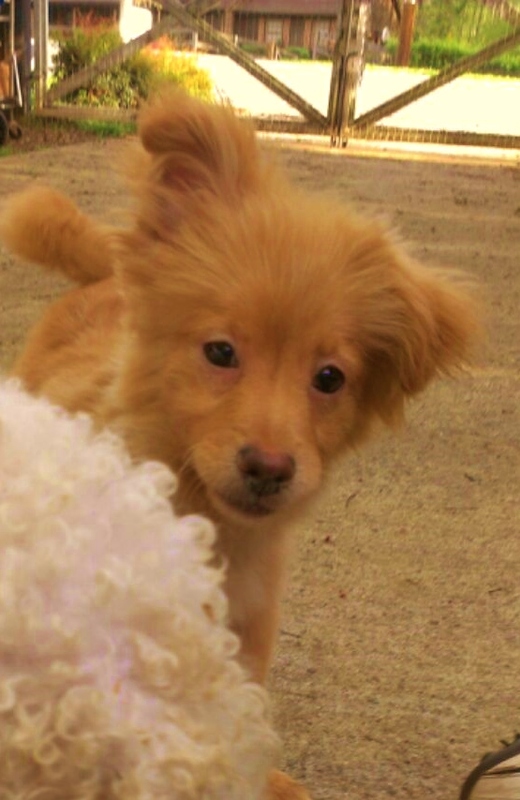 Poppy seed is a one year old red Pomeranian boy who is a loving little guy that loves to play. His former owner could no longer keep him and he needs a home to call his own so please spread the word that the poodle rescue has a young Pomeranian in need of a good home! ADOPTED – GENIE – Young White Toy Poodle Girl! 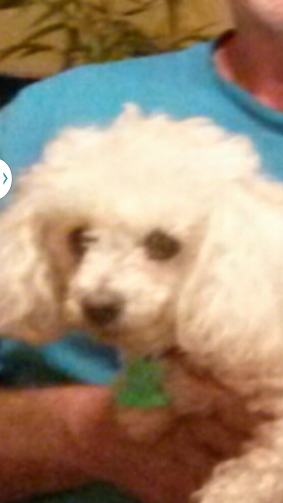 Genie is a white toy poodle girl about one year old as of December 2013. She was found as a stray wearing a Christmas sweater around Christmas. No one came for her so we were asked to take her in and find her a good home. We spayed her, heartworm tested her negative, and updated her on her vaccines. She is a tiny cutie pie weighing about 7 lbs and her personality is as cute as her looks! 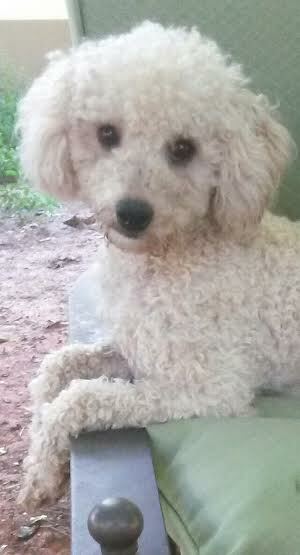 April is a beautiful toy sized cream colored poodle mix girl. She belonged to a woman who let April and her mother roam free. The owner thought it was okay because she lived far from the road and “nothing ever happened before” and she “lives in a safe neighborhood”. April’s mother was killed by a car and her human mother wanted to dump her at animal control. A neighbor intervened, kept April for a while and found April a home. That home was a first time dog home and with a child and a job that meant a 10-12 hour day, they couldn’t keep April either so called us to find her a home. She is about 1.5 years old as of February 2014. She has very fluffy large loose curls and a tiny little body under all that fluff and weighs about 7-10 lbs. She has a great personality and loves people and pets. She was in a foster home for several months but came back to us. Won’t you give April the permanent home she so deserves and love and protect her forever? Tanner is a very handsome 6 yo male, neutered and papered portugese water dog as of November 2012. We have his AKC papers and Tanner has 7 champions in his 3 generation pedigree. DOB 5/22/06. We also have the orthopedic foundation’s testing, the genetic company’s testing, and the PRA company’s testing papers on his lineage. His former owners traveled between their condo in FL and their farm in TN. They may be selling the farm and Tanner won’t have enough room in the FL condo on a daily basis nor a yard to run in so they drove him to us and asked us to find him a great home. Tanner is already trained in basic obedience, walks well on a leash, is very sociable with people and other small and large dogs, loves kids, and minds his manners. He loves to be with his people, loves to go boating and swimming with his people, loves to play frisbee. We brought him to a few stores with us and he was the perfect gentleman. You must have a house with a physically and “fully” fenced yard to adopt Tanner so you can play and run with him in a safe environment. Tanners former owners keep in touch with us and would like Tanner to go to a family located in the state of GA who have successful PWD ownership experience that can be verified by a veterinarian. His last vet appointment in August 2013 shows him to be in great condition! 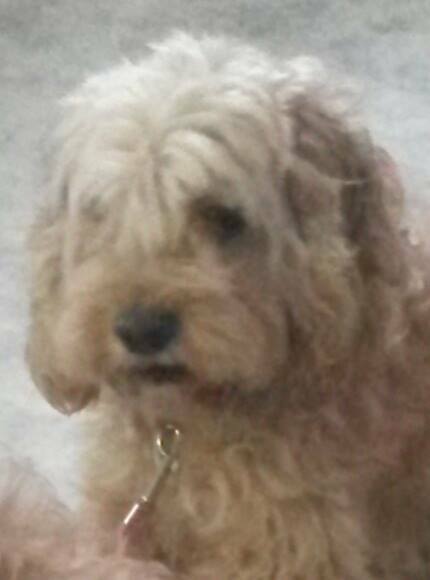 Winney is a beautiful, blonde and well-behaved whoodle (wheaten terrier/standard poodle mix). She has very soft wavy hair, weighs about 50 lbs, and is estimated to be approximately 3 years old as of July 2013. A far away animal control agency contacted us asking us to take her into our program. A very nice volunteer drove over eight hours round trip to get her to us. We evaluated her and found her to have a wonderful, playful temperament. She is very willing to please and is a playful fun girl. She likes to play with the ball. She has been vetted (examined, brought up to date on vaccinations, and heartworm tested) and spayed and awaiting her forever home! 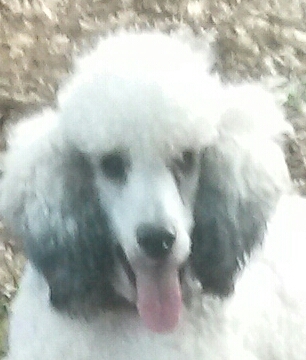 Max is a handsome young white standard poodle boy born 12/6/11 so he will be 1.3 years old as of March 2013! Max has that very regal look, is a sweetheart, and loves to receive massages and have his paws rubbed. He is a true poodle cling-on meaning he will follow you whereever you go. He is very smart and inquisitive and loves to play, play, play. He gets along very well with other dogs. Max is very high energy at this young age so you must be able to keep up with him and run and play with him. Having another dog to play with him will also be great to run off some of that energy! He will make someone a wonderful dog and he is ready to go to his forever home! ADOPTED – MARLEY – YOUNG BLACK STANDARD POODLE GIRL – ADOPTED!!! 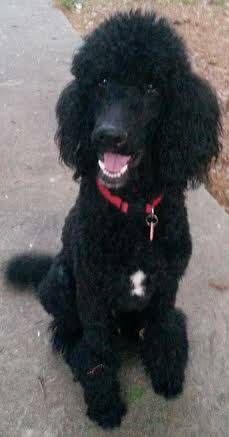 Marley is a beautiful black female standard poodle who is about 1.5 years old as of August 2013. A person who had Marley decided she wasn’t a dog person and gave Marley to her daughter. Her daughter also decided she wasn’t a dog person and didn’t have much time for Marley and kept her in a small plastic carrier crate outside. A construction worker, who was doing work on the house, saw this and asked to have Marley, who was skinny, and the woman gave Marley to him. The construction worker and his wife were lab people and helped Marley get out of her situation however realized they were not prepared for the expense and maintenance of a standard poodle. So they did the right thing and called us. We are very glad Marley came to us. Although she was matted and skinny, we clipped her, bathed her, vetted her, spayed her, and updated her on her vaccines and she tested heartworm negative……thank goodness!!! Marley is the sweetest and calmest dog for her age and catches on very quick for commands. She is a jewel and is awaiting for her new home to taker her in and treat her like the princess she deserves to be treated like. Adopted! BARBIE AND CHARLIE – Goldendoodle Brother and Sister Young Pups! Barbie and Charlie are two goldendoodle or labradoodle brother and sister puppies (according to the former owners vet) born September 2013. As of January 2014, they weigh about 15 lbs. The former owner surrendered them to us because they were leaving the country and could not keep them so asked us to find them a good home together. They must be adopted together. We don’t know what size doodle they will be. They are fun, happy, and potty trained pups and we will be spaying and neutering them. Please have the time and energy it takes to devote to the care of two puppies. These dogs are really nice dogs! These pictures show them in the car on the way to us and we will post better pictures soon! THEY WERE SURRENDERED TO US TO BE ADOPTED TOGETHER. NO EXCEPTIONS. THEY CANNOT BE ADOPTED SEPARATELY. Whitney and Betty Boop are two beautiful female cocker spaniels that we rescued from euthanasia their last day at animal control. They are about 4 years old. Whitney is a beautiful deep chocolate brown and Betty Boop is Black white a white bib. They may be sisters and were left at animal control by their former owner who could no longer keep them. Each had cherry eye in one eye and our vet just operated on them. Whitney is heartworm negative but Betty Boop is heartworm positive and will be spayed as soon as the vet thinks she is ready to be spayed after the surgery. They are both extremely loving and gentle and nice little girls weighing about 30 pounds each. They are extremely friendly and playful and know how to walk on a leash. They have been together all their lives so it would be ideal if we could adopt them together . Betty Boop is being treated with the slow kill method for the heartworms which is basically giving her the HeartGuard every month. She shows no symptoms. 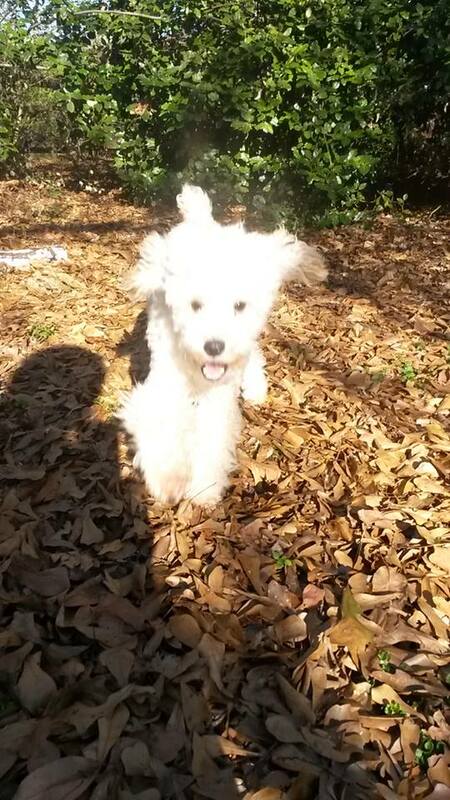 MUFFIN – YOUNG BICHON/POODLE MIX GIRL! - ADOPTED!!! 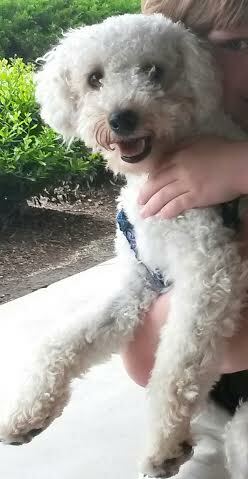 Muffin is a beautiful white female bichon/poodle mix girl. 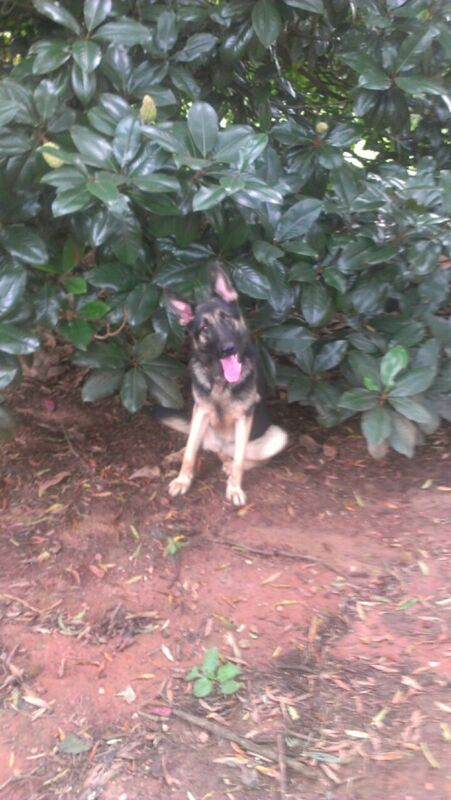 She is estimated to be around 1 year old as of November 2013. 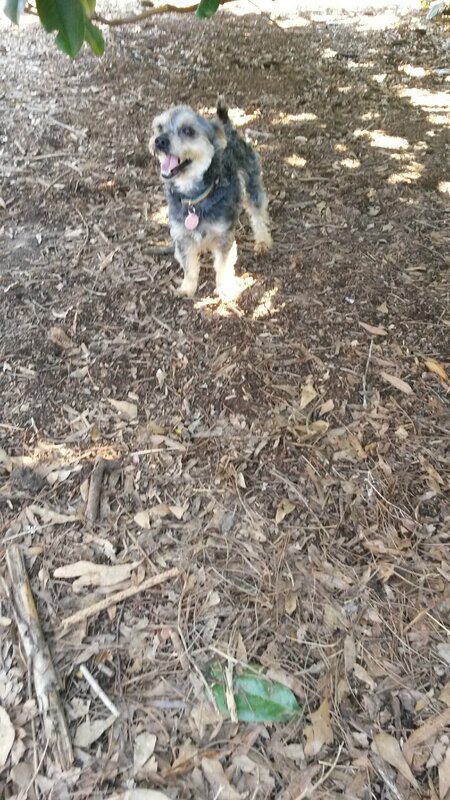 Her former owner moved in with her parents and their older yorkie did not like Muffin so they asked us to find her a good home. When we first saw princess, we thought she was a miniature border collie mix having mostly white fur with some black markings. But she has 10% poodle in her according to a DNA test that the former owners had done. Princess is spayed and weighs about 25 lbs and is not getting any taller! She is about knee height and is having fun getting dirty in the yard after a rain storm. For those who love the look of a border collie but do not want the size nor the high energy, Princess is the dog for you! Princess is very unique looking, pretty, very sweet, is gentle around children (her former owners had children) and was born around 7/9/11. She loves to go for car rides, be with her person, and play with other dogs and her people! She would be a good size dog to live in an apartment or condo with appropriate leash walks outside, or of course a house with a fenced yard to play with her off leash. Her former owners sadly had to surrender her because of their work schedules and their busy schedules with their children. They wanted us to find Princess a home where she will be loved, played with, and so the new family can treat her like the princess she is. Samson was pulled from animal control by one of our volunteers and foster home. 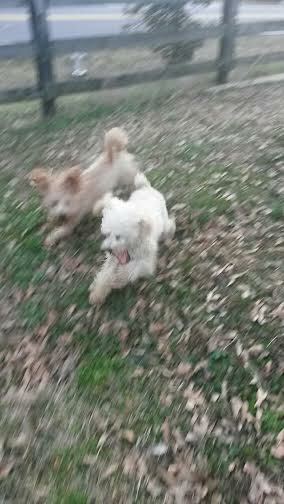 He is a miniature cream colored poodle and very friendly and active. He is full of energy and loves to play so it would be best that you have an active playmate for Samson or somehow be able to fulfill his energy requirements. Serena is a very unique dog!. She is a little over one year old as of February 2013 and has a beautiful and uniquely colored taupe coat with black tips on each hair, one blue eye and one brown eye, a black muzzle and weighs about 25-30 lbs. We don’t anticipate her getting any bigger. For those people who don’t have the space for a large shepherd, Serena looks like a miniature german shepherd with an extremely friendly personality! .She does not have shepherd hair though. She has a full thick, luxurious, and soft coat and she has not shed! She was on a transport with a poodle that was coming to us. She has a very sweet personality and also a very playful personality. She gets along with our other dogs, we spayed her and updated her on her vaccines, and she is ready to go to her forever home! Serena would be fine for a house or an apartment and leash walks, and romps in the park or your own back yard as she just loves to play and run with her person and with other dogs! 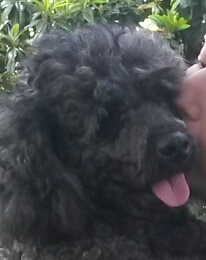 We believe Schafer is a rare miniature portugese water dog. We have had large PWDs in the past, however, Schafer is the second rare miniature size PWD we have had in the last few years. He weighs about 25-30 lbs, is all black, and is a real sweetie pie. He was found as a stray with a harness, collar, and two leashes by animal control but had no ID tags. We were called to take him into our program. He is a happy little guy with big smiles, gets along very well with our other dogs, and thrives on positive reinforcement. He loves to be told he is a good boy……which he is! We are guessing he may be around 3 years old. Not good with men right now. He needs a strong pack leader so he won’t revert to his former ways and you must let us know on your application how you are a strong pack leader. 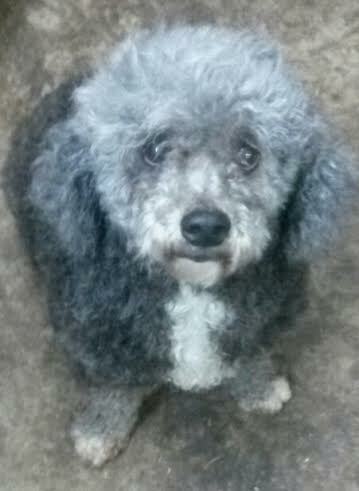 Max is a five year old black and white parti-color miniature poodle boy as of 2013. He is very calm, relaxed, and happy and loves to play with other dogs. He was given as a gift to someone who never owned a dog as an adult and they soon realized the maintenance, time, and cost involved so they dumped him at animal control when they were moving. We have showed him several times but one of the other dogs was adopted instead of him. He has a wonderful calm personality, is a happy boy, plays well with other dogs and walks very well on a leash. 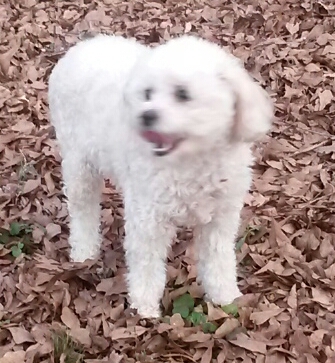 I am a white miniature poodle about 3 years old. My former family was from SC, a state with one of the worst animal protection laws. Anyway, they visited with friends in Atlanta, and I was playing with the kids outside. Then they pushed me away and left me there. I kept barking for them to come get me but they didn’t. A neighbor saw me and tried to get in touch with the Atlanta people but they moved. She brought me to animal control, who called my former family in SC but they wouldn’t call back. 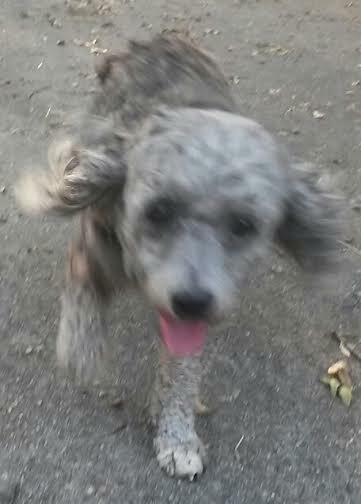 So after one week, my rescuer adopted me from animal control and gave me to Georgia Poodle Rescue to find me a responsible home. I love people, love kids, am a happy dog and love to cuddle. I also play well with other dogs. Will someone please love me forever and not through me out like a piece of trash? Whitney and Betty Boop are two beautiful female cocker spaniels that we rescued from euthanasia their last day at animal control. They are about 4 years old. Whitney is a beautiful deep chocolate brown and Betty Boop is Black white a white bib. They may be sisters and were left at animal control by their former owner who could no longer keep them. Each had cherry eye in one eye and our vet just operated on them. Whitney is heartworm negative and spayed but Betty Boop is heartworm positive and not spayed. She will be spayed as soon as the vet thinks she is ready to be spayed after the treatment. They are both extremely loving and gentle and nice little girls weighing about 30 pounds each. They are extremely friendly, playful, and happy little girls and know how to walk on a leash. They have been together all their lives so it would be ideal if we could adopt them together but it is not necessary to do so . Betty Boop is being treated with the slow kill method for the heartworms and at present does not show symptoms. 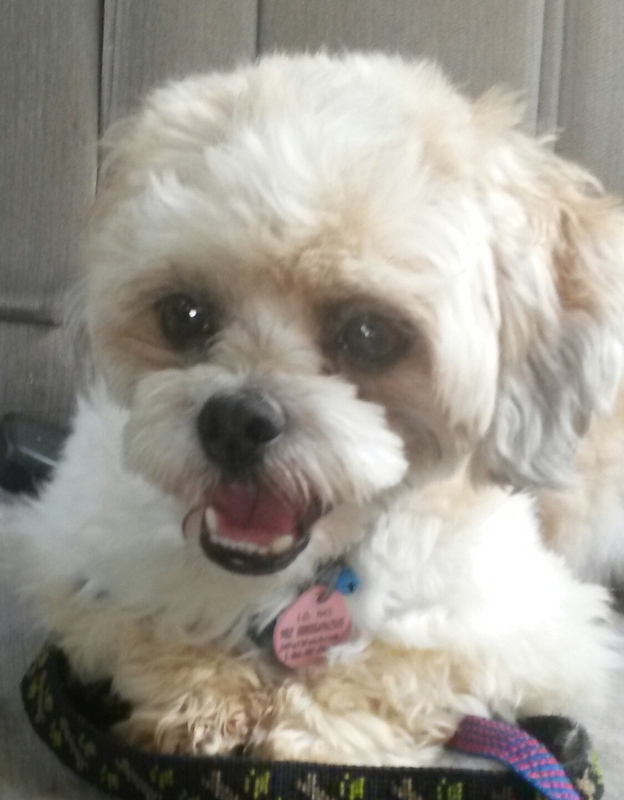 Adopted – BOGART – HAVANESE OR HAVAPOO BOY! Adopted! – DANNY – White & Café au Lait Toy Poodle Boy! Danny was surrendered by his owners at animal control with no reason. 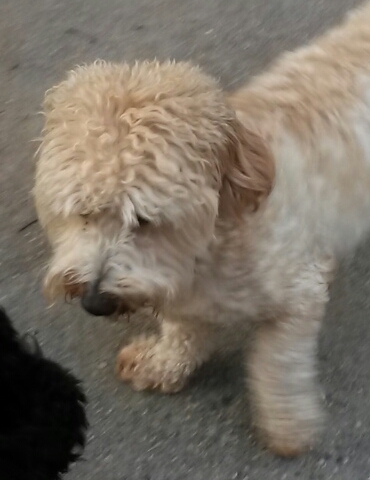 He is a beautiful parti-poodle with white fur and a few large café au lait spots. He gets along very well with other dogs and weighs about 10 lbs. 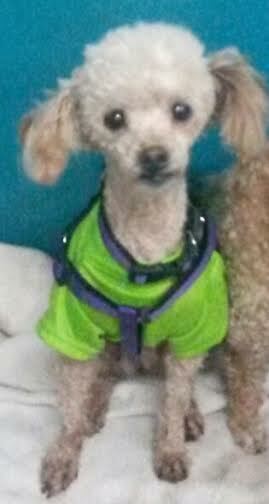 Nate is a small white male miniature poodle boy, weighing about 14 lbs, who is about 4 years old as of August 2013. He was picked up as a stray by animal control and no one claimed him so we took him into our program, neutered him, and updated him on his vaccinations. He is a very loving, sweet little boy and has a very good disposition. He is not hyper at all and loves to gently come up to your face and give you kisses. He will make someone a wonderful companion and is ready for someone to take him home with them! Newbie is a 5.1 pound blue teacup toy poodle girl surrendered by her owner so we can have her vetted and find her a wonderful home. Newbie’s former owner brought her to a large chain veterinarian to update her on her vaccinations before surrendering her. The vet chain performed a blood test after the vaccinations, which included the lepto vaccination, and they said she needed an immediate blood transfusion due to extreme anemia or she would die. The owner was in tears because she could not afford the $2,000. She brought her dog home in tears and was preparing for her dog to die. Then she was told about us and contacted us at 10PM…..we just happened to be on the computer then. We told her what we would do nutritionally if it were our dog as the dog could not be brought to us until the afternoon of the next day. The owner bought the items and gave it to Newbie and little girl devoured everything. The next day we picked her up and obtained a copy of the blood test. It was the weekend when this happened so the vet chain told us to keep an eye on her until our vet opened but to bring her to the emergency room if needed before then. Newbie’s gums were very pale and she was very calm in the beginning. We kept working our nutritional and psychological magic and by the time our vet was able to see her, she was full of energy, in good spirits, and her charming personality came out. We had our own blood test performed and we were able to bring her RBC count up considerably but our vet still wanted it up a few more points before we could spay her and have a dental performed on her. In another week, we will have another blood test performed on her to see if she is ready. Her gums are no longer pale and she is quite a charming little princess girl and lucky to be alive. Miracles have occurred here at Georgia Poodle Rescue once again. We are willing to show her in the meantime to interested people and will give updated information soon. Adopted! -:PATTI – WHITE TOY POODLE GIRL – Adopted! Adopted! – REMY – YOUNG MALTESE GIRL! Remy is a darling all white maltese girl estimated to be approximately one year old as of November 2013. She was given to us by a family of police officers who found her as a stray and could not locate her owners. She is cute, independent, yet cuddly and has a wonderful personality and is available to the right home who is familiar with the breed. Ruthie is a very cute white small toy size bichon girl who was adopted to a teacher. She lived with another bichon sister and the teacher for one year and was loved very much but the teacher moved to another country to teach English as a second language and sadly couldn’t take her dogs with her……so Ruthie is back with us (per our contract rules) so we can find her another great, loving home. ADOPTED +++SAM – BLACK TOY POODLE BOY – I came together with my sister Lilly. Sam is a toy size black poodle boy with a white bib. He is estimated to be about 1.5 years old as of August 2013. 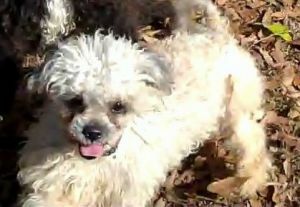 He was found roaming as a stray with his sister Lilly, a white toy poodle girl, and was brought to animal control. No one claimed them so we were called to find them a good home. Both are super sweet and happy little ones, spayed and neutered, and updated on their vaccines as well as heartworm tested negative. We are hoping that someone would like to adopt them together but if not, they can be adopted separately. ADOPTED!!! 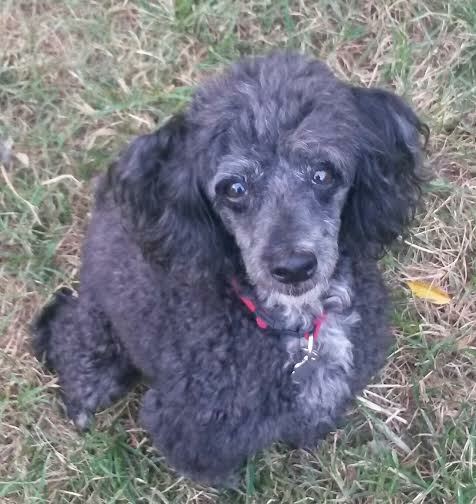 TIMMY – BLACK TOY POODLE BOY – ADOPTED!!! Adopted! – BEEBEE – FAWN TERRIER GIRL! - Adopted! Beebee is a tiny little dog about 9-11 months old as of January 2013. Beebee weighs about 13 lbs. We were at the vet’s office with her when a breeder walked in with her border terriers. The breeder thought that Beebee could be border terrier or border terrier mix and we think Beebee could also be Norfolk Terrier or mix.. Whatever she is, she is a cutie, is super sweet, and a happy little girl. 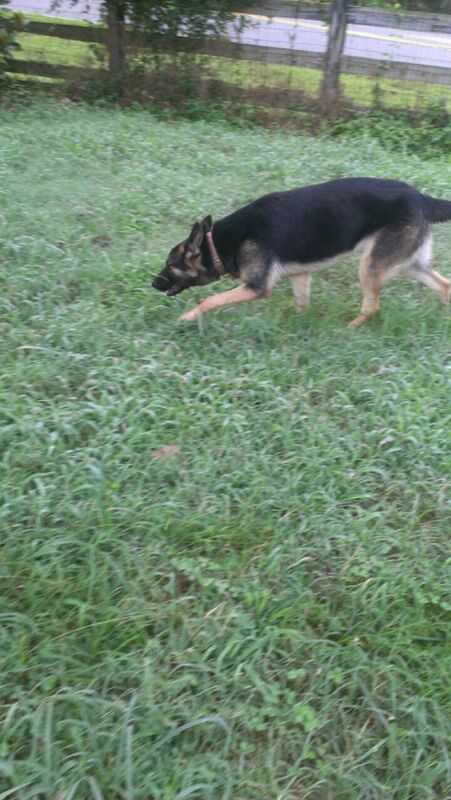 She loves to run, flies across the yard, and is very friendly with other dogs. Won’t you give her a great home? Adopted! – BOYCE – WHITE HAVANESE BOY! Boyce is a young adult white havanese boy. He was found as a stray in south Georgia and we were contacted by animal control to take him in. Boyce was found with the tip of his tail and some of his other fur dyed blue. All of that has changed now and he has turned into a beautiful dog. 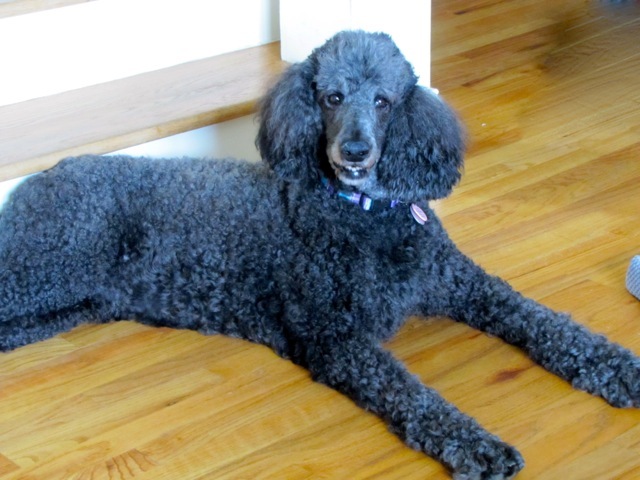 STORMY – AKC BLUE STANDARD POODLE BOY - ADOPTED!!! 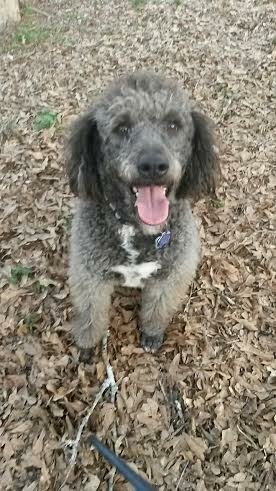 PROFILE: Stormy is a gorgeous AKC blue standard poodle boy born in 2009. He and his two sisters belonged to a groomer who fell on bad times and could no longer take care of them so he sold them together to stay together. The woman who adopted them also had a few AKC golden retrievers. She kept the two female standards and gave Stormy and one of her Goldens named Rufus to her daughter. Her daughter moved out of state due to a job change and gave them back to her mother. Five dogs was too much for her mother so her mother contacted us on Christmas Day 2013. Our president, missed her second Christmas party to help the dogs and drove over an hour to retrieve Stormy and his Golden Retriever brother Rufus. Adopt-A-Golden had an opening and had a similar philosophy of caring for and carefully placing their dogs so Rufus was transferred to Adopt-A Golden rescue, who found him a good home. Now it’s Stormy’s turn to go into a wonderful home……..and coincidentally, he will have a new brother who is a beautiful golden retriever! 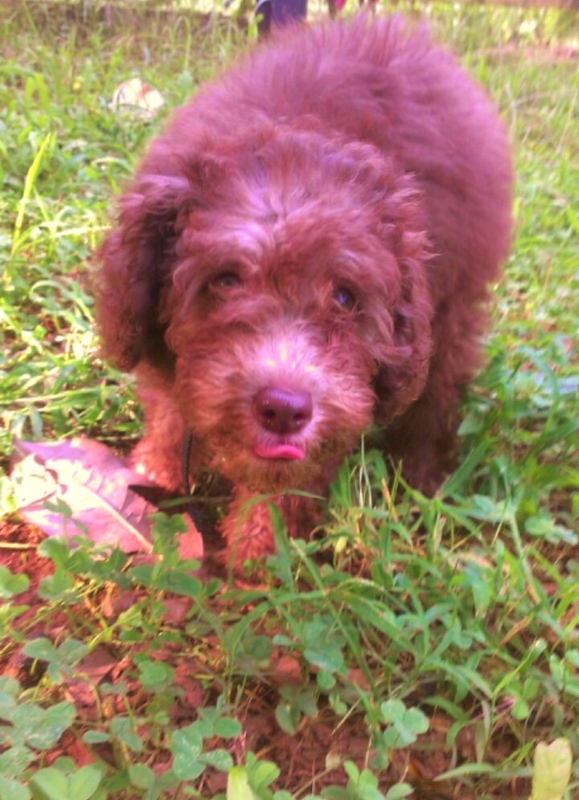 FRANKLIN – CHOCOLATE BROWN LABRADOODLE PUP!!! ADOPTED!!! Franklin is a very handsome chocolate brown labradoodle with blonde highlights. He was born 2/19/13 and is a big love full of fluff! He has a wonderful, happy personality and loves giving you kisses and being massaged. He loves to run outside and play with his humans as well as play with other dogs. His former owner was moving and couldn’t take him with her so she asked us to find him a great home. BROCK – BROWN STANDARD POODLE BOY – ADOPTED!!! Brock is a beautiful silver chocolate standard poodle boy that came to us resembling big foot. (see picture two) He was found as a stray and we were called by a rural shelter to take him into our program. We cleaned him up and found a beautiful silver chocolate young man . He was shy at first but we have been working with him and matching him with very playful dogs to bring out his personality. He now also knows how to shake paw! He is not a large standard poodle but is full of energy, has tested negative for heartworms, and we have updated him on his vaccines and neutered him. Brocks nice personality is coming out quite nicely and he loves to smile at you and play with you. Our vet thinks Brock is between 2.5 and 3 years old as of March 2013. CLYDE – WHITE STANDARD POODLE BOY ADOPTED!!! Bonnie and Clyde were separated but then were reunited when Bonnie’s adopters came back to adopt Clyde! Scroll down below to Bonnie’s profile to read the wonderful heartbreaking success story! 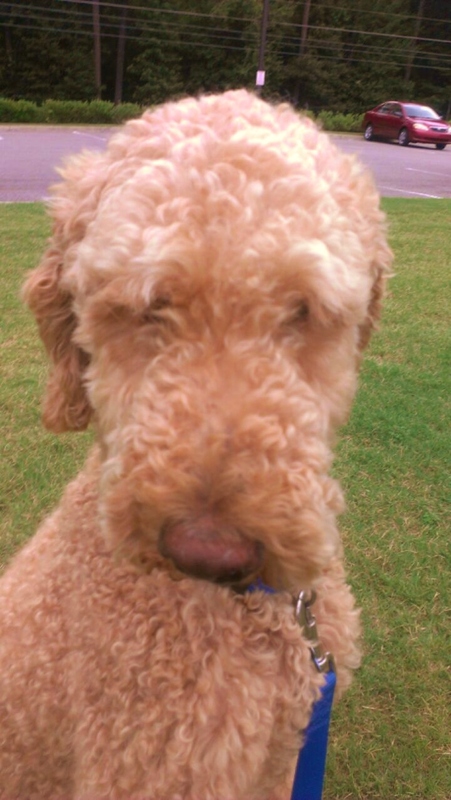 PROFILE: Clyde is a white male standard poodle about four years old as of January 2013. He was relinquished to us because his former owner could no longer keep him and wants us to find a good home for him. He came to us together with Bonnie. Bonnie was just adopted, now it is time for someone to give Clyde a loving home. He is absolutely adorable and sweet natured and has gone through our training program. He is smart and has a wonderful personality where he just wants you to love him. 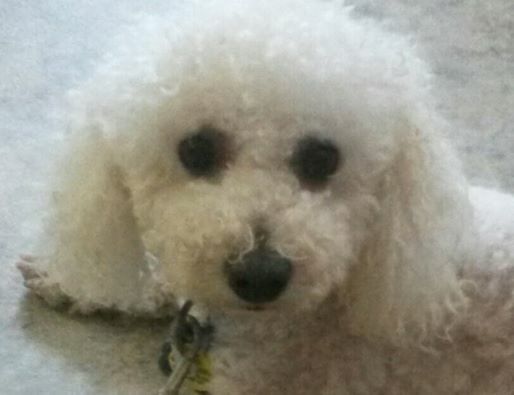 PIPPIN – WHITE MINIATURE POODLE BOY! – ADOPTED!!! Pippin was adopted into a family that absolutely adores him. Pippin was adopted in time to spend his first Christmas with his new family. His new dad is one of the top executives of an international news agency. PROFILE: Pippin is a very cute and very well behaved all white young miniature poodle boy possibly mixed with maltese with an undocked tail. His DOB is 10/2/11. His former owner adopted him from someone who purchased him but realized they weren’t ready for a puppy. The former owner asked us to find a very good home for him. He is updated on his vaccinations and we neutered him May 2012. He is ready for his new home and is a fun, playful, well behaved boy. He weighs about 15 lbs. The pictures show Pippin in a kennel in the car on the way to a meet and greet and having fun in the hay. He is very cute! 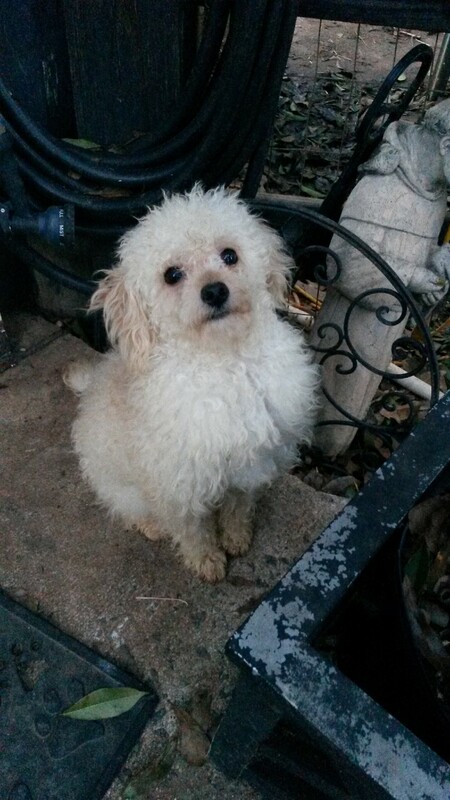 LLOYD – WHITE TOY POODLE BOY! – ADOPTED!!! Lloyd was adopted into a family in the medical industry. 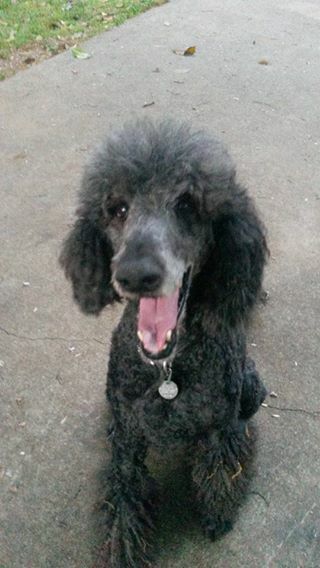 His new family lost their former poodle and noticed Lloyd and it was the perfect match! Lloyd absolutely adores them and they him. On the adoption day, Lloyd began making himself right at home with the many toys and blankets, beds, and treats available to him. 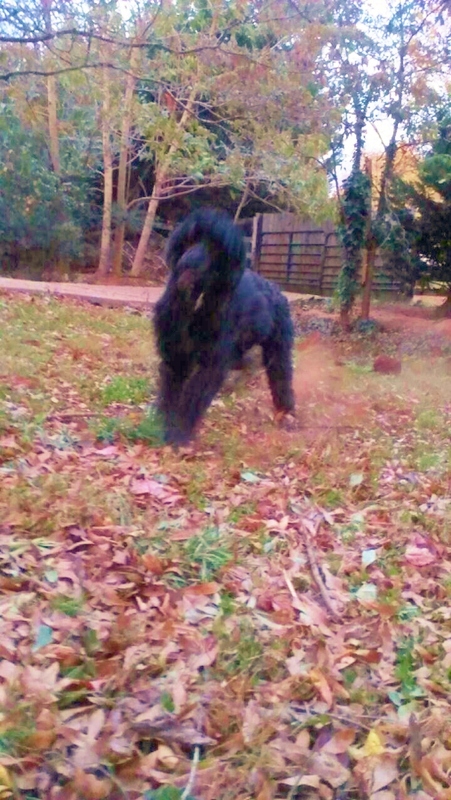 BONNIE – BLACK MOYEN STANDARD POODLE GIRL! – ADOPTED!!! Bonnie’s new home is absolutely crazy about this cute moyen size standard. Bonnie has a new senior golden retriever brother and a large yard to explore and play in with her new family as well as comfy beds and yummy food.,,,,,,,,,,,but something was missing. Bonnie seemed happy but seemed to be looking for something or someone around every corner. Her new mom is recently retired, is an equestrian participant, former horse owner, and enthusiast and is writing her memoirs and her new dad is in the construction industry. UPDATE: Bonnie and Clyde were with us for three long years and people wanted to adopt them separately…………but they were bonded and we wanted to keep them together. Three years later and still with us, we decided to heartbreakingly and diligently work on keeping them apart so we can adopt them separately and find them good homes……. but they always migrated back to each other. Bonnie was then adopted and she did well in her new home but something was missing………..and Clyde managed with us but still seemed to be looking for her. Bonnie’s new owners saw that Bonnie was happy but she seemed to have a part of her missing. Soooooooooooooo, they came back and adopted Clyde and said now their family is complete. They agreed that Bonnie & Clyde belonged together and the fairy tale lifestyle begins. Thank you for opening your homes and hearts to both babies and seeing that they belonged together and keeping them together! 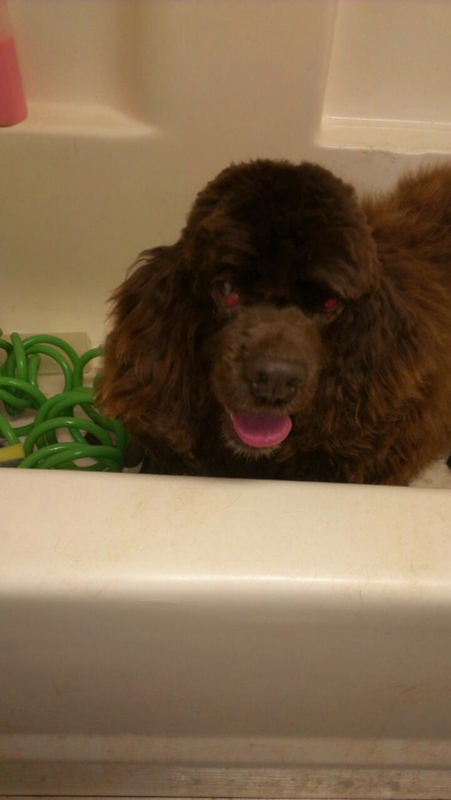 PROFILE: Bonnie is a black female poodle about 3 years old as of January 2012.. She is a smaller moyen standard poodle size about 40 lbs. She was relinquished to us because her former owner could no longer keep her and wants us to find a good home for her. She came to us together with Clyde, who is a white standard poodle. They are both absolutely adorable and sweet natured and have gone through our training program. ADOPTED – JEFFREY – WHITE MINI POODLE BOY! 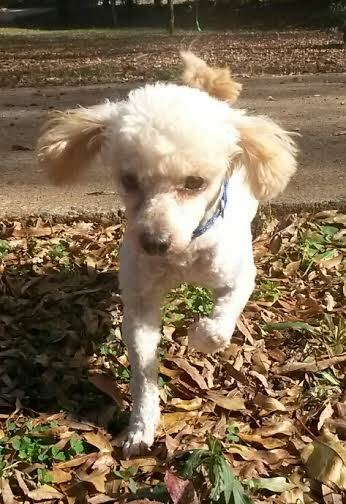 Jeffrey is a four year old white miniature poodle boy. He was an owner surrender to a south Georgia animal control facility and was there for 1.5 months. No one adopted him and his time was up. One of our volunteers saw Jeffrey and urgently acted and said she would foster this little boy until we found a home for him. But the shelter was four hours away one way! Pilot Karen, a private pilot in Sandy Springs came to Jeffrey’s emergency and flew down there in her plane and brought Jeffrey to safety with us! Thank you, Karen! We evaluated Jeffrey and found him to be a wonderful little boy with a great personality. He is calm, funny, cute, obedient and loves to snuggle. We had him neutered, hw tested negative, and brought up to date on his vaccinations and of course gave him a hair cut. Jeffrey is available and is waiting for his new family to take him home with them. Will it be you? f the music videos below first and then scroll down to view our adoptions while enjoying the music! REPEAT ADOPTERS BY COOPERS PARENTS! Pics coming soon! 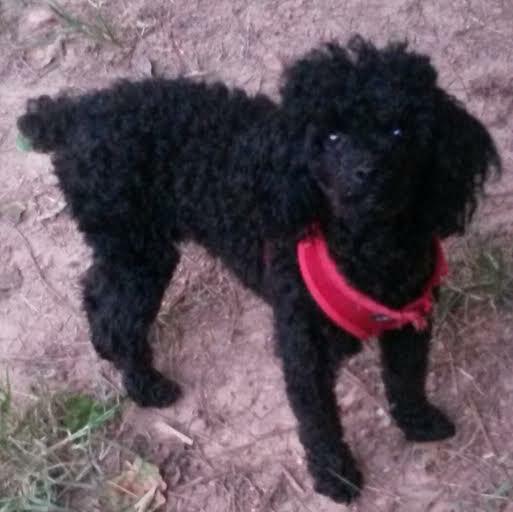 PROFILE: Bootsie is a 9 month old black female toy poodle pup with a white bib and 4 white socks. Her former owner purchased her from a pet store after she was widowed. She gave Bootsie a wonderful privileged life but her work schedule was just too busy and Bootsie was either in daycare all the time or alone. She asked us to find the right home for Bootsie who will cherish and love her and give her the time and attention she needs! Herman is a black havapoo with white socks and a white bib. He was picked up by animal control as a stray. No one came for him and we took the little boy, shaved all the mats off him, cleaned him up and a wonderful dog emerged. Herman learned his basic obedience commands very fast. He is a calm and very happy dog and loves to cuddle, go for walks, and told he is a good boy! 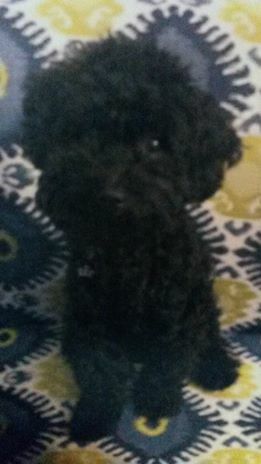 Gunny is a teeny, tiny, jet black toy poodle boy about 2-3 years old and weighing about 8.5 lbs as of June 2013. His former owners could no longer keep him because of their schedule change and asked us to find him a good home. Gunny has a great personality, is a happy boy, potty trained, walks on a leash, and is a good boy. He would do best in a home without small children as we wouldn’t want him to accidentally be hurt. He will sit with you for hours on your lap and be your constant companion. He is ready for his new home! 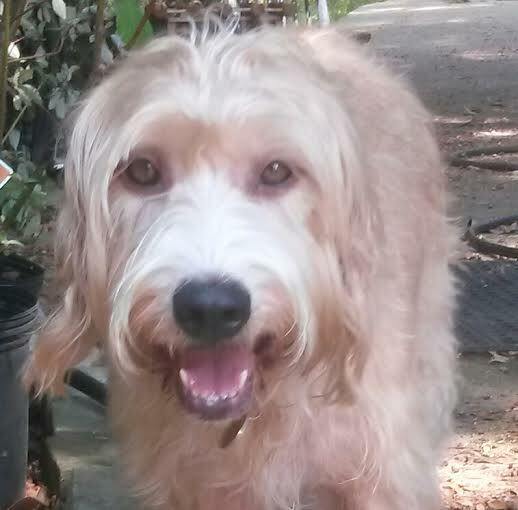 ADOPTED – ACE (now Radar) – CAFE AU LAIT/SILVER CAIRNDOODLE BOY! Ace is a gorgeous café au lait and silver cairn terrier poodle mix! He is approximately one year old. We picked him up from an outlying animal control facility where he was found as a stray. We neutered Ace and updated him on his vaccinations and heartworm tested him negative. He has a gorgeous café au lait/brown face with amber eyes and liver nose and silvery curls over his body. What a unique and beautiful combination! He has a very relaxing personality, loves to be held and be with his person, and is very obedient. He is ready to go to his forever home. ERNIE – BLACK AND WHITE POODLE MIX BOY! – Adopted!!! Ernie is approximately 1.5-1.8 years old as of August 2013. He was found as a stray by animal control and we took him into our program. 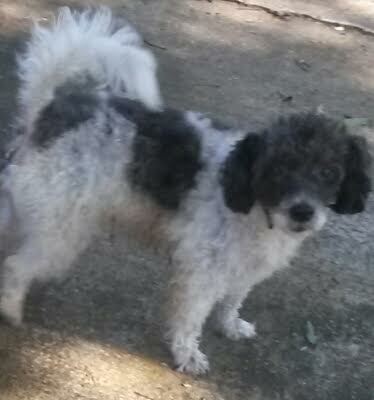 He is a black and white parti-poodle possible mix, weighing approximately 10-13 lbs and has a wonderful, loving personality and gets along very well with our other dogs. He is very sweet and would like to be adopted so people can love him every day. PENNY – TINY WHITE POODLE GIRL – Adopted! 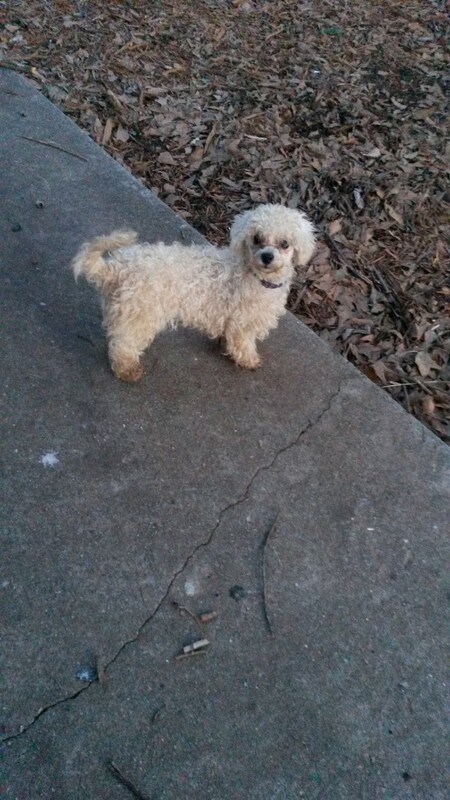 Penny is a beautiful, fluffy little white toy poodle girl with one ear that is café au lait coloring. She has a pink and liver nose and is very cute. She is estimated to be about one year old as of May 2013. We have spayed her, heartworm tested her, and brought her up to date on her vaccinations. Penny was passed around from home to home to families who thought she was cute but knew nothing about the care of a poodle. Penny found her way back to her original owner who was going to dump her at animal control or worse set her out into the streets but another family intervened, and although their finances were tight, they took her in and called us to rescue her and find her a very good home. Penny is very cute and has a wonderful personality. She loves to be with her person and is a quiet little girl content to sit on your lap and be your companion. 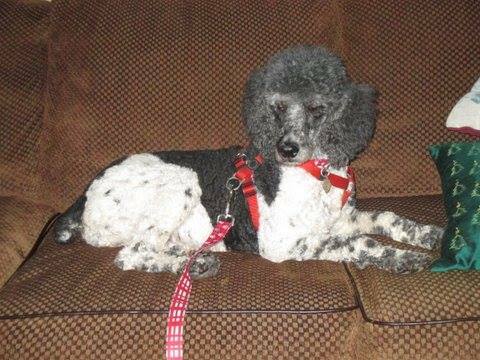 She is looking for a home who knows about the poodle care and personality and who will love her forever. Can you adopt this little cutie? APRIL – CREAM TOY POODLE GIRL PUPPY – ADOPTED!!! April is a very cute cream toy poodle girl puppy about 3.5-4 months old as of July 2013. The vet estimates April will not be more than 10-12 lbs as an adult. April has all her fluffy hair and a cream body with apricot ears. Her original owners did not care very well for their tiny dogs as they let them roam around without a leash, fence, nor supervision. As a result, April’s mother was hit by a car and the owner said they didn’t want April. A neighbor immediately stepped in to provide April a home and gave April to her friend. Her friend provided a good home for April and kept her safe but her work schedule of 13 hours a day just wasn’t fair to April so she gave April to us to find her a loving home where her new family could spend more time with her. April just came to us and we have an appointment to spay her in a few days. She is a cute and loving little girl. She knows her sit command already and she needs to be potty trained. She would make someone a wonderful little poodle girl puppy and is awaiting her forever home who can provide the care a puppy needs. OAKLEY – APRICOT STANDARD POODLE BOY – ADOPTED!!! REGIS – TINY CREAM TOY POODLE BOY – Adopted!!! LIAM – TINY BLACK HAVANESE/POODLE BOY PUPPY! - Adopted!!! Liam is a teeny, tiny, black havanese poodle boy weighing about 8 lbs. He was born 8/16/12 and is still a puppy. He is a well behaved and very obedient and very, very happy little puppy and just loves meeting new people. His former owner graduated, could no longer keep him due to a schedule change, and asked us to find this little guy a great home. He will do great in a home without small children as we do not want him to be accidentally hurt. He is potty trained, walks well on a leash, has such a happy and pleasant personality and is not yappy at all! He would be an ideal companion for someone in an apartment or a condo. He is so tiny that he cannot be left outside alone, even in your own back yard, and must always be on a leash on a harness while outdoors because a predator can easily carry him away very fast. ZACH- Black Moyen Labradoodle Boy – ADOPTED!!! 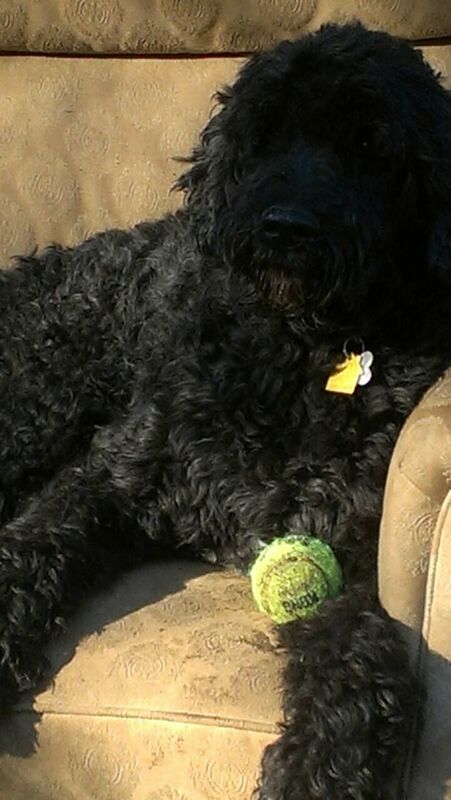 Congratulations to Joyce and Rick on their adoption of Zach, the moyen black labradoodle boy! In addition to new parents, Zach will have a golden retriever sister named Biscuit. Zach and Biscuit get along very well with each other and Biscuit even shares her bed and many other things with her new little brother Zach. Joyce and Rick will take very good care of Zach and have provided a wonderful home for him. Joyce is in the medical field. 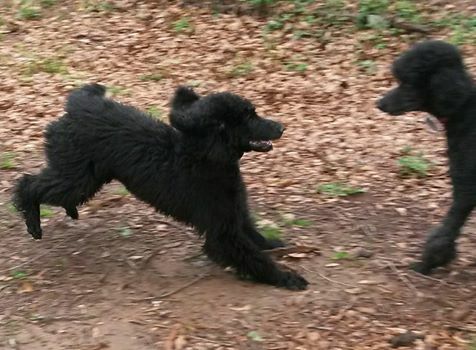 GEORGIE – Black Poodle Boy – PURE BRED! – ADOPTED!!! Congratulations to Lori on her adoption of Georgie, our black toy poodle boy! Lori recently lost her own dog and was ready to provide another a wonderful loving life! Georgie reminded her so much of her former dog that she requested to see only Georgie and no other dog! It was a match made in heaven and both absolutely adore each other! Lori is in the legal industry. PROFILE: Known history with us. 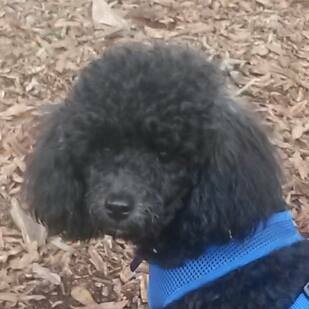 Georgie is a jet black toy poodle boy about 4 years old January 2013. He was found tied to a stop sign in a bad section of town. Animal Control took him in but couldnt adopt him out because he was viciously biting in the air but did not bite anyone. That environment and the trauma he may have suffered at the stop sign may have led to this temporary behavior. However, they couldn’t adopt him out that way. We were his only hope and made it to animal control minutes before he was to be put down. Georgie is now a very sweet, well adjusted, and happy little boy who loves people and loves playing with his size doggy friends. He is ready to go to his forever home with a female only as he still seems to not like males that much. He needs to be treated like the prince he is! Mylo – Young Blue Moyen Standard Poodle – Adopted!!! 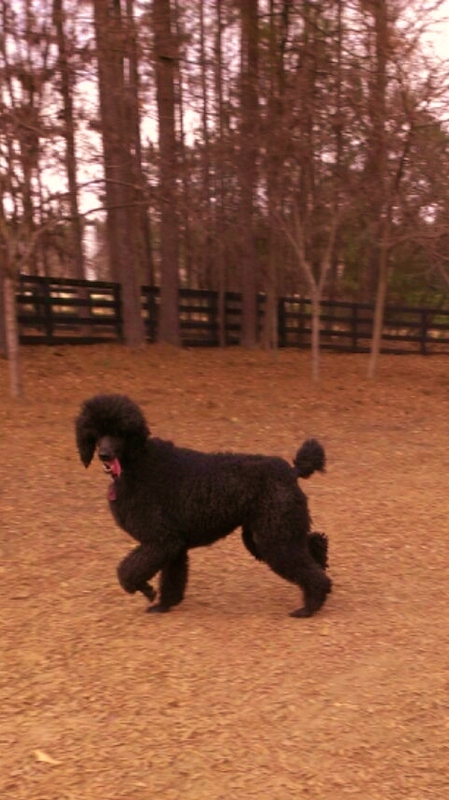 Congratulations to Frances of Atlanta on her adoption of Mylo, the blue moyen-sized standard poodle boy. Frances had already sent her application in, had a home visit, and was approved and was on our waiting list until the right dog came along……..and that was Mylo, who we brought directly to her and it was love at first sight! Frances works from home and is able to provide Mylo with a wonderful, loving home and lots of love and attention! Mylo will have two new kitty sisters and will get along with them fine as he was living with a cat in his former home. Mylo’s former owner could no longer keep Mylo and called us three times over a course of a few months until she was ready to relinquish him. She gave us much info. about Mylo and wanted us to find the perfect home for him………and we did! Max 4 – Young Portugese Water Dog – Adopted!!! Congratulations to Attorney Shelley and her husband Attorney Ken on adopting Max 4, their second adopted dog from us! Since Max is a portugese water dog, they chose to rename him Davi, which means David in Portugese! Davi and Sasha (formerly Marla) are wonderful together as if they have always been together! It couldn’t be a better match. Davi’s big sister Sasha will show Davi “the ropes” and live their life in luxury! MAVERICK-AKC – Very Tall Apricot Standard Boy -Adopted!!! Congratulations to Jennifer and Martin and their two daughters on adopting Maverick, our very large apricot standard poodle boy! They absolutely LOVE Maverick and their family couldn’t be a better fit for Maverick. Their vet loves him, too, and calls him “the golden boy”! Maverick absolutely loves children and is very loved in his new family with two new human sisters that he could watch over and be adored by! Maverick’s new parents are in the education industry. PROFILE: Owner surrender and known history. 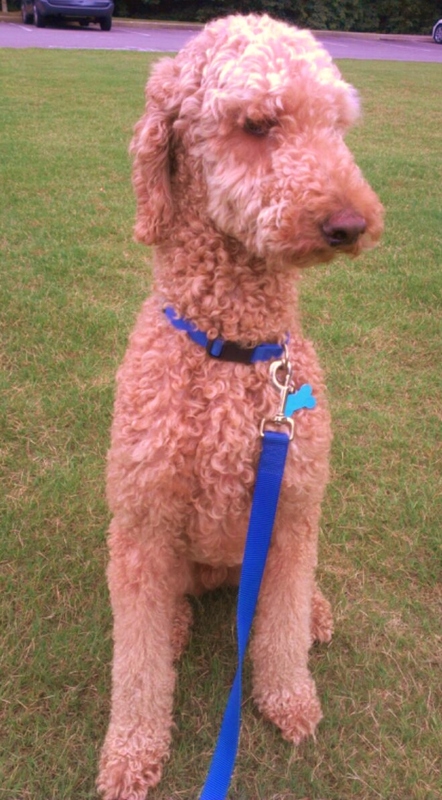 Maverick is a tall and handsome very light apricot standard poodle boy. His DOB is 12/11/07. He is an owner surrender due to a divorce and small children and having no time, money, and fence for him so his former owners contacted us wanting to find him a great home for him where he can run around in a protected fenced in yard with them and be loved and played wtih. He was purchased from an AKC breeder but they did not want him going back to the breeder. He is very sweet, very playful, very inquisitive and gentle and he gets along with other dogs and absolutely loves children Smart dog! 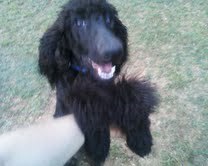 CESAR-Black Standard Poodle Boy Pup! - Pending Adoption! I’m waiting for my new brother in my new home to be neutered then I can join him and we can play, play, play. He and I are about the same age! Update: Ari, my new brother, was neutered and I’m going to my new home!!!! PROFILE: Cesar is a gorgeous black pure bred standard poodle pup, 5 months old as of February 2013. We have his AKC Certificate. He is updated on his vaccines, we have neutered him, and have microchipped him. He was purchased from a breeder and although his former owners loved him they wanted us to find him a home that can spend the time with him that a pup needs. Since both Cesar’s parents weighed about 80 lbs each, we expect Cesar to also grow to around the 80 lbs weight and size. Cesar has a wonderful, easygoing and fun personality, and already knows some of his commands. He walks great on a leash and loves, loves, loves, to play with his person and loves the company of and playing with other dogs. He loves to cuddle with his person. He is at the puppy chewing stage and needs his person to puppy proof his new home, give him chew toys, and spend lots of time with him without crating him away. You must have standard poodle ownership experience that can be verified by a vet to adopt this pup. CASSIDY-CREAM TOY POODLE BOY – ADOPTED!!! Congratulations to Matthew and Ashley on their adoption of Cassidy the cream toy poodle boy! Cassidy will have a new sister to play with named Tofu that is the same size as him and they can play, play, play! Matthew and Ashley take wonderful care of their animals and practice good nutrition with wholesome people food too! Matthew is in the IT industry and Ashley is in the dental industry and they will tell all their friends about us to help more of our dogs find good homes! BRISCOE – Black Lhasa Poo or Pom-a-PooBoy – ADOPTED!!! 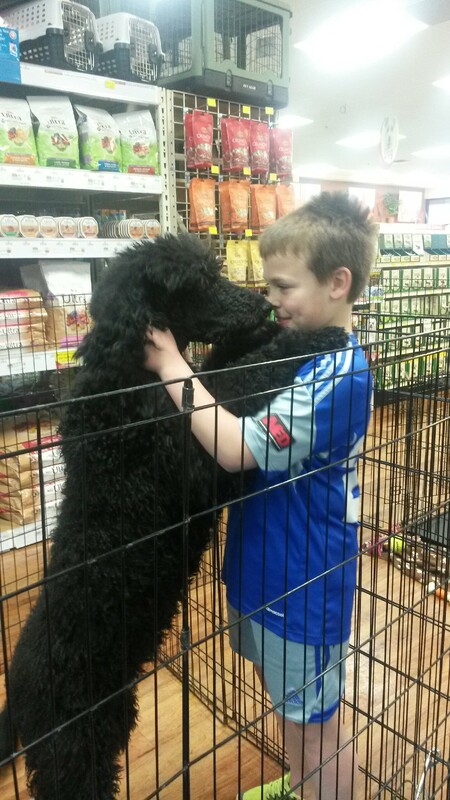 Congratulations to Dana and her two sons on adopting Briscoe the black poodle mix boy! Dana and her sons absolutely adore Briscoe and Briscoe them and they have a wonderful home and yard to play with Briscoe and give him all the love he deserves! Dana is in the banking industry and will tell all her friends about Briscoe and the other dogs we have that need a great home, too! 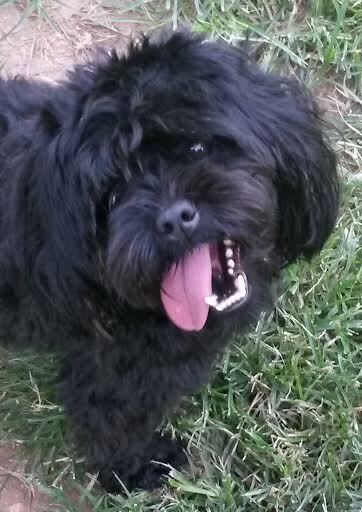 Profile: Brisco is an all black lhasa poo, westie-poo or pom-a-poo that has not shed at all. He was picked up as a stray by an outlying animal control facility. His time was up, we saw him, and we took the well-behaved little cutie into our program to find him a great home. He has a very nice and friendly personality, gets along with our other dogs, and is very willing to please. He loves to be with his person. He is estimated to be 1-3 years old as of January 2013. He weighs about 14 lbs. He would make someone a wonderful dog. Lucy – Purebred Red Toy Poodle Girl Pup – ADOPTED!!! Congratulations to Caroline and Steve on their adoption of Lucy, the red female toy poodle pup. Lucy will have a new one-year old red toy poodle brother named JohnE and will be living the life of luxury adorned with jewels and traveling with her new parents and brother everywhere including between her new yacht in Palm Beach, FL, her Buckhead, GA, home, and her Highlands, NC, home. Lucy will be the princess of the house and will even go to the office with her parents, which is very pet friendly! Lucy’s parents are in the investing and concierge services industries, also own a wonderful working farm and corporate retreat and will take very good care of Lucy. 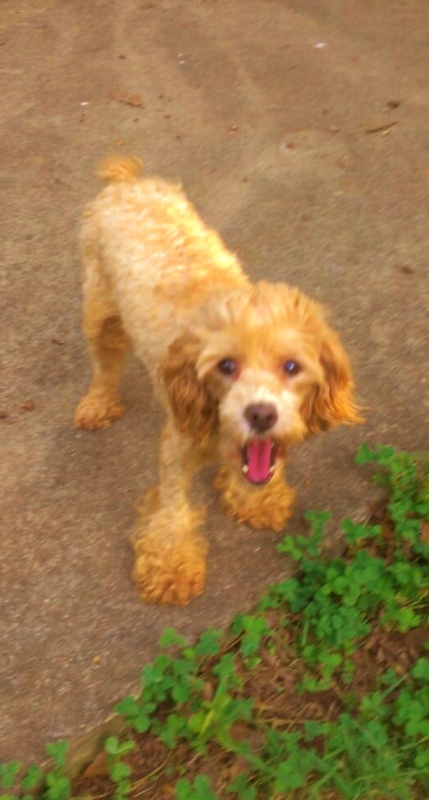 PROFILE: Lucy is a 6-month old registered red female toy poodle pup as of March 2013. She just came to us. She was born 8/3/12 and is a very sweet little girl and only weighs about 3-4 lbs. Her former owners job moved an hour away and she is not able to spend the time to tend to Lucy’s puppy needs due to travel time so she asked us to find Lucy a very good home who has the time for her. Lucy loves to be a lap dog and cuddle with her human or another very small and gentle dog her size. We have spayed Lucy and she is ready to go to her forever loving home. Since Lucy is so young, you must be home most of the time to tend to her puppy needs (play, potty train, care) and/or have another young dog her size for her to safely play with. SAMMY – WHITE STANDARD POODLE BOY – ADOPTED!!! Congratulations to Susan and Jeff on their adoption of Sammy, the white standard poodle boy! 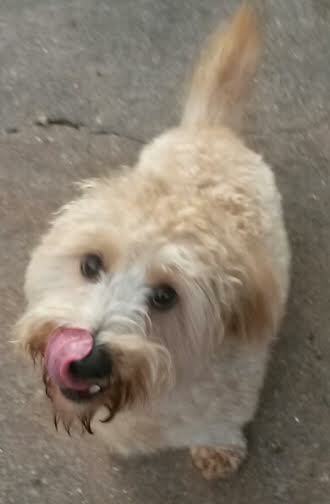 Sammy will have a little wheaten sister named Izzy and a beautiful yard and home and loving family to live his life with! Susan and Jeff are in the landscaping industry and have created a beautiful paradise in their backyard for Sammy to share in! They even installed a taller fence in preparation for one of our dogs! 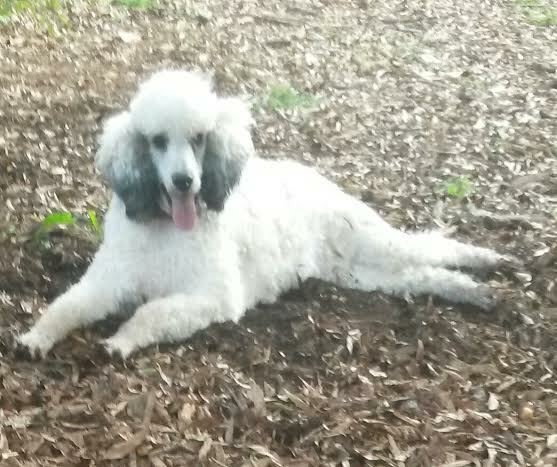 PROFILE: Sammy is a beautiful 3 year old neutered white male standard poodle who was given to us to find a home for. His former human mom lost her job because her school was closing and his former human dad is losing his fireman job in June. They had to sell their home, horses, property and are living in a small place. Although they have two toy poodles, they were not able to afford the upkeep of a standard poodle and although they loved Sammy very much, they knew we would find Sammy another loving home that he deserves and could enjoy his life in. CHIP – ( NOW CHILL) BLACK W/WHITE TOES CHIHUAHUA BOY W/DOCKED TAIL! – ADOPTED!!! Congratulations to Shaadi on her adoption of Chip (now Chill) the black and white chihuahua boy! Shaadi lives in Midtown in a very hip condo with a great view in the center of everything that she now shares with Chip and is in the advertising industry where she could bring Chip with her to work every day! 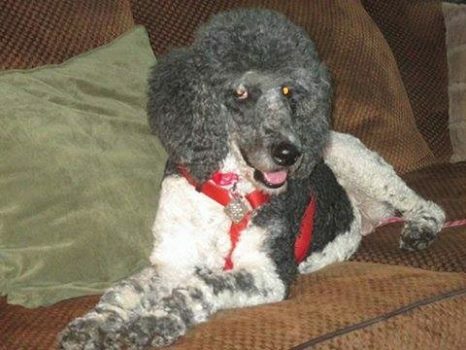 PROFILE: Chip came to us by accident on a transport along with a poodle. He is a very cute long haired and uniquely colored black chihuahua with white toes and bib and long hair around his neck, erect ears, and a docked tail. He is about 1.5 years as of January 2013. We neutered him and updated him on his vaccinations and this happy little boy is ready to go to his forever home. Will you be the home to love him? POLO – Cafe au Lait Mini Poodle Boy! - ADOPTED TOGETHER WITH ADAM!!! Congratulations to Karen on her adoption of Polo, cafe au lait mini poodle and Adam, cream mini poodle! Karen is in the healthcare industry and has a wonderful home and yard that both Polo and Adam absolutely adore and they have quickly bonded with her and follow her around like little shadows. Karen also has a few parrots in which both dogs and parrots entertain each other! PROFILE: Owner surrender and known history. 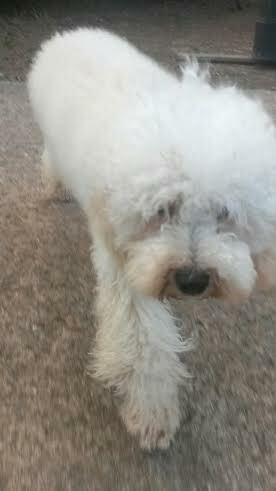 Polo is a gorgeous cafe au lait miniature poodle boy about 2 years old as of January 2013 and weighs about 15 lbs. He was found in a small carrier in a parking lot in the heat of summer with no food and no water. He was dehydrated and starved and was found just in time and brought to the veterinarian. A vet tech had him vetted and cared for him all this time and tried to find his owner but to no avail. so he asked us to find him a good home. 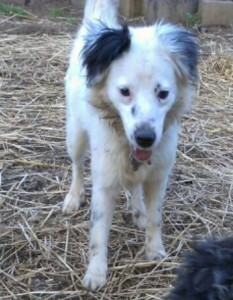 Polo is fun, very well natured, and a very easygoing little boy. He is a real sweetie and a very happy liittle boy who loves to play and cuddle and he is waiting for you to bring him home. ADAM – MINIATURE CREAM POODLE BOY! – ADOPTED TOGETHER WITH POLO!!! SEE CONGRATS ABOVE! PROFILE: Known history with us. 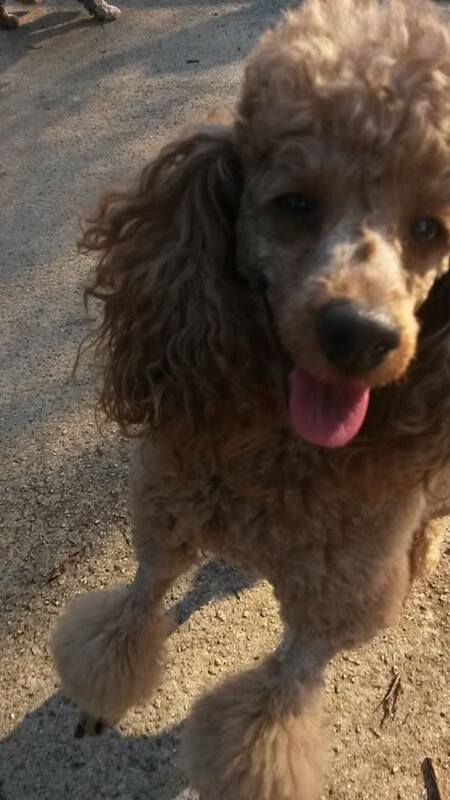 Adam is a gorgeous approximate 2 year old as of January 2013 cream miniature poodle boy. He is very sweet, loves to play and run around with dogs and people and loves to cuddle. He was picked up as a stray by a high-kill outlying animal control facility and his owners never showed up. We saw the matted and dirty little boy, took him into our program, groomed and trained him and he transformed into a wonderful little boy. He is waiting to meet you and go home with you. REGGIE – Apricot Toy Poodle Boy – I’m a Tiny Boy About 7lbs! – ADOPTED!!! Congratulations to Ann and Dan on their adoption of Reggie the apricot toy poodle boy! Both Ann and Dan are in corporate America, but Ann gets to work from home several days a week, which is great for the dogs! Reggie has a new doggy brother named Buddy and a new human sister to give him all the love he needs! All absolutely adore him! PROFILE: Reggie is approximately 1 year old as of January 2013. His owner brought him to us because they couldn’t care for him and wanted us to find a good home for him. He was neutered and brought up to date on his vaccinations and heartworm tested and we are slowly putting weight on this tiny little guy who weighs about 5-6 lbs. He is super sweet and very cuddly, loves to sit in your lap, be held and snuggled and be with you and he is looking for his forever home. BERKELEY – YOUNG SILVER/WHITE/BLACK LHASA POO BOY!!! – ADOPTED!!! PROFILE: Owner Surrender. 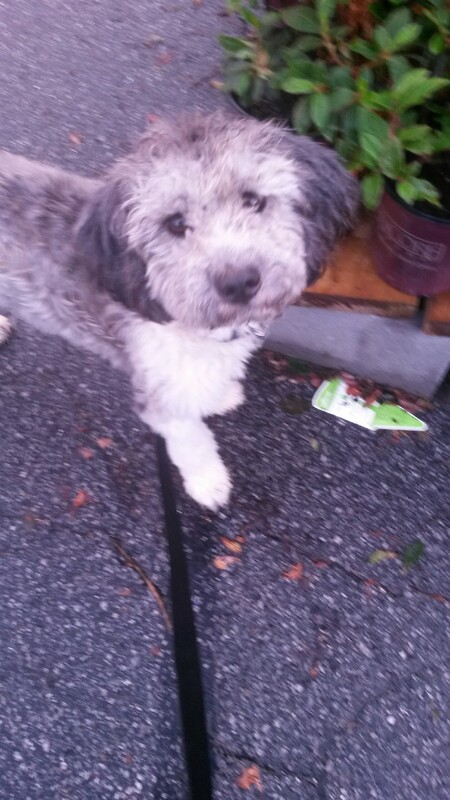 Berkeley is a silver and white lhasa poo pup who is approximately 13 months old as of January 2013. He is a miniature size and weighs 24 lbs! 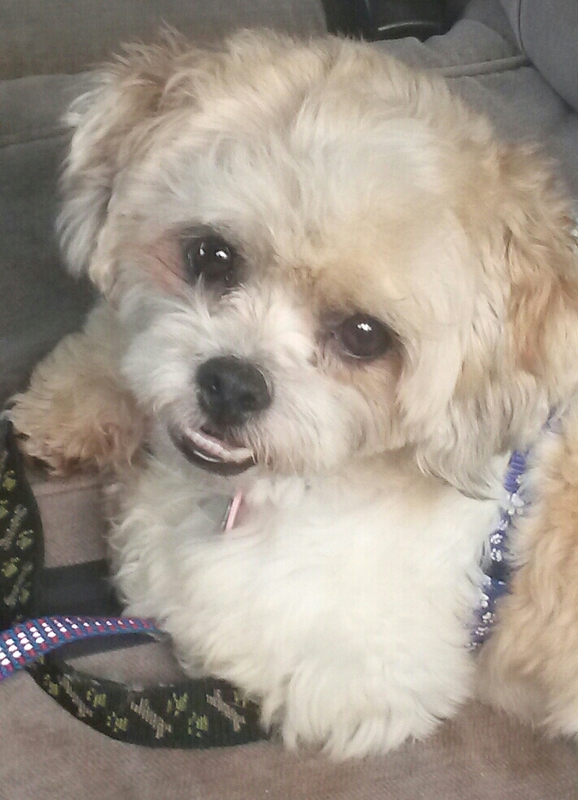 He is a happy, fun, and playful little guy who always has that perpetual lhasa poo smile on him! He gets along with all our dogs and just loves to play, play, play and be cuddled. His former owner couldn’t keep him because she was moving and turned him into a high kill animal control facility. We are looking for a home for him that has another dog for him to play with and the time to devote to a young dog’s needs and treat him like a little prince! Will you give him a great home? DUCHESS – APRICOT TOY POODLE GIRL! – ADOPTED!!! Congratulations to Rebecca and Steven on their adoption of Duchess the apricot toy poodle girl! Duchess will be living in a very trendy historical loft in midtown with her new parents. The building is extremely dog friendly and even has it’s own dog park! Duchess will be spoiled with love by her new parents and treated like the little princess she is and deserves. Steven is in the Information Technology Industry and Rebecca is an architectural restoration preservationist. BAXTER – BLACK STANDARD BOY! -Adopted!!! Baxter is a beautiful black male standard poodle born 12/28/09, who came together with his chocolate brown sister named Lady. Lady was adopted and now it is Baxter’s turn to find a forever loving home! Baxter weighs about 60 lbs, and we have his AKC papers. Their former owners gave them to us because the wife developed a debilitating medical condition and could no longer care for them. They wanted us to find them a great home where their owners will be able to care for them and give them the time and good life they deserve. 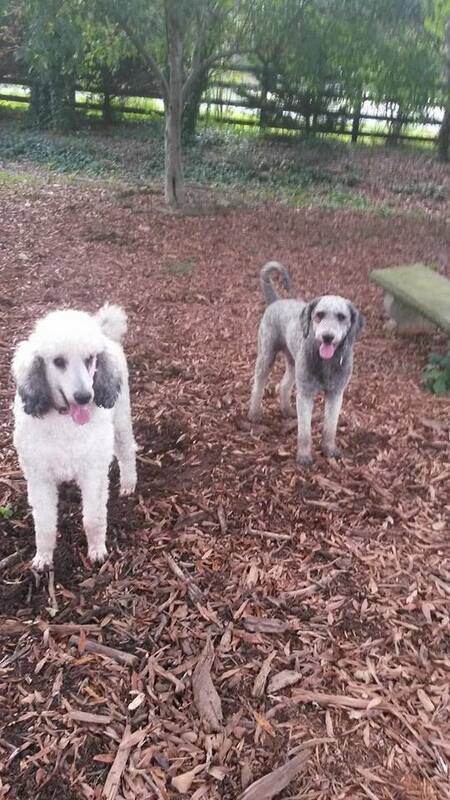 Both dogs are friendly, very easygoing, love to play and love other dogs and people. He is well behaved and obedient and are looking for their forever loving homes. Will it be you? LOLA – White Malti Poo Girl!-Adopted!!! PROFILE: Known History with Us. 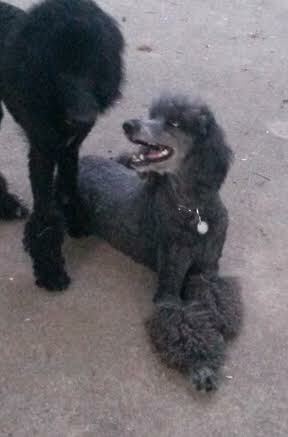 Hershey is a very cute jet black small miniature poodle boy who is approximately 2.3 years old as of January 2013. He was picked up as a stray from animal control and no one came to claim him. That environment is very scary for dogs and he was scared but once he was removed from that scary environment and into a home environment where he receives love and good food and gets to play with other dogs his size, he became a loving and appreciative little boy. He and Darcy could be twins!. JACKIE O – Tiny 5 lb Black Havapoo Girl-ADOPTED!!! Congratulations to Sharon on her adoption of Jackie O (now Sterling) the tiny and beautiful black and white havapoo girl! Sharon is a retired corporate america executive from the telecommunications and banking industries. Sharon lives in the heart of Buckhead and has opened her beautiful home to Sterling to live the ultra posh life! Chester was also adopted by one of Sharon’s neighbors and both neighbors and dogs will be able to have doggy outings together. PROFILE: Jackie is a 5 lb black female havapoo estimated to be about one year old as of January 2013. She was found as a stray in an outlying community by animal control. No one came to claim her and one of our volunteers saw her and brought her to us. She had an entire body mat (see pics-3rd pic shows the beginning of clipping) and we had to slowly clip away, which took a few hours. Her hair is now growing in very nicely, we have spayed her, updated her on her vaccinations and she has tested heartworm negative. She has a very loving and sweet personality and loves to cuddle with you, give kisses, and follow you around….and is looking for her loving home! She is a true lap dog! CHESTER – I AM A TINY BOY ABOUT 7 LBS-ADOPTED!!! Congratulations to Brenda on her adoption of Chester the tiny but very handsome and personable blue toy poodle boy! Brenda is retired and lives among in the heart of Buckhead and has opened her beautiful home to Chester to live the ultra posh life! Jackie O was also adopted by one of Brenda’s neighbors and both neighbors and dogs will be able to have doggy outings together. PROFILE: Known history with us. Chester is an absolutely gorgeous blue neutered young toy poodle boy. His former owner had cancer and could no longer care for him so he ended up in animal control. We were contacted to bring him into our program. His evaluation shows him to be a very bright, sensitive, and obedient little boy. He is very calm and is not hyper at all. He is potty trained and loves to be held. He loves his people and loves praise. We are looking for a wonderful home to give him a good life. LADY – CHOCOLATE BROWN POODLE GIRL! ADOPTED!!! Congratulations to Tom and Bettye on their adoption of Lady (now Lady KoKo), the chocolate brown standard poodle girl. Tom is a state commissioner and Bettye is recently retired from government. They instantly fell in love with Lady’s charming smiles and cuddles and her very relaxed yet playful demeanor. Lady will live the life of luxury in their beautiful home. She will have her own bed upstairs, on the main level, and in Tom’s office where she can come to work with him. 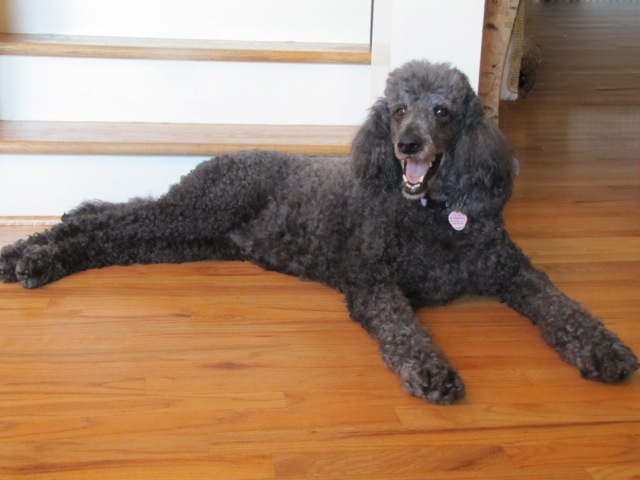 PROFILE: Lady came together with her brother Baxter, a black fun, and very well behaved standard poodle boy! 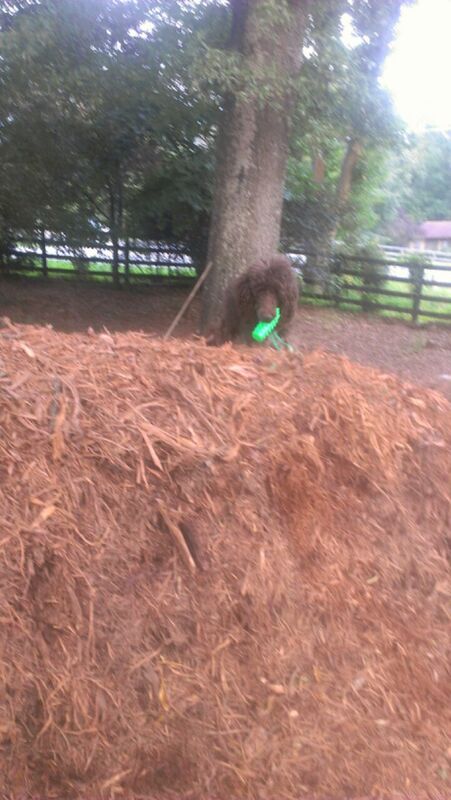 Lady is a beautiful chocolate brown female standard poodle born 8/31/08. Both weigh about 60 lbs. We have their AKC papers. Their former owners gave them to us because the wife developed a debilitating medical condition and could no longer care for them. They wanted us to find them a great home where their owners will be able to care for them and give them the time and good life they deserve. Both dogs are friendly, very easygoing, love to play and love other dogs and people. They are well behaved and obedient and are looking for their forever loving homes. Will it be you? STACEY – CREAM SHIH-POO GIRL!-ADOPTED!!! Congratulations to Melissa and Dale on their adoption of Stacey the female blonde Shih-Poo girl! Stacey will be living in a country club private, exclusive community and will have the best of everything! Melissa is an educator and Dale is in the accounting and utility industries. Both are able to provide Stacey with the time and attention she needs and give her a wonderful life. 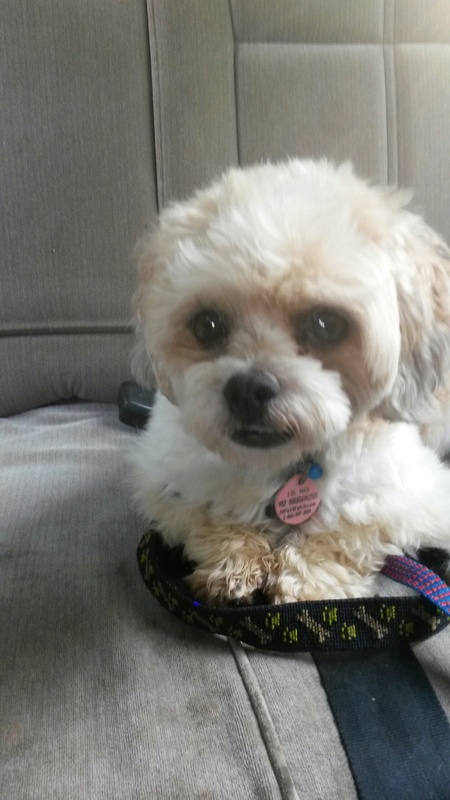 PROFILE: Stacey is a beautiful cream colored shih-poo girl. She is very cute and very sweet around 3,2 years old as of January 2013. She loves all our other dogs and is a happy girl all around. Her former owner could no longer keep her and sadly brought her to animal control. We were told about her and took the little girl into our program. She is waiting for her forever home to adopt her where she can give you lots of kisses and happiness! 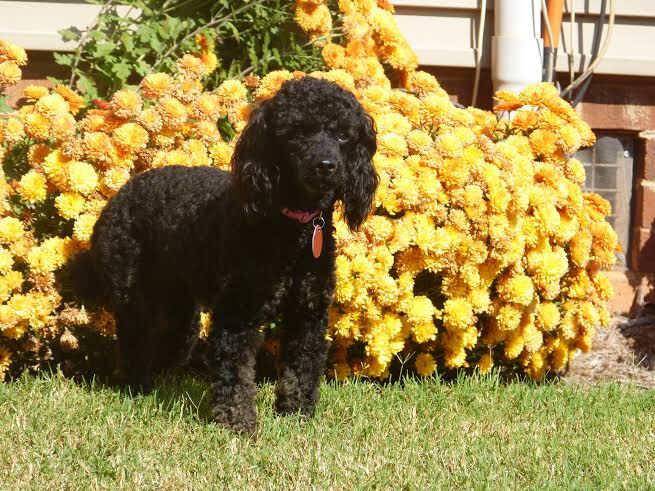 DARCY – Black Mini Poodle Girl – PURE BRED! - ADOPTED!!! 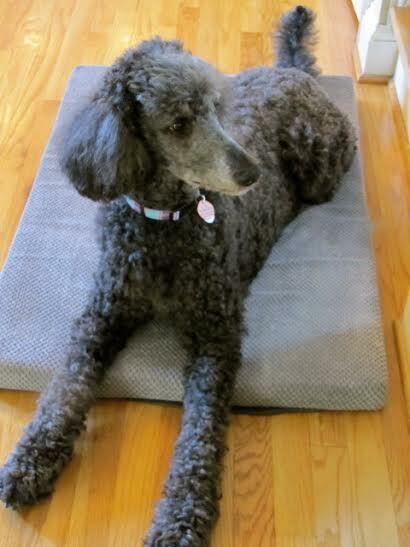 Congratulations to Gina and Mike and Mike on their adoption of Darcy the black female pure bred miniature poodle. Darcy will be living in a golfing community, will be pampered to the max, and vacation with her new family in her nearby lake house! Gina is a teacher in the education industry and Mike is a superior court judge in the law community. Darcy adores them and they her and it was love at first sight when they met. Mike and Gina will be able to provide Darcy a great life! 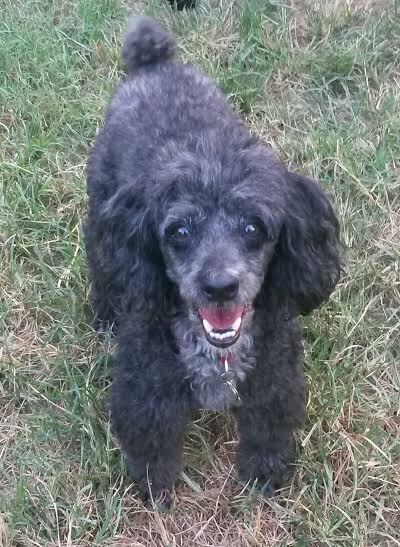 PROFILE: Darcy is a young beautiful all black toy poodle girl weighing about 12 lbs. Her date of birth is 5/5/10. She was purchased from a breeder. Her former owner didn’t have the time to give to Darcy and asked us to find Darcy a good home that will have time for her and treat her like a little princess. Darcy has a very friendly, easygoing, and fun personality! She loves to follow you around and cuddle with you. She gets along with our other dogs and is waiting to find her forever home. SADIE-Black and White Miniature Schnauzer Girl-ADOPTED!!! Congratulations to Angela and Ronnie on their adoption of Sadie the beautiful and uniquely colored black and white tiny schnauzer girl! Angela and Ronnie are both educators and have given Sadie a beautiful home as her castle where she can be treated like the princess she is! PROFILE: Known history with us. Sadie is a gorgeous miniature size black and white female schnauzer who’s owner could no longer keep her and dumped her at animal control. Sadie has a great happy personality, is obedient, and has the gorgeous black and white markings that we have not seen before in a pure bred schnauzer, which she is. She has the cropped ears and docked tail. Her time was up at animal control and we pulled her into our program when we were pulling a poodle the same day. Won’t you give Sadie the home she deserves? LOUIE – WHITE TOY POODLE BOY & RUPERT – BLACK STANDARD POODLE BOY – ADOPTED TOGETHER!!! Congratulations to Rick and Alicia on their adoption of Louie the white toy poodle boy and Rupert the black standard poodle boy together!!! They originally thought they only wanted to adopt one small dog but when we also brought Rupert, Rick and Alicia fell in love with both of them and adopted them together! Rick and Alicia are executives in two top major companies in the health and banking and real estate industries and they have provided both Rupert and Louie a beautiful wonderful home with several plush beds for the furkids, a new fur brother, and a great big back yard to play in! 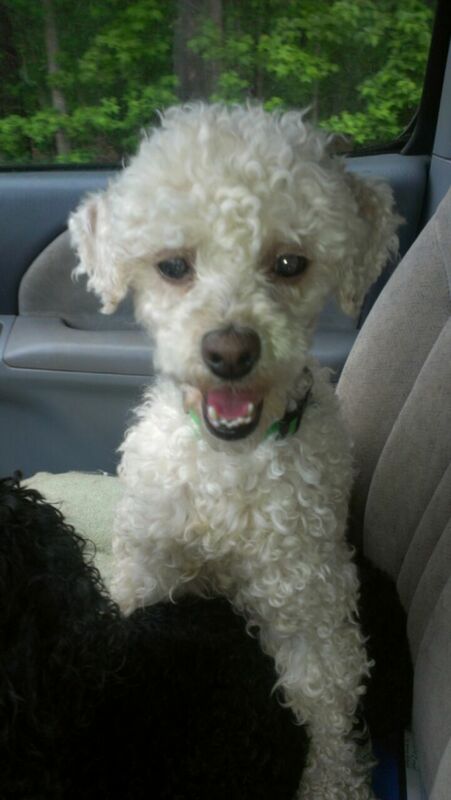 Profile: Louie is a beautiful six year old bright white toy poodle boy born 4/14/06 weighing about 10-11 lbs. His original owner fell ill and went into a senior home. Family members took Louie in but they already had two large dogs so they contacted us to find Louie a good home. Louie is a friendly, very sweet, and quiet dog with a very gentle and happy spirit. He gets along with our other dogs and is also cat friendly. He has a smile and a wagging tail to all new people he meets. PROFILE: Owner surrender and known history. Rupert is a tall, dark, and handsome black neutered and very gentle standard poodle boy about 2-3 years old as of March 2012. He was purchased from an AKC breeder but we do not have his paperwork. He weighs about 65 lbs and he loves to run and play with the other dogs outside for hours at a time or be a loner with his person. He can be the greatest couch potato or he can be great with other dogs.. A volunteer drove ten hours round trip to rescue Rupert and Roulan Rouge to get them to safety. He has a great personality and will scale or jump on something nearby a five foot high fence if there is something on the other side he wants to be near. He is kind, gentle, handsome, smart and playful and will make someone a wonderful dog. PINKIE-Black Standard Girl-Natural Long Tail – ADOPTED!!! PROFILE: Known history with us. 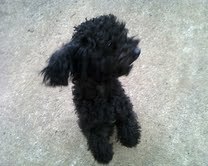 Pinkie is a beautiful young black affectionate poodle girl who is two years old as of January 2012. She has an undocked natural tail and is very sweet, affectionate, and sensitive. She jumps up and runs like playful poodles do, almost skipping across the lawn. She loves to be with her person no matter what they are doing….and she gives uncontrollable kisses We do not want her nor any of the dogs we adopt to be yard dogs where they are left outside all day or evening. Updated pictures coming soon. DOOGAN-White BICHON BOY – ADOPTED!!! Congratualtions to Mary on her adoption of Doogan the white male bichon! Mary is in upper management in the hotel and restaurant industries and she has provided cute little Doogan a wonderful home and a new fur sister where they both will be loved and can play to their hearts content and live like the little prince and princess they are! Pics comings soon! PROFILE: Known History with Us. We were contacted to take Doogan into our program. He is a young one to three year old very fluffy white male bichon or bichon poo.He was pulled from a high kill animal control facility. He is a super sweet, happy, and loveable little boy with a perpetual smile on his face. He gets along with our other dogs and loves to be the center of attention or could be your couch potato. DAISY – PUREBRED YORKSHIRE TERRIER – ADOPTED!!! Daisy is a beautiful black and gold female yorkshire terrier. Her papers have a birthdate of 11/9/09. Daisy weighs about 12 lbs and is a happy, well behaved, socialized, relaxed, fun, and sweet little girl who loves to carry a stuffed animal toy around with her, gets along well with other dogs, and loves to be by her person! She was surrendered along with Baby, the bichon frise and Shadow the toy poodle from the same family who could not keep their dogs because they lost their jobs, their home, and were moving into an apartment and could not afford to bring their beloved dogs with them. Sadly, they gave them to us to find them a home. BABY THE BICHON WAS ADOPTED! SHADOW THE TOY POODLE WAS ADOPTED! Now it is Daisy’s turn! Will you give her the good home she deserves? Molly – Cavalier Mix – ADOPTED!!! Congratulations to Joyce and Warren on their adoption of Molly, the strikingly colored chocolate red with blonde feathering cavalier mix female! Joyce and Warren applied for another cutie but when they saw Molly all three of them couldn’t let each other out of their sight! Joyce is a retired educator and Warren is retired from the telecommunications industry. They absolutely adore Molly and she them and all three are living the life of Riley.Profile: Molly is a beautiful approximately 3 year old, long-haired spaniel mix weighing about 12 lbs. She has floppy ears and may be mixed with king charles spaniel and something else but does not have the spaniel jaw jowls. She is a gorgeous chocolate brown color with blonde feathering on ears, tail, and feathering on legs and toes. She has an extremely relaxed personality. She is friendly and charming and will make someone the perfect little house dog. Why don’t you meet this pretty girl? KATE – Deep Chocolate Brown Standard Female-ADOPTED TO ATTORNEY CAROL IN MARIETTA!!! 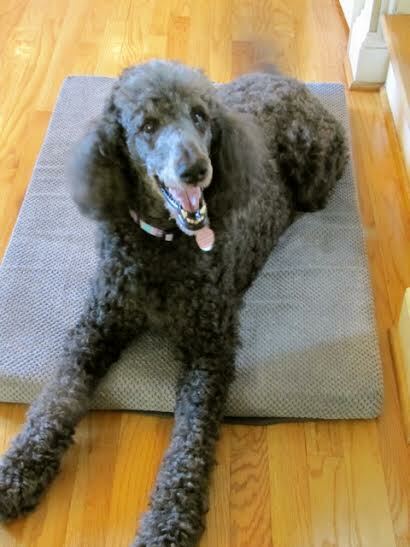 Congratulations to Attorney Carol of Marietta on her adoption of Kate, the deep chocolate standard poodle girl! It was love at first sight when both met each other. She was very impressed with Kate’s demeanor, obedience, and happy disposition! Kate has a beautiful large yard that she likes to explore in and she will be able to go with her new mom and brother on trips to their mountain cabin on the lake! Kate has a new bassett hound brother named Leo and both go to daily daycare where they can play with other dogs while their mom is working. Carol said the daycare were all raving over Kate, Leo is even happier, and she is very smitten with her chocolate girl! Profile: Kate is a young beautiful deep chocolate brown standard poodle girl born January 8, 2011. She loves to run and play and is friendly with all our dogs both small and large. She has a pleasant personality and is obedient. We have her CKC certificate. She has a small sliver of white on her chest and a white bracelet above her right front paw. The interim people who had her obtained her from a physician who did not have time to devote to Kate because she had several foster children and was applying for more. Kate was driven to us by the out of state interim couple asking us to find her a good home where she receives the love, time, and attention she deserves. 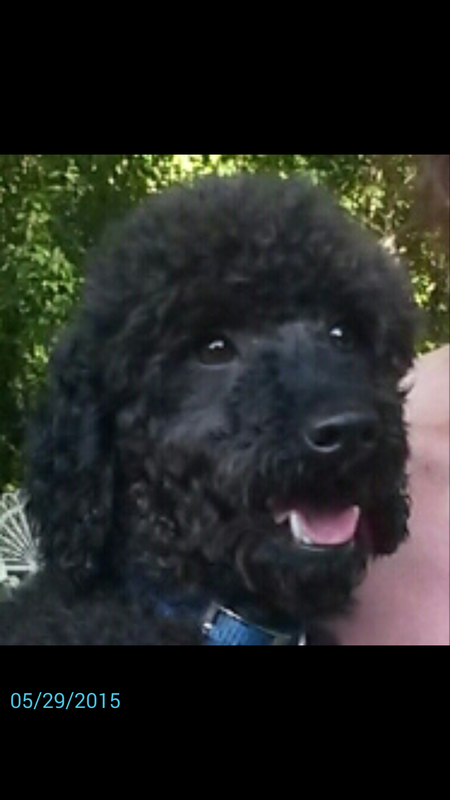 MITCH-Black Moyen Poodle Boy – ADOPTED!!! PROFILE: Known history with us. 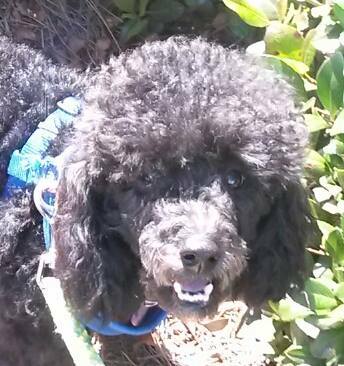 Mitch is a handsome black moyen poodle boy about 4 years old who came from animal control. He was very hyperacrive when he came to us and with patience and training andt time and maturity he is no longer hyper. He loves to go for walks, hang out with dogs his size, and be with his person He weighs about 30 lbs. WESLEY-White Pomeranian Boy – ADOPTED TO JERRI IN DANIELSVILLE!!! Congratulations to Jerri and her family in Danielsville on their adoption of Wesley (now Bobby) the white pomeranian boy! Jerri is very familiar with the pomeranian breed as she’s owned several of them throughout the years. 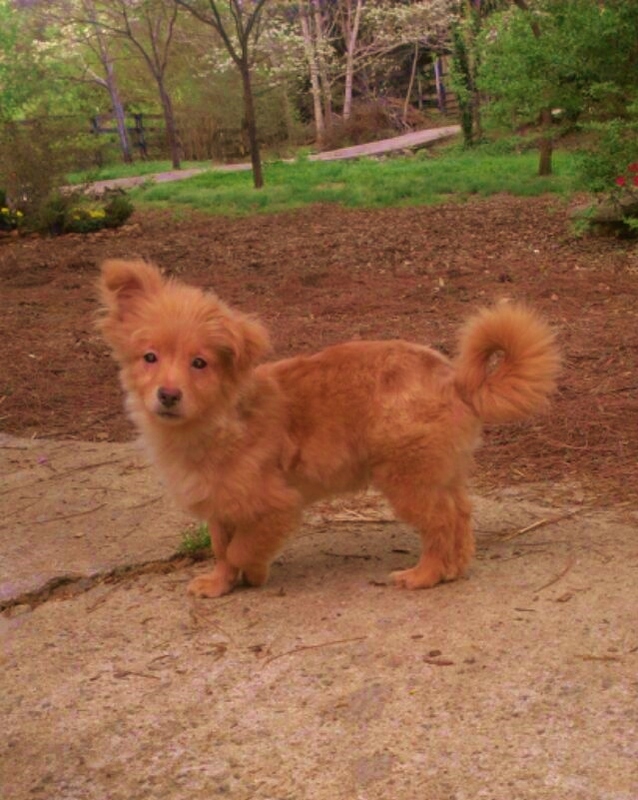 Wesley/Bobby will have a new sister pom to play with and a very nice home to live in! PROFILE: Known History with us. Wesley is a beautiful cream/white pomeranian boy estimated to be about-4 years old. He was picked up by animal control as a stray and no one came to claim him. His time was up and we were rescuing a poodle so we took the little guy into our program. He has a wonderful happy little personality and is potty trained. We will be neutering him soon but will show him to you before then. He has been acclimated to a home environment and gets along well with our other dogs. He weighs 12 pounds or less and is the size of a toy poodle. Won’t you welcome this little fluff boy into your life? 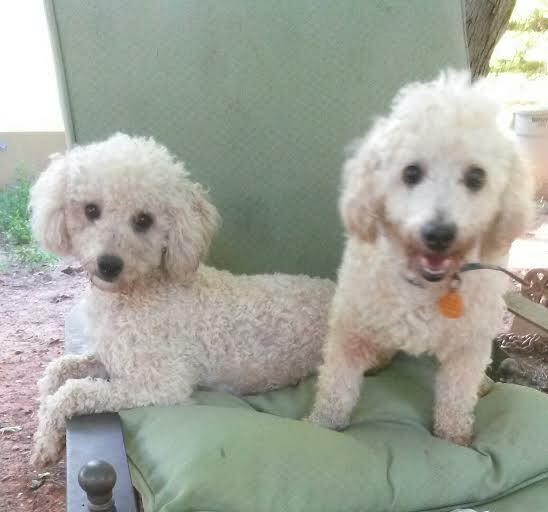 SUSIE-White Toy Poodle Girl – ADOPTED TO EMILY AND ADAM OF WOODSTOCK!!! PROFILE: Known history with us. 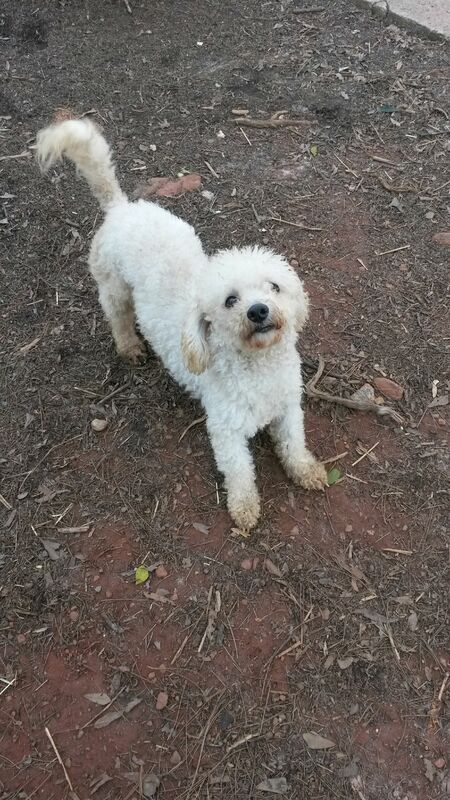 Susie is a darling young adult white toy poodle girl. She was found as a stray by a rural animal control facility near the TN border and we were called to take her into our program. She has a wonderful demeanor and loves to run and explore both indoors and outdoors. You must watch her while outdoors because she is very resourceful and has learned how to scale items and can climb a fence just to get to the other side to be with you. She wants to be with her person and is a very obedient and happy little girl weighing just under 10 lbs. PROFILE: Owner surrender and known history. Carla and Crystal are beautiful young golden cockapoo sisters. They were an owner surrender who wanted us to find them a home preferably together. They are about 2-3 years old, have a very sweet and trusting temperament and although a bit shy at first, their wonderful personalities come out once they get to know and trust you. Discount for adopting both together. 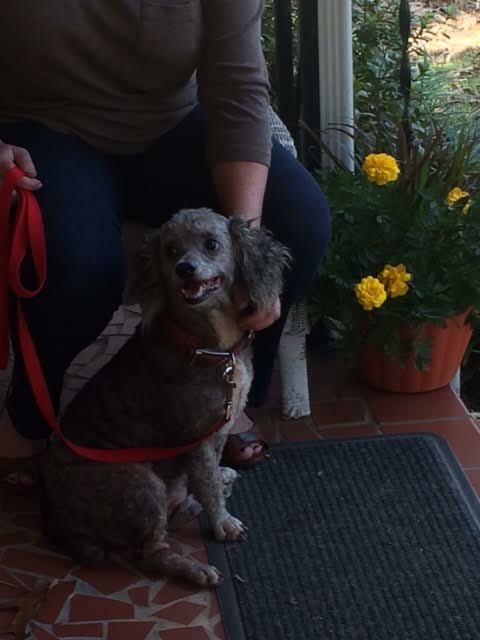 Carson – Toy Poodle Mix – ADOPTED TO GINA AND LEE OF ELLIJAY–REPEAT ADOPTERS!!! PROFILE: Known history with us. 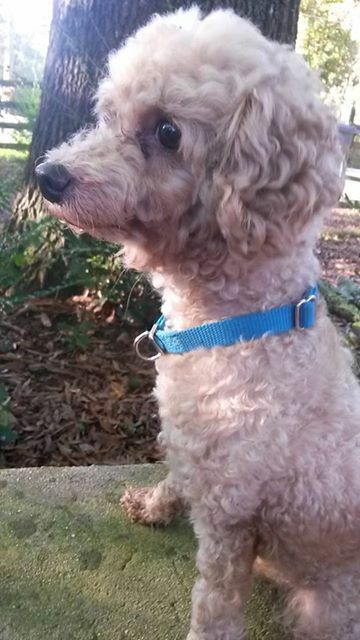 Carson is a very handsome light cafe au lait toy poodle mix. He is mostly poodle and has a natural feathery tail. He is approximately 1.9-2.9 years old as of July 2012 and we just neutered him, updated him on his vaccinations, and heartworm tested him as negative. His former owner died and the remaining family did not want Carson or his siblings so they dumped them at animal control. Carson is a very unique color and is a super cutie pie and loves to cuddle. Can he be your cuddle boy? DERBY – Cafe au Lait Labradoodle Boy – ADOPTED BY BETSY and PAUL OF MILTON! Congratulations to Betsy and Paul of Milton on their adoption of Derby the labradoodle! Derby will have a new labradoodle sister named Laney and three human brothers to play with in a very nice home and yard. 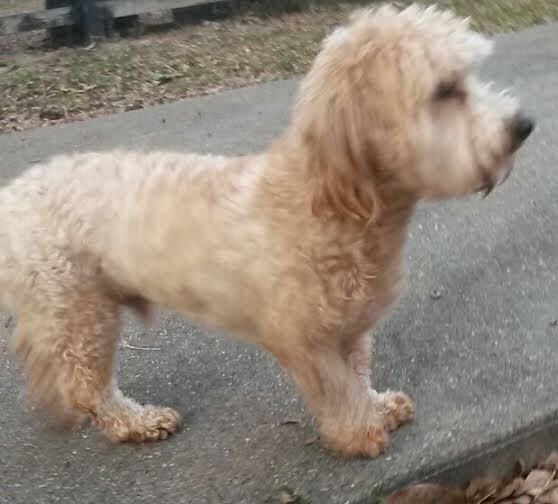 PROFILE: Derby is a gorgeous cafe au lait young labradoodle boy born 11/!2/2011. He has already received training, knows his basic obedience commands, is potty trained, knows how to walk on a leash, and gets along very well with other dogs of all sizes. His former owner purchased him from a breeder as a pup. He loves to play, play, play with other dogs. His former owner wants him to go to a home with a fence so he can run, play, and get the exercise needed for his large size. We have all of his vet records and he is neutered and up to date on his vaccinations. Derby has gorgeous deep amber eyes with a ring of light green in the iris, dark liver nose, and liver gums. He is waiting for you to give him a great home. CAMI AND CHESTER – GOLDENDOODLE BROTHER AND SISTER – ADOPTED BY CARA AND LEE OF HIGH POINT! Cami and Chester are two beautiful cream/golden colored goldendoodles. They are brother and sister one litter apart. Cami was born 11/3/11 and Chester was born 10/18/10. Their former family purchased them from a breeder and both Cami and Chester were great with their four young children and very loved but they wanted us to find a home for them where their new family will be able to devote the time needed for their exercise needs. Cami and Chester are very cute together and play very well together. They are happy and fun dogs who have that soulful look at you when you talk to them. ;Chester is large around 60-65 lbs and Cami is more of a moyen size weighing in the 40′s. We have tested them and they are able to be adopted separately if needed. They are waiting for their wonderful loving homes to take them home and love them and play with them. SUGAR – White Maltese Girl – ADOPTED TO AL AND GENEA OF ALPHARETTA!!! Congratulations to Al and Genea of Alpharetta on their adoption of Sugar the young maltese girl! Sugar will have a new maltese/shihtzu sister named Sadie Sophia. Both are around the same size and will have hours of fun playing with each other and their toys in their large back yard and doing squirrel patrol! Al and Genea have a wonderful home and yard and will be able to provide Sugar a wonderful, loving home and years of fun! 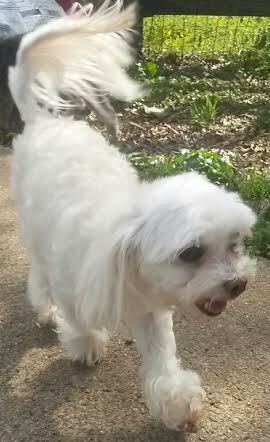 PROFILE: Sugar is a young white female maltese who was at a high kill animal control facility. 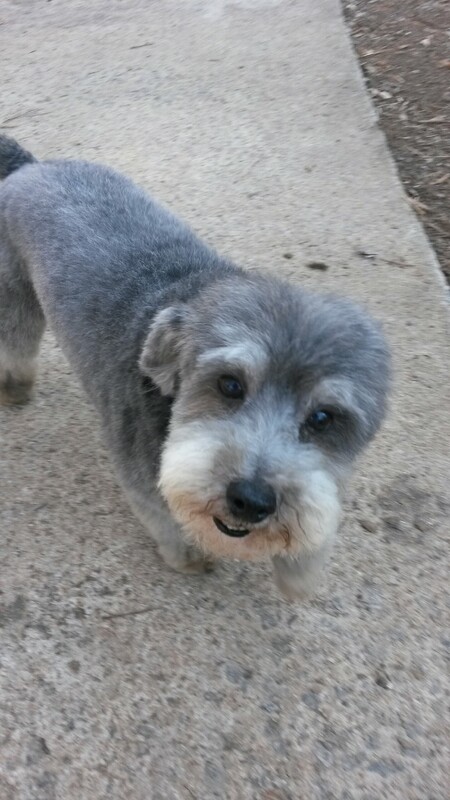 She was very matted when she came to us, we groomed her, and her hair is growing back very nicely. Sugar has a very sweet personality, gets along well with our other small dogs, loves to sit in your lap and be pampered. She is looking for her forever home who has the time to devote to this cute little girl. Pictures and more details coming soon! IVAN-Black Schnoodle Boy – PENDING ADOPTION!!! PROFILE: Known history with us. 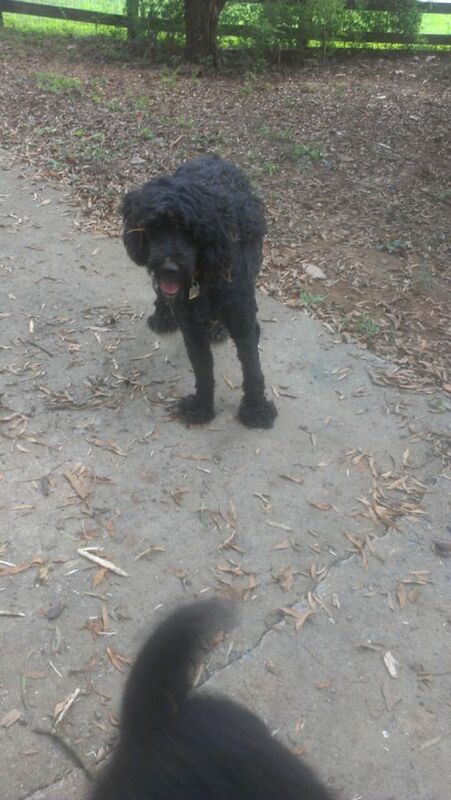 Ivan is a black miniature poodle about 2-2 years old. He was due to be destroyed at animal control due to a leg injury, however, we were allowed to intervene and take a chance on him. Voila! 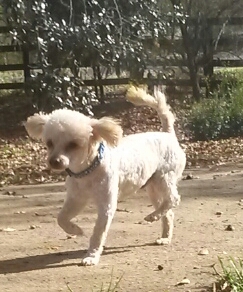 Since being at Georgia Poodle Rescue and receiving appropriate nutrition, love, and care in a home environment, Ivan no longer limps on his back leg and runs very fast when playing with the other dogs. He has a very sweet personality and a cute little bark, and when you want to pick him up, he will jump into your arms and place his head on your shoulder. KELLY-Black and White Female Havanese – ADOPTED TO PATTI & JIM OF SUCHES!!! PROFILE: Known history with us. Kelly is a beautiful young female black and white Havanese weighing about 15 lbs. We just spayed her. She was picked up as a stray by animal control in south Georgia. She has graduated from our training program and knows how to sit, down, come, stay for short periods of time, how to walk on a leash, is socialized with and knows how to play with other dogs and people. She is a very happy little girl and wants to be loved by someone who has the time for her. Can it be you? Pics 2 and 3 are pulled from a Havanese breeder’s web site so you can see that we think Kelly is a pure bred Havanese. She will make a wonderful companion who could give her the exercise she needs and also may be good at agility! 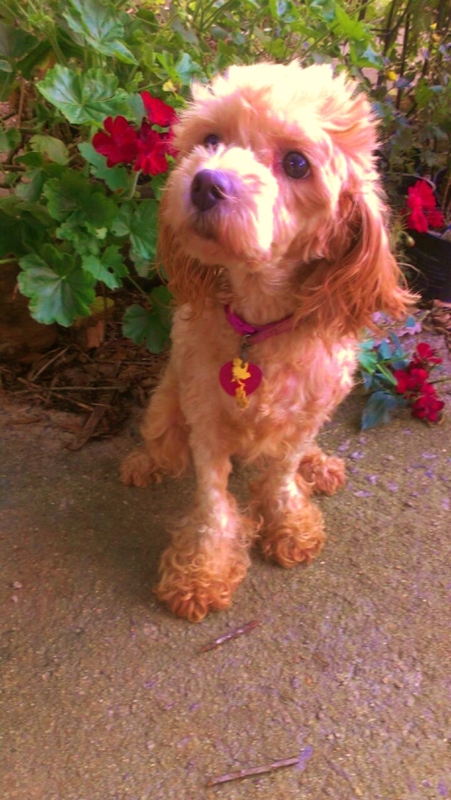 HEIDI – Toy Cockapoo Girl - ADOPTED TO DR. JEFF & WIFE LORI OF SANDY SPRINGS!!! PROFILE: Police Confiscation. Heidi is a beautiful 4 year old toy sized cockapoo girl. She has the cafe au lait caramel coloring with chocolate brown on her ears. She is a very calm and happy girl, is potty trained, very obedient and fun to be with, calm and playful. She was a police confiscation from her former owners and we brought her into our program to find her the wonderful home she deserves. She is a wonderful little girl and is ready to go to her forever loving home. 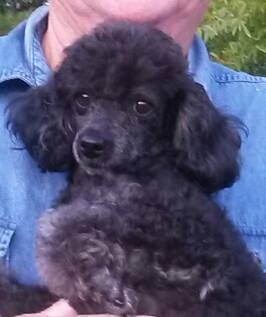 KIPLING-Blue Toy Poodle Boy – ADOPTED TO LINDA & HENRY OF MARIETTA!!! loves to be told he is a good boy, and loves to cuddle. 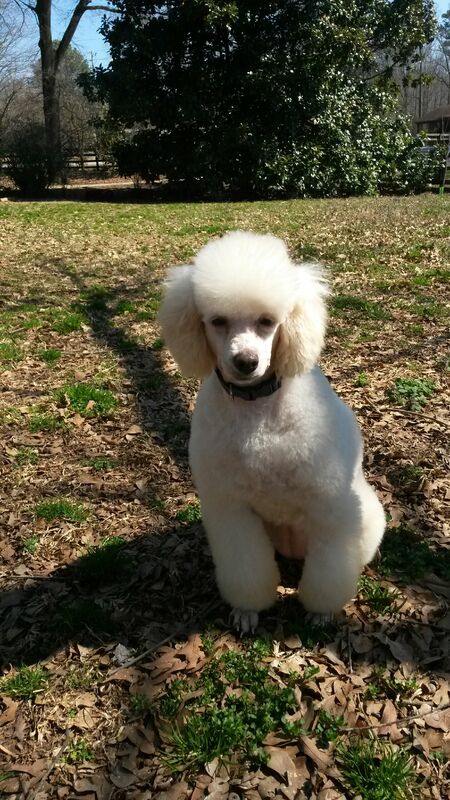 PRINCE-AKC-White Poodle Boy - ADOPTED TO BARBARA & MIKE OF MONROE! Congratulations to Barbara and Jim of Monroe on their adoption of Prince the white miniature poodle! Prince will have a new sister named Sascha to play to their hearts content in a very nice home and yard! Jim is retired from the government. PROFILE: Owner surrender and known history. 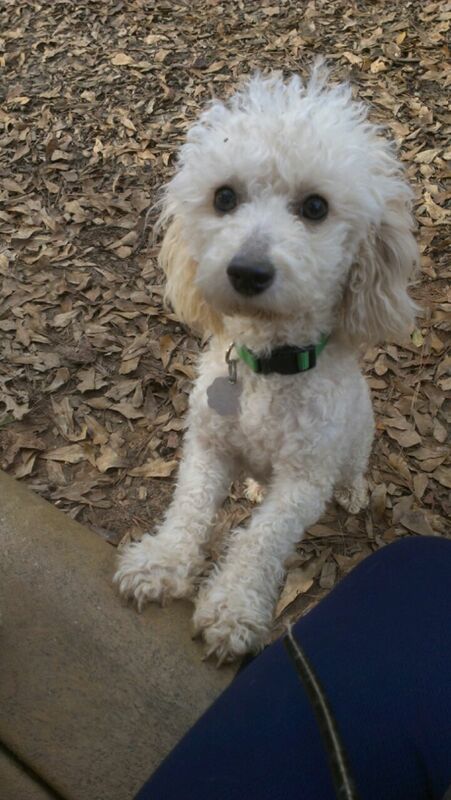 Prince is a beautiful young tall and lean white miniature poodle boy. He comes with his AKC certificate. He is one year old and weighs about 15 lbs. His owners purchased him from a pet store that went out of business. They did not have a fenced yard and wanted us to find him a home with a fenced yard so the new owners can love him and run around and play with him. He is a sweet little boy and is looking for his forever home. ZIP-Two Tone Silver Schnoodle Boy – ADOPTED TO GINA AND LEE OF ELLIJAY!!! PROFILE: Owner Sureender with Known History. Zip is a beautiful blue approximately one-year old schnoodle miniature poodle/miniature schnauzer mix-as of Sept. 2012). Look at his picture and his happy, smiling face. He has the beautiful light silver coloring on his legs and the dark silver coloring over the rest of his body. He has beautiful wavy/curly hair, a fun personality and likes to run and explore. He loves chasing the laser light or flashlight light. He gets along great with other dogs, he knows sit, down, come, and will stay for a very short period of time. His original owner was being deported and gave Zip (who was a young pup then) to someone who then gave Zip to someone in their office who was his recent owners. The recent owners cared for him as long as they could but they have an older dog who really doesn’t want to be bothered with Zip and Zip wants to play, play, play. They asked us to find him his forever home. He is a well behaved little boy looking for his forever home. Will that be you? 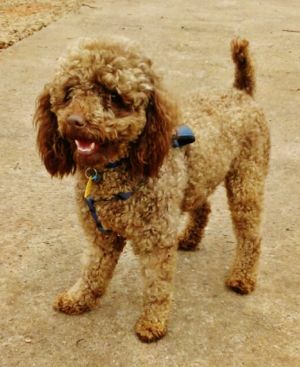 COCO-CHOCOLATE BROWN TOY POODLE BOY – AKC – ADOPTED TO MARLENA, ENRIQUE, AND ANTHONY OF SANDY SPRINGS! Congratulations to Marlena, Enrique, and Anthony on their adoption of Coco, the chocolate brown toy poodle boy! Coco will have a new human brother and a new doggy brother named Jasper to play, play, play with! When Coco’s new family met him, he was so excited that he just kept playing ball non-stop with them! He will be very loved, very well cared for, and very happy in his new family! PROFILE: Owner surrender-known history. Coco is a beautiful chocolate/cafe au lait toy poodle boy and comes with his AKC registration certificate, which has his AKC DNA number. He was born October 15, 2006. 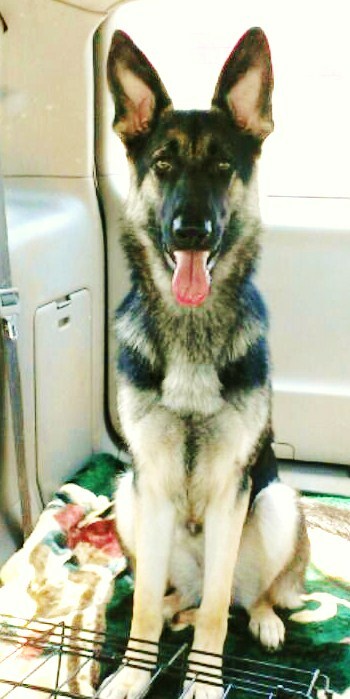 He was purchased from a breeder in FL, the family divorced and bought a german shepherd. They were concerned for Cocos safety so they asked us to find a good home for him. Coco is a well-adjusted and well socialized little guy who LOVES CHILDREN. He is so happy and absolutely loves to fetch and retrieve a full sized tennis ball over and over! He gets along very well with our other little dogs and he deserves a wonderful home. Wont that home be yours? CONGRATULATIONS TO BEVERLY OF NORCROSS ON HER ADOPTION OF SHADOW!!! 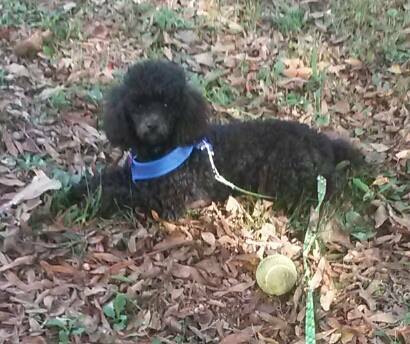 Congratulations to Beverly of Norcross on adopting Shadow the black toy poodle boy. 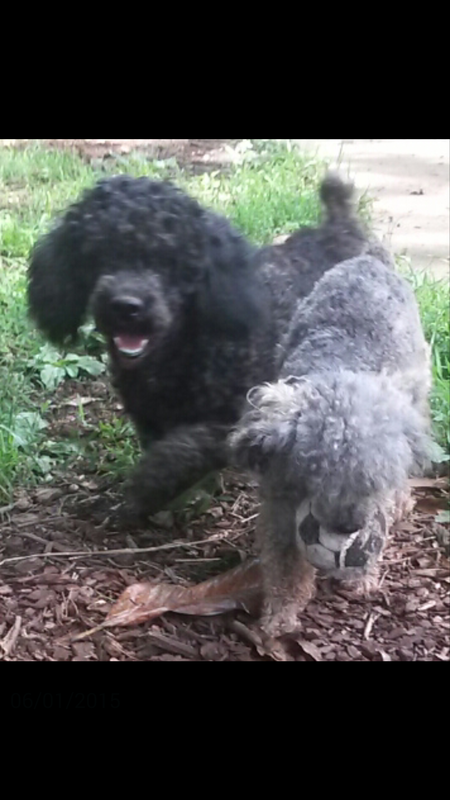 Beverly recently lost her black male toy poodle and when she met Shadow, he was almost identical to her other dog in looks, behavior, and personality. It was love at first sight. Shadow will be treated like the Prince that he is and will be spoiled by Beverly. He already has a plush bed, takes many walks, and rides in the car with Beverly as well as receives gourmet meals. The life of Riley! Beverly is in the real estate management industry and has the flexible schedule to spend many happy hours with Shadow. PROFILE: Owner Surrender-Known History. Baby, Daisy, and Shadow were surrendered from the same family who could not keep them because they lost their jobs, their home, and were moving into an apartment and could not afford to bring their beloved dogs with them. Sadly, they gave them to us to find them a home. Baby the white female bichon has been adopted. Daisy and Shadow are still looking for their loving new home. Daisy is a 2 year old female black/tan yorkie (as of 2/25/12), and Shadow is a toy male 3 year old black poodle (as of 2/25/12). They are all heartworm tested negative, updated on their vaccinations, with a 3-year rabies vaccine (not due again until 2015). All three are very well behaved, socialized, love to play and have very loving and happy personalities. This picture shows them in the van upon intake. Watch for new pictures of them newly groomed soon. CONGRATULATIONS TO MOUSIMI AND SOMESH OF ALPHARETTA ON THEIR ADOPTION OF SOPHIE (NKA GINGER)!!! 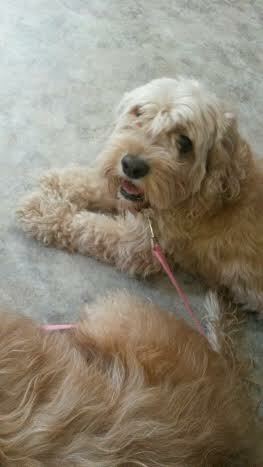 Congratulations to Mousimi and Somesh of Alpharetta on their adoption of Sophie the beautiful female cream cockapoo. At Sophie’s young age, she needs someone to stay home with her and give her love and attention. Mousimi is able to stay home with Sophie and spend much time with her and Somesh works from home several days a week and is able to do the same. They have a wonderful home and lush backyard where they could play with Sophie and treat her like a little princess. 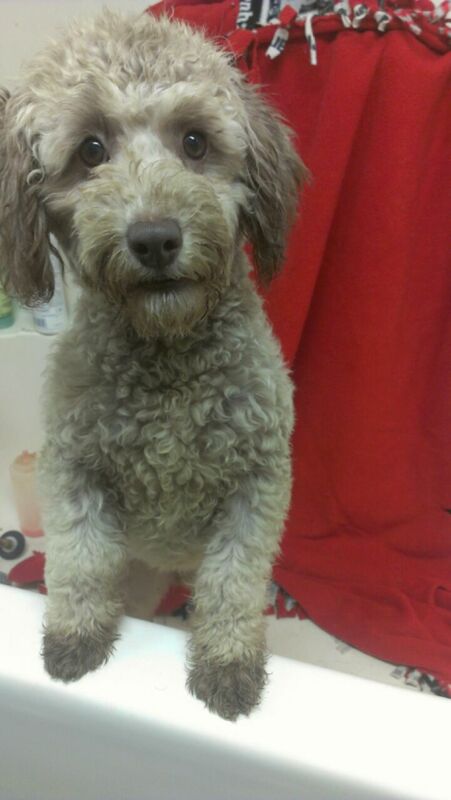 PROFILE: Sophie is a beautiful young cream cockapoo girl who was confiscated by the police, who then turned her over to animal control. We went to animal control to get her and have found her a new home shortly thereafter. CONGRATULATIONS TO TANYA, MARIE AND LUCY OF CANTON ON THEIR ADOPTION OF ROSIE!!! Congratulations to Tanya and her aunt Marie on their adoption of Rosie! Tanya is in the telecommunications industry and works from home several days every week and will have the time to devote to Rosie’s puppy needs and Marie will be able to fill the void when Tanya is not there. Rosie has a new sister named Lucy, who is a minature schnauzer. Both play very well together and make a great match. Lucy shares her toy box of toys with Rosie, which is great because as a puppy Rosie thinks if she sees it, it’s hers. Rosie will have a wonderful home, a plush bed, and a very nice yard to be treated like a little princess! PROFILE: Owner Surrender-Somewhat known history. Rosie is an approximate 10-week old toy or miniature chocolate phantom poodle girl as of 9/25/12. She was given to a groomer by a person who could not keep her and the groomer called us to find Rosie a good home. Rosie is potty trained, spayed, updated on her vaccinations, dewormed and fun, fun, fun! She is a brave little girl around other dogs both small and large and is very sweet and friendly. She loves to run really fast with her person and doggy friends across the lawn. Since we don’t know her parents, we do not know if she will be toy size or miniature size as an adult. Either way, she has the gorgeous chocolate and tan phantom markings and she will make a wonderful little addition to a great family or person who has the time to devote to a young pup. CONGRATULATIONS TO GALA AND HER MOTHER OF ALTO ON THEIR ADOPTION OF CANDI!!! Known history with us. Candi is a beautiful two-toned silver toy-sized dog weighing about 12-13 pounds. She was found as a stray by animal control. This little cutie pie is a beautiful silver and white toy-sized female spayed lhasa-poo and is about 6 years old as of June 2012. She has a wonderful personality, gets along and plays very well with the other little dogs and loves to be cooed over and cuddled by her person. She is very loving and loveable. Wont you open your home to this little girl and give her the love she deserves? BABY – BICHON – ADOPTED TO DON AND JOY OF WOODSTOCK!!! PROFILE: Owner Surrender and known history. Baby was surrendered with Shadow and Daisy because her owners lost their jobs and home and asked us to find all three very good homes. Their former owners took very good care of their dogs and we have vet paperwork and birth and registration paperwork. ARNEZ (now Desi)-AKC-ADOPTED TO AMBER, DANIEL, SOPHIA, AVA & MCDUFF (DOO DA) OF MARIETTA!!! Owner surrender and known history. Arnez is a beautiful black baby poodle pup with an undocked dail. He was born 2/15/12. He is very intelligent for his age, very cute, and a load of fun, fun, fun! His former owner was diagnosed with kidney failure and could no longer care for an energetic pup so he called us to find Arnez a good home. Arnez is potty pad trained and we are giving him training to potty outside. He is also learning his commands and this little guy is doing very well! Arnez was purchased from an AKC breeder in IL and we have his registration papers. He will be available once he is neutered but we can show him to you. BEAR - ADOPTED TO HELENA AND DAVID IN PEACHTREE CORNERS/DULUTH!!! Congratulations to Helena and David of Peachtree Corners/Duluth on their adoption of Bear, the cream standard poodle boy. We brought a few standards over to meet Helena and David and Bear just made himself right at home and plopped himself down on the comfortable doggy bed. David works from home as a contract manager in the IT industry and Helena also works in the IT industry. Max will have a big house and a big yard to play with his new mom and dad in and will be showered with love, hugs, and kisses. PROFILE: Owner surrender and known history. 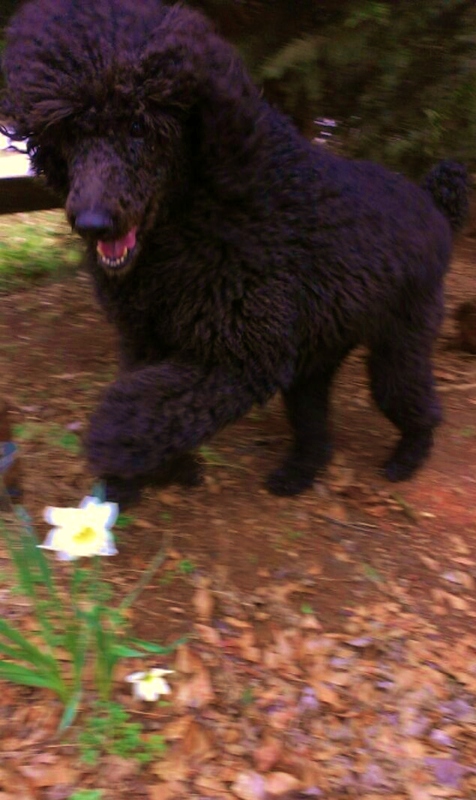 Bear is a young white male standard poodle who was born June 2011 and purchased from a breeder in GA. He knows his commands, how to shake, is potty trained and walks well on a leash. His former owner asked us to find him a great home. Bear is gentle and playful and is looking for his forever home where he can run around and play with you and maybe even other dogs. Won’t you give him the home he deserves? MONIQUE (now Pippa) - ADOPTED TO SONNIE IN ALPHARETTA!!! Congratulations to Sonnie in Alpharetta on her adoption of Monique the Maltese. Monique now has the name of Pippa and absolutely loves the pampering and the new lifestyle that Sonnie gives her because it is that of a little princess! Sonnie is retired from the nursing industry and will be able to spend all her time on her new little fur princess daughter! PROFILE: Monique is a young white female maltese we saved from a high kill animal control facility. She is estimated to be between 1-3 years old. She is a darling and is very cute, loves to cuddle, and follow her people around. She is due to be spayed soon. MAX – ADOPTED TO LY AND QUANG IN SUWANNEE!! Congratulations to Ly and Quang and their children of Suwannee on their adoption of Max the cream standard poodle pup! 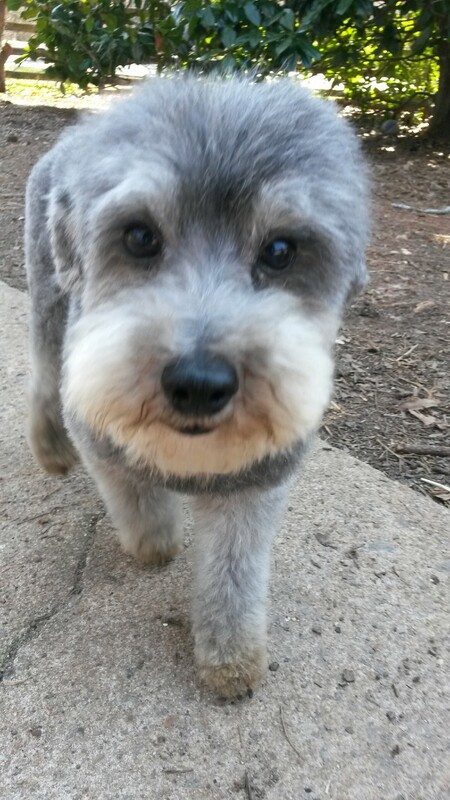 In addition to Max’s new parents, Max has a new human brother and sister and a new schnauzer brother. Max has a wonderful new backyard and home to play in and Ly can spend one on one time with Max while the kids are in school. Max is loved and cherished in his new home. PROFILE: Owner surrender and known history. 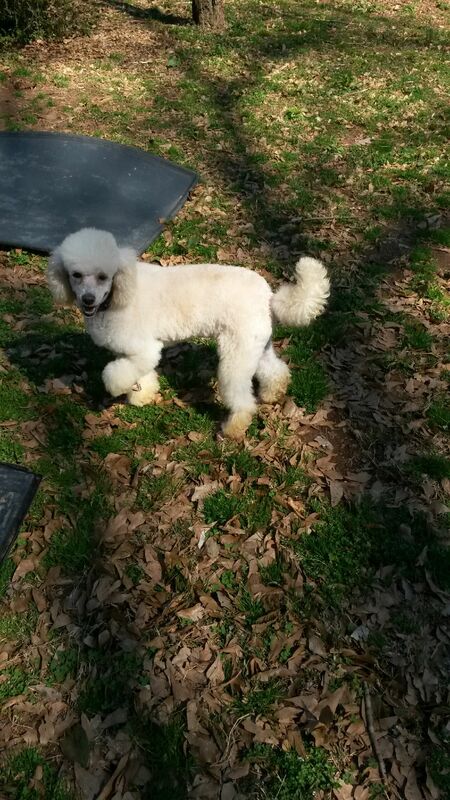 Max is a very handsome young white/cream standard poodle boy who has a charming personality. He was born October 3, 2011, and is eight months old as of June 2012.His former owner had young children and didn’t have a fenced yard for Max to play in and they wanted us to find Max a wonderful home where he could run around and play in a fenced-in area. Max was purchased from an AKC breeder but we do not have his AKC certificate. He loves playing with other dogs, is very obedient, loves to be pampered and is waiting to find his forever home. COOPER-AKC – ADOPTED TO SANDY AND ROBERT IN FLOWERY BRANCH!!! Congratulations to Sandy and Robert on their adoption of Cooper, the teacup toy poodle boy. When we brought Cooper on the home visit, he just won over their hearts and it was instant love. Cooper pranced his high stepping walk around the house and just cuddled right into their arms. He will be treated like the prince he is and they will give him a very good life. Robert is in procurement in the trucking industry and manages the trucking fleets and Sandy is in procurement in the gas and particle analyzer industry that deals with particle sizing and building instruments. PROFILE: Known history with us. Cooper is a cute and cuddly light apricot toy poodle boy, weighing 8 lbs on 11/25/11. He was born 7/12/09 and we have his AKC registration papers. He was dumped at a rural high kill animal control facility by his owner because she couldn’t potty train him and she didn’t socialize him so he did not know how to play with other dogs. Alll that has changed now. We potty trained Cooper the first week we had him, worked our magic with him, and a wonderful and happy little playful personality emerged! This little boy is a darling and loves to cuddle and will stand on his back legs, smile at you, and reach out for you to pick him up and sometimes even jump into your arms with a big smile on his little face! He is not whiny or nippy at all. We have vetted him, he is UTD on his vaccinations, he is heartworm negative, and he is waiting for you to take him home to a life of pampering and love. CLAIRE – ADOPTED TO ELIZABETH AND DAVID OF ALPHARETTA! Congratulations to Elizabeth and Dr. David on their adoption of Claire, our tall white standard poodle girl. Both Elizabeth and David have many years of standard poodle experience and will be able to provide Claire a wonderful home! Claire will have another standard poodle, a little schnauzer, and two beautiful cats as her new brothers and sisters in her new home! PROFILE: Known history with us. 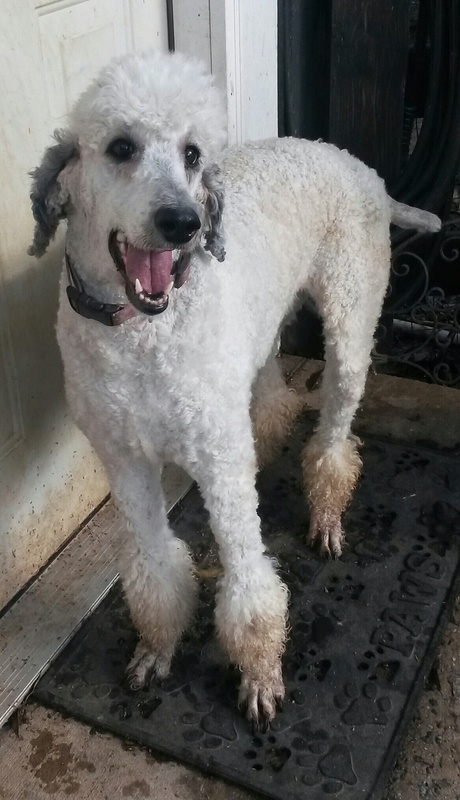 Claire is a beautiful white female spayed standard poodle girl. She is very sweet and was found as a stray and then turned into animal control. We were contacted to bring her into our program. Claire is very loving and sweet. MERLOT (now Penny)- ADOPTED TO KIM AND DAN IN DUNWOODY/SANDY SPRINGS!!! Congratulations to Kim and Dan of Dunwoody on their adoption of Merlot! Merlot will have a new doggy sister, a blonde doodle named Molly, and two new human sisters to run and play to their hearts content in a very nice home and yard! PROFILE: Owner surrender and known history. Merlot is a beautiful chocolate wine colored young female smaller standard sized labradoodle just over one year old as of January 2012. She was an owner surrender due to Merlot not being trained . She was purchased from a breeder iin another state. She was very wild when she came to us but now is a very sweet girl who loves to run outside and play, play, play with her person and other dogs. BOSCO VON THUNDER – AKC – ADOPTED IN BALLGROUND!!! Congratulations to Dr. Diane, DVM, and her husband, who adopted Bosco, our wonderful german shepherd dog! Dr. Diane has owned german shepherds since 1984 and recently lost one of hers. When she saw Bosco and when we brought Bosco to meet both her, her husband, and their other dogs, it was instant love! Bosco will go to work with Dr. Diane and also has a very large back yard to run and play with the other dogs. Dr. Diane also owns a dog training school. Bosco was so excited to see Dr. Diane again at the adoption that he stood up, put his paws on her shoulder, and gave her many kisses! Profile: Owner surrender and known history. Bosco is a beautiful, well adjusted, fun and playful german shepherd boy who was raised in a loving family. His former owner is traveling back and forth to another state and can’t give Bosco the time he needs, so we were asked to find him a loving home. The former owner has had Bosco since a pup. Bosco knows how to sit, stay, come, and we are working on the down command and not pulling on a leash. He is doing well with that. We are training him in both german and english commands and have him instantly obeying the come command as he flies across the yard and goes into the down position in a few seconds. He is such a fun dog to work with! We have his three-generation AKC pedigree. Before he is adopted, he will be neutered and updated on his vaccinations. BABY SHIRLEY ADOPTED TO KEITH AND MARY OF ATLANTA!!! Congratulations to Keith and Mary on their adoption of Baby Shirley (now Coco). Shirley will have a new maltese sister and both will travel with their parents to their many homes in Georgia and Florida! They have a beautiful home and wonderful yard and when Shirley met them she made herself feel right at home! Mary actually was on the floor playing with Shirley and Shirley decided to walk right on Mary and snuggle up with her! Both are in the health and the real estate industries and will be able to provide Shirley a wonderful life! PROFILE: Shirley is a young chocolate spayed poodle about one year old who’s former owners developed medical problems and could no longer keep her so they asked us to find her a good home. They originally purchased Shirley at a yard sale and the person was selling her because they could not afford to keep her. SOPHIE-ADOPTED TO NEILYA AND JAMES IN LAWRENCEVILLE!!! Congratulations to Neilya and her husband James of Lawrenceville on their adoption of Sophie, the toy poodle girl! Neilya and James recently lost their toy poodle Casey and Sophie and her circumstances reminded them in so many ways of Casey that they had to meet her. Sophie worked her cute little cuddle and talking act and won them over! Sophie will have a new sister named Mimi, who is a silver toy poodle girl. They both will be the spoiled princesses of the house and are in a very loving home where they could receive non-stop attention! Profile: Owner surrender and known history. 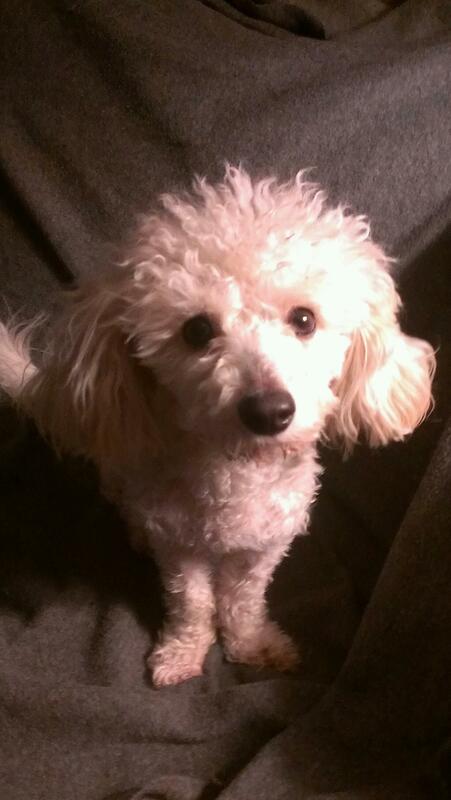 Sophie is a beautiful white female larger toy poodle about 4 years old who was purchased from a breeder. Her former owner, an elderly woman died, and a relative rescued Sophie from being sent to the pound but she already had four german shepherds so she asked us to find Sophie a good home. Sophie is very cuddly, likes to sleep with you, sit on your lap or next to you, and likes to be with you and will follow you like a true poodle. She is the perfect lap dog but will let you know that she is still there so you dont forget about her.. Sophie gets along with practically anyone and even likes cats. DORSEY (NOW WILSON) – ADOPTED TO STAN AND CAROL IN LAWRENCEVILLE!!! Congratulations to Stan and Carol of Lawrenceville on their adoption of Doresey (now Wilson) the bichon-poo boy! When Dorsey came to their home to meet them, Stan and Carol were amazed and pleasantly surprised how polite, cute, fun and well behaved he was! And Dorsey just loves his new mom and dad who are teachers, one recently retired, and one soon to retire so they will be able to give Dorsey lots of attention. 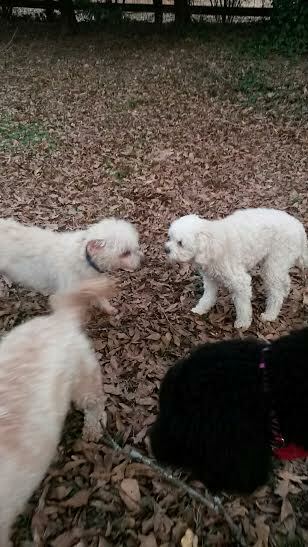 Stan and Carol recently lost their bichon and they just had to meet Dorsey. We are all glad they did. Dorsey will have a large back yard to run around, play, and explore in as well as non-stop love and praise from his new mom and dad! Profile: Owner surrender and known history. Dorsey is a very cute litttle bichon-poo born around 11/8/10. He was found wandering the busy streets not far from his home. Neighbors kept returning him and finally the owner said to take him! One of the neighbors is a veterinarian and called us to take him into our program. Dorsey is a happy little guy who has a perpetual smile on his face. He has an easygoing personality and is not hyper in the least bit. He loves to be with his human and will make a wonderful companion for that special someone. LOIS (NOW LUCY) - ADOPTED TO MARYBETH AND BARRY IN NORCROSS!!! Congratulations to Marybeth and Barry on their adoption of Lois (now Lucy). Lois will have a new doggie brother and a big backyard to run in. Lois won Marybeth and Barry over when we brought her on a meet and greet at their home. Marybeth and Barry are consultants and have the time to give Lois a very happy home. Profile: Known history with us. Lois is a beautiful young blonde terrier mix, maybe with a touch a poodle in her. She has a marvelous, cute, laid back personality and loves to smile and cuddle and play with her person. She is a unique blonde color with a small white bib and has a gorgeous liver colored nose, light brown eyes, and liver colored gums. Her hair is super soft and she has not shed with us. She was found as a stray by animal control and we took this little girl in to find her a good home. MACY (now Padme’) - ADOPTED TO MARIA, TUCKER, & CHILDREN IN JOHNS CREEK!!! Congratulations to Maria, Tucker, Tucker II, Gunner, and Emmy on adopting Macy (now Padme’) the silver labradoodle girl! Macy’s former owner wanted us to find her a family with children to play as she loves children. That we did……..the perfect family for her and she for them! Macy has a large yard to run around in and play ball with the children and her new parents and all love each other very much and are very happy! Maria is a photographer and Tucker develops animal behavior software. Profile: Owner surrender and known history. 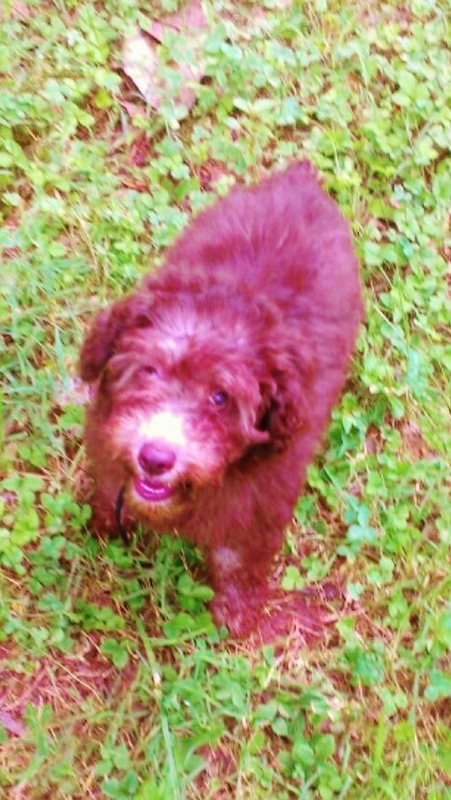 Macy is a gorgeous silver female labradoodle born July 4, 2008. She just turned four years old. Her former owner’s mother was in cancer care in another state and he found himself driving back and forth. He wasn’t able to bring Macy with him and didn’t think it was fair to leave her alone/board so much and he wanted a good home found for her. We have evaluated Macy and she is a loving, beautiful, well behaved dog. She knows her commands, she loves to snuggle, and she loves balls. She is looking for her forever, loving home. Brie, Cody, and Zoey-Poodle Mixes Adopted TO CARRIE AND BILL OF POWDER SPRINGS!!! Congratulations to Carrie and Bill of Powder Springs on their adoption of Brie, Cody, and Zoey, the teacup havapoo mixes. All three little sweeties made themselves right at home in Carrie and Bill’s house and felt very comfortable with them and vice versa that we knew it was a great fit. Brie is a teacup toy blue merle havapoo. Her owner surrendered Brie together with her black and white sister Zoey and her blue merle brother Cody and wanted us to find someone who could spend more time with them. Brie and Zoey are under two years old and their brother Cody is less than one year old. All are sweet little teacup toy dogs who love to be with their people, cuddle, and play. Profile: Brie is a teacup toy blue merle havapoo. Her owner surrendered Brie together with her black and white sister Zoey and her blue merle brother Cody and wanted us to find someone who could spend more time with them. Brie and Zoey are under two years old and their brother Cody is less than one year old. All are sweet little teacup toy dogs who love to be with their people, cuddle, and play. Wendy-B/W Poodle Mix Adopted to Scherry, Jerry, Lois, and Beth of Nicholson !!! Congratulations to Scherry, Jerry, Lois and Beth of Nicholson on their adoption of Wendy the beautiful black and white miniature poodle mix girl! Wendy won their hearts over when we brought her to the meet and greet and will have a wonderful home and great fenced yard to play and explore in. All will be able to provide Wendy with lots of love and affection. Scherry is in the education profession. Wendy is a beautiful black and white poodle mix with large waves in her hair. She is about one year old as of June 2012 and weighs about 15 pounds. She was picked up by a high kill animal control facility. She was spayed and updated on her vaccinations. She had a broken bone in the past but is now healed and running around very fast thanks to the bone specialist we brought her to for eight weeks in a row. Wendy is highly intelligent and loves to be played with and pampered. She loves other friendly dogs and is waiting for her forever owner to bring her to her new home. 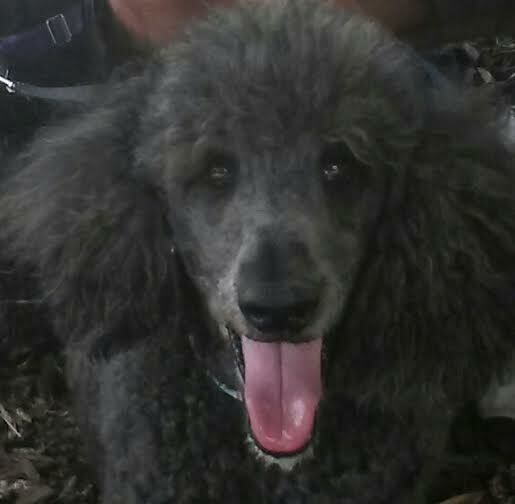 Cassanova-Standard Poodle Boy Adopted to Atty. David in Midtown Atlanta!!! Cassanova to give him the good life he deserves. Cassanova will be sporting a Mohawk real soon. Watch for more pics. Fenix-Black Cockapoo Boy Adopted to Victoria & Timmy of Decatur!!! Congratulations to Victoria and Timmy of Decatur on their adoption of Fenix the black cockapoo boy. Both are very experienced dog owners and all fell in love instantly with each other. Fenix just loves fetching and retrieving the ball with them and could do it non-stop all day long. They will be able to provide Fenix with a great home and lots of love and play both inside and outside! Victoria is in the health profession and Timmy is in the medical profession. Olivia-Cafe au Lait-Standard Poodle Girl Adopted to Eric & Gwen of Milton!!! 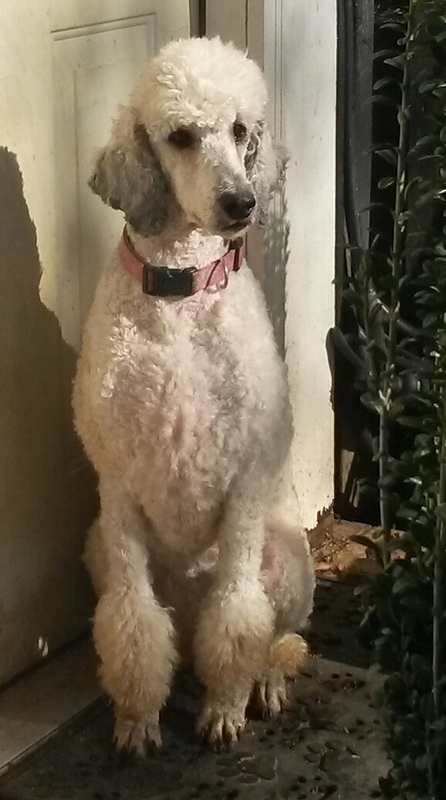 Congratuatlions to Eric and Gwen of Milton, GA, on their adoption of Olivia, the cafe au lait standard poodle girl. Gwen is in the health profession, is recently retired, and has the time to devote to Lady Olivia. We knew it was a great fit when Olivia walked over to Gwen and put her head in her lap and looked into Gwen’s face. Olivia loves both Gwen and Eric and she will be given a wonderful life, a great back yard, and lots of love. Reuben-Red Toy Poodle Boy Adopted to Rhonda & Randol of Acworth!! !